Growing up with all four seasons, I shouldn’t have been so surprised by how much winter in the Valle de Elqui would affect me. 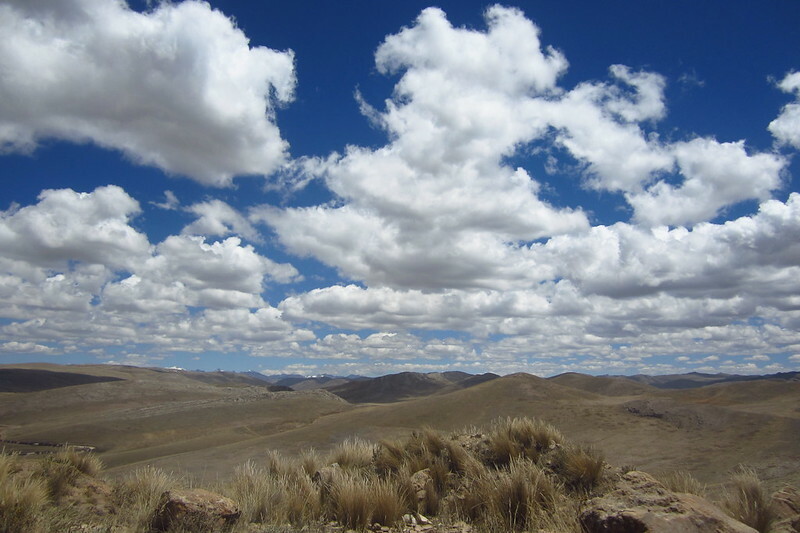 After all, I fled the brutal, snowy winters of New England for the desert climates of northern Chile. In Boston, you are able to escape inside to central heating and (mostly) insulated walls and windows; not so much in the Valle de Elqui. When winter’s chill sets in, it creeps into your bones. Just like a dog, I would sit out on a warm rock by the river to absorb the few warm rays of sunshine before the sun dipped behind the mountains of the valleys and the cold came back full force. Unlike in the US, where you can sprint from heated building to heated building and keep a decent level of productivity, the cold of northern Chile made me want to hide under the covers all day. When I had to get work done, I parked myself next to the space heater, wrapped in a blanket, alpaca shawl, and wool handwarmers, drinking mate. These dramatic day and nighttime temperatures jarred me into living by the seasons again, recognizing that each moment is temporary, noticing how my energy ebbed and flowed between seasons. 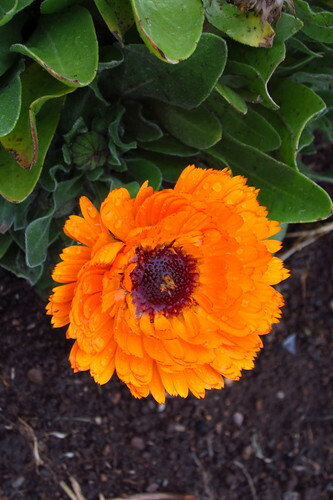 By midwinter in July, I was exhausted, mentally, physically, and spiritually. I was ready to escape to Guanaqueros. At this halfway point in my year living and working in the Valle de Elqui, the old was dying out in order to make room for the new. The eagerness and anticipation of a new job and new style of life had faded as things got real. Like so many international teaching programs, there was lack of clarity between the two organizations I worked with. Like so many families, my host family faced a medical challenge that dominated our home life. Like so many city dwellers, I was shocked by the inconsistent internet connectivity in the mountains. Boy, did I learn to adjust expectations. So when I planned our mid-year retreat to check-in, evaluate, and set goals for the second half of the year, I knew we had to head to the beach. The open ocean and gorgeous seaside scenery was going to serve us well. En route to Guanaqueros from Coquimbo, we started appreciating the long coastline with its sharply descending cliffs and sparsely populated beach resort villages. The Pacific beckoned to us with blue waters and clear blue skies. 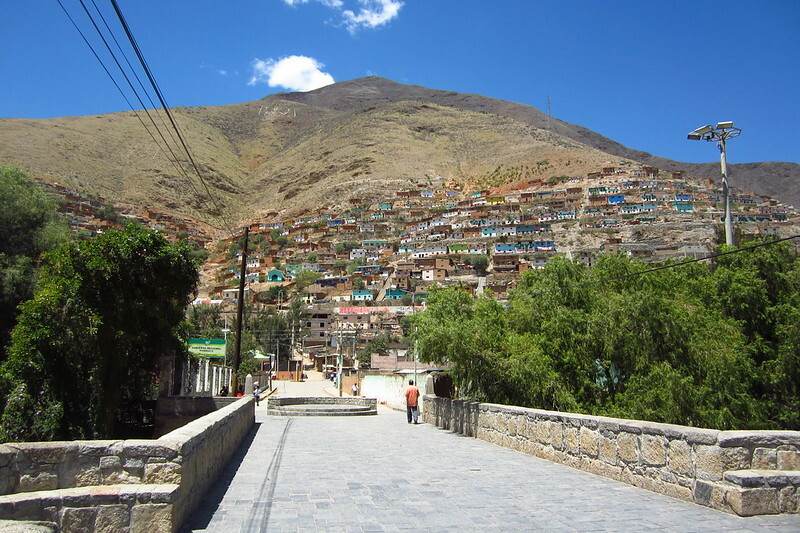 Arriving in Guanaqueros, we were thrilled with how tranquil the village is. 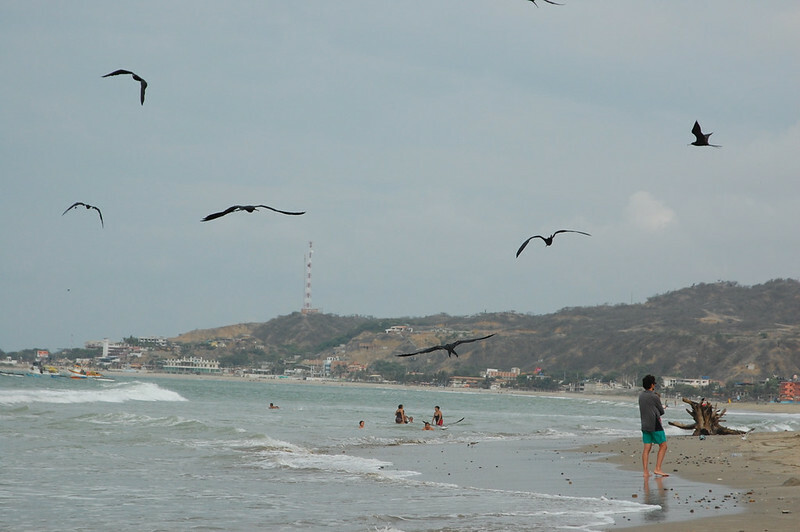 During high season in the South American summer (December to February), the beach would be packed. But midwinter we were nearly the only people strolling along the sand. Leaving the desert mountains for a bit, we needed to just listen to the sound of the waves crashing on the beach and feel the sun starting to melt away our stress from so many recent changes. After living in San Diego and Lima, I know how important the ocean is to restoring my peace of mind and I seek it out whenever possible when I need to settle my thoughts (exhibits A, B, C, and D!). Our visit happened to coincide with the 2015 Copa América championships, which meant that people were mostly glued to their TV, rooting for Chile’s selección to win. 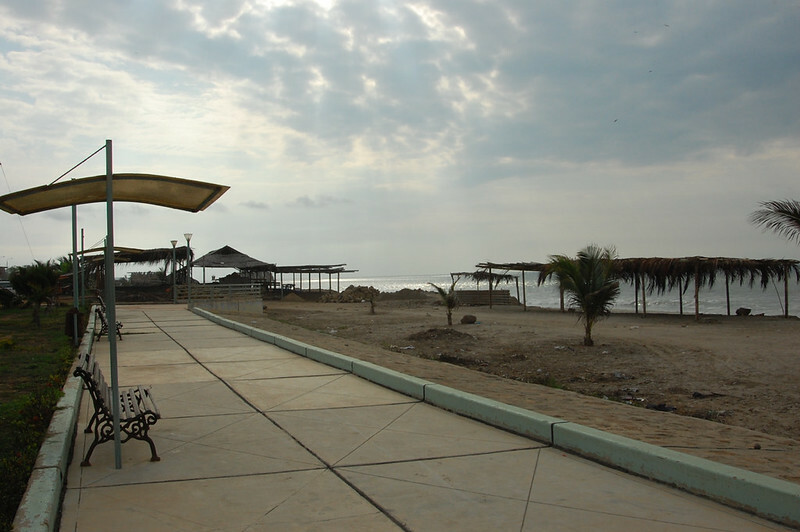 Because Guanaqueros is so small, the services for travelers are all situated along the main road. 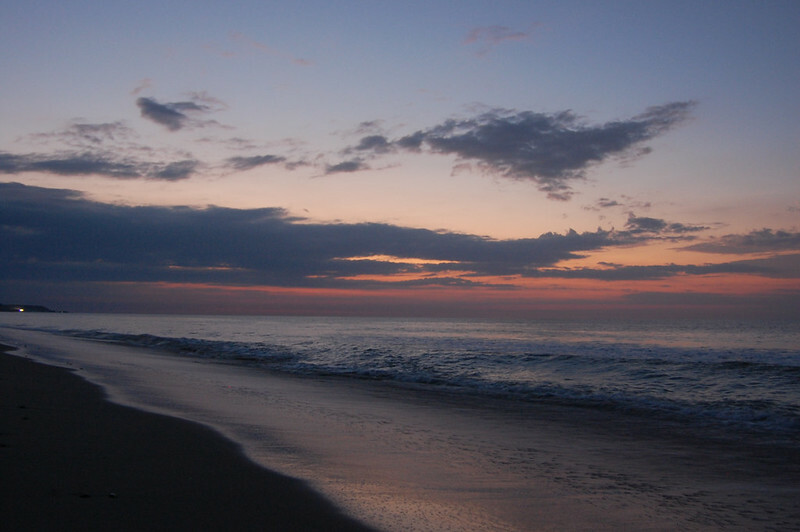 Restaurants, small convenience stores, and lodging are all within walking distance of the beach. 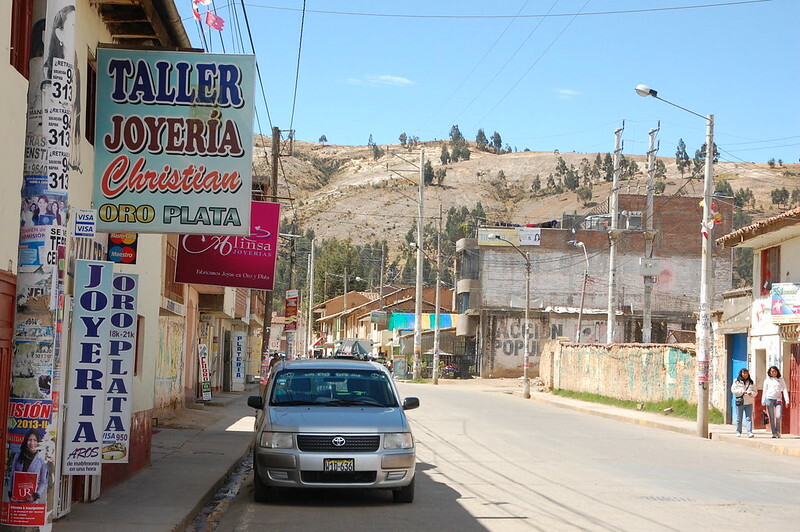 Because Guanaqueros is a town geared towards Chilean travelers, most of the lodging options are “apart hotels,” small apartments with kitchens and bunk beds. Most Chileans travel with their extended family or with their friends and their families and cook many of their own meals. For the fish-lovers, Guanaqueros has a number of restaurants dedicated to serving up the freshest food, but as a vegetarian, I opted for this amazing fresh salad (with the ever-present papas con mayo) and a giant empanada. Although we came to Guanaqueros to get work done, we decided to hold several of our sessions while walking and talking on the beach. 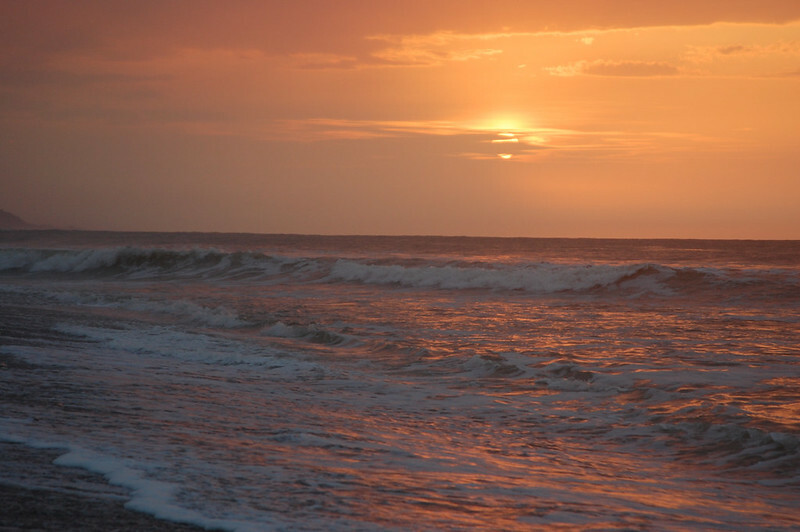 You can’t miss the opportunity to see a beautiful sunset over the ocean when you get it! 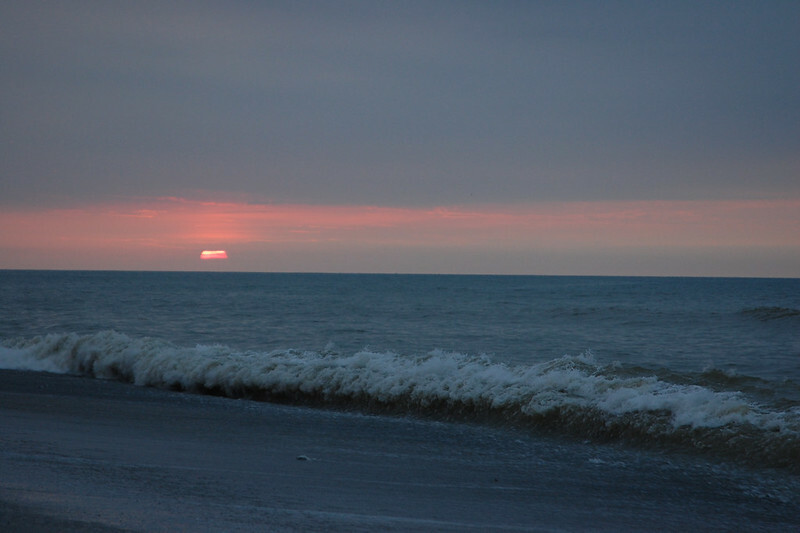 The skyline turned pink as the sun disappeared behind the hills, creating a beautiful glow that reminded me of the amazing sunsets I experienced in Tortugas in northern Peru and on Easter Island. What we needed most at this mid-winter moment was to connect – to connect with the country beyond our tiny towns in the Valle de Elqui, to connect with each other outside of our normal routines, to connect with the moment through our experience of nature’s beauty. 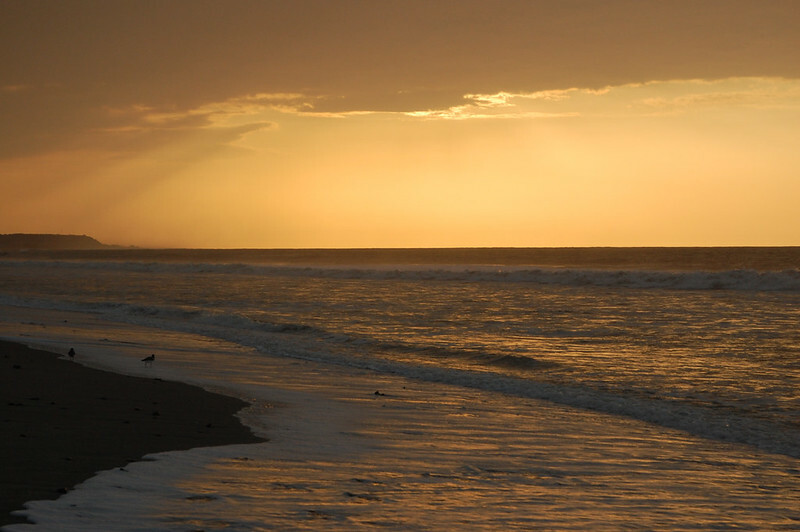 I mean, what’s better about being in a town where all there is to do is walk along the beach and watch the sunset. That’s serious relaxation – when there is literally nothing else to do, you appreciate the views so much more. Although I’ve managed to capture many moments of my year in Chile, this one happened to slip by me. But I think it serves as a nice metaphor for what I’m feeling right now, waiting for spring to finally arrive after a long, snowy winter in New England. It’s normal to get quiet, go within, disappear for a bit as the days get shorter and the cold gets deeper. But there comes a moment when you see the light at the end of the tunnel and you start feeling that stir within, setting new goals, moving forward. It’s taken me several stints living abroad to understand that I need lots of time to process my experience, to appreciate everything I went through, and especially how much I learned from creating new routines, perspectives, and relationships while living in another culture. Back when I used to shoot film, the process of developing the photos took some time and required patience. No instant gratification like today; instead, I found myself reliving my trip when I received my prints, organized them in my photo album, and finally shared them with friends. Maybe that’s why I like revisiting my photos a year or two later, when I’ve had time to integrate the memories, and I can appreciate the emotion coming through. For us, Guanaqueros marked the halfway point of a crazy year, and we left with renewed energy and optimism for what lay ahead. And what do you know? Things got significantly better as we moved into a new season, taking with us all the lessons we learned, and leaving behind anything that was weighing us down. Maybe you’re not looking for a transformative beach experience (but let’s be honest – beach escapes are always about transformation!). 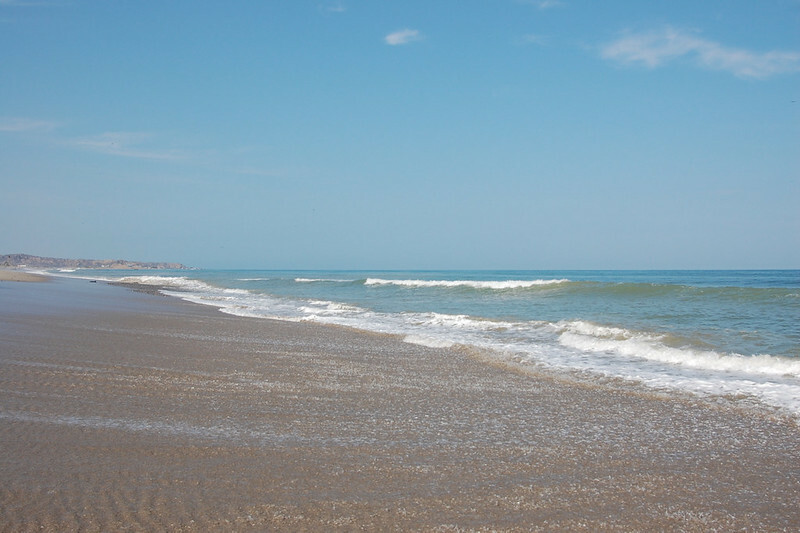 You should still make an effort to get to Guanaqueros if you’re spending any time in La Serena during your trip around northern Chile – the seaside views and low-key vibes are worth it. 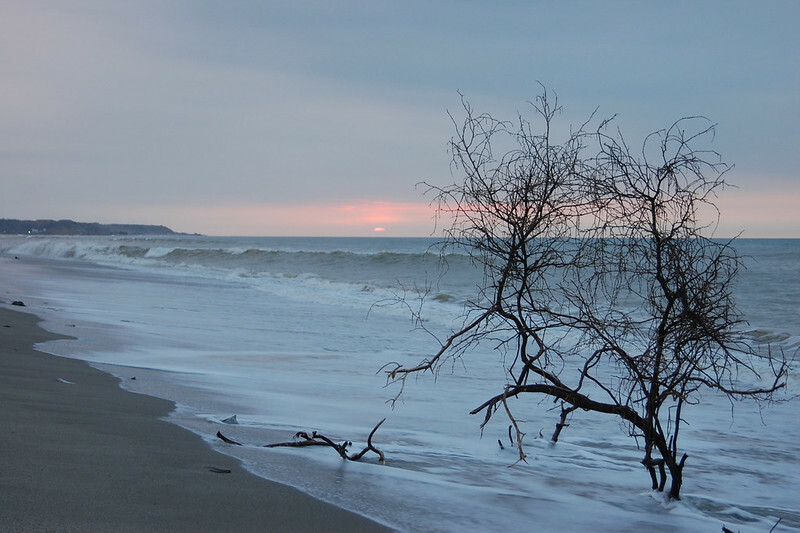 If you’re looking to truly experience the seaside vibe of this part of the Chilean coast, skip the urban beaches of La Serena and Coquimbo and head to Guanaqueros. 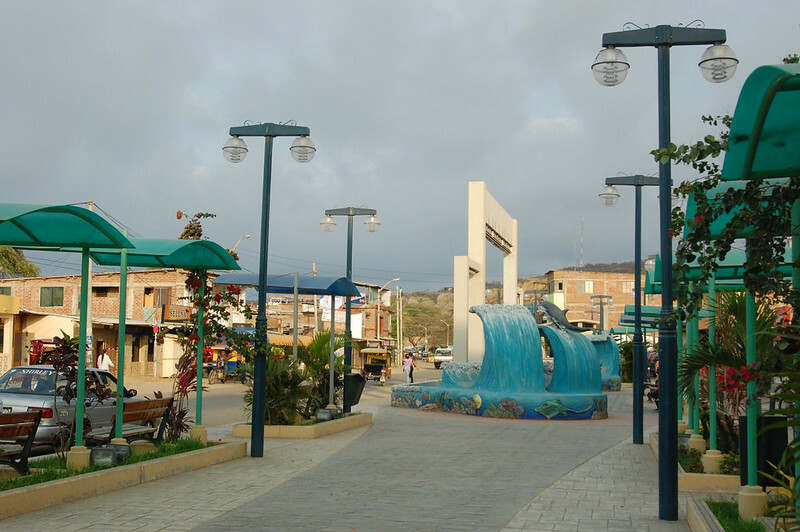 To get to Guanaqueros, head to the bus station in Coquimbo and then look for the buses to Tongoy and Guanaqueros or get a colectivo (shared taxi) to Guanaqueros. The shared taxi should cost about CLP$2500 per person. Guanaqueros is a fishing cove located down the cliffs to the beach, so en route you’ll experience amazing views of the ocean – have your camera ready! Guanaqueros has several small stores where you can buy snacks, wine, and other supplies, but if you anticipate cooking a lot, you probably want to go shopping in La Serena or Coquimbo. 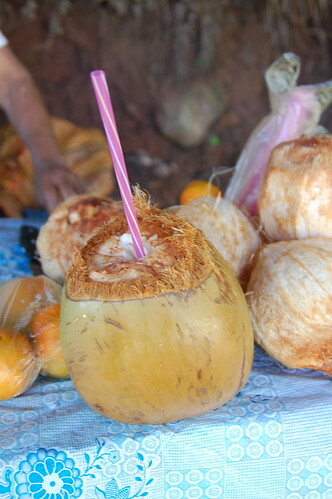 For food, there are several restaurants, but the best option is probably the market with several food stands, where food is fresh and inexpensive. I recommend staying in Hostal Akitespero, which has a very friendly owner and comfortable mini apartments with kitchens. 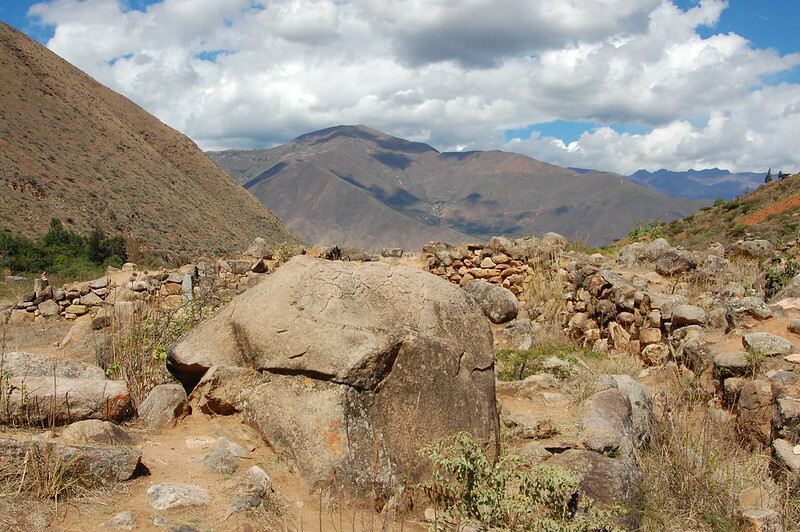 When I first arrived in Huánuco, I had one main goal: I wanted to visit the ruins of Kotosh and learn what I could about this very ancient archeological site. 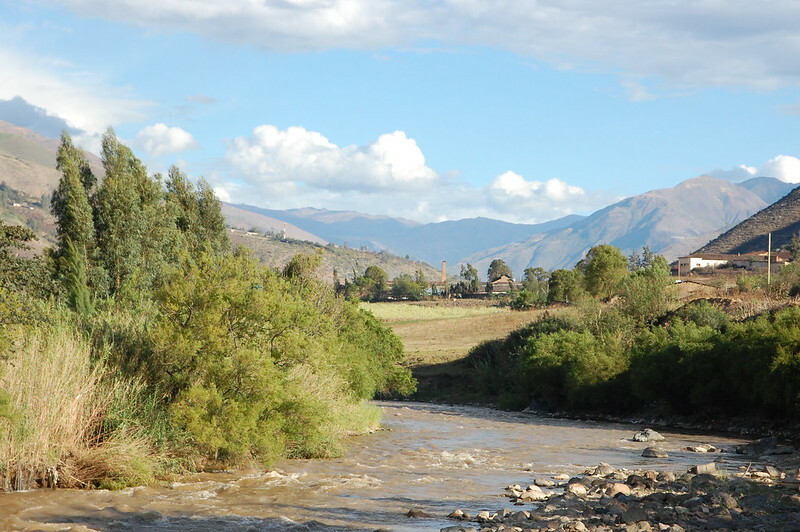 But Huánuco is so much more than that, and I want to make sure you know what I didn’t before my visit: the countryside is gorgeous and you should try to spend some time out here rather than in the city. 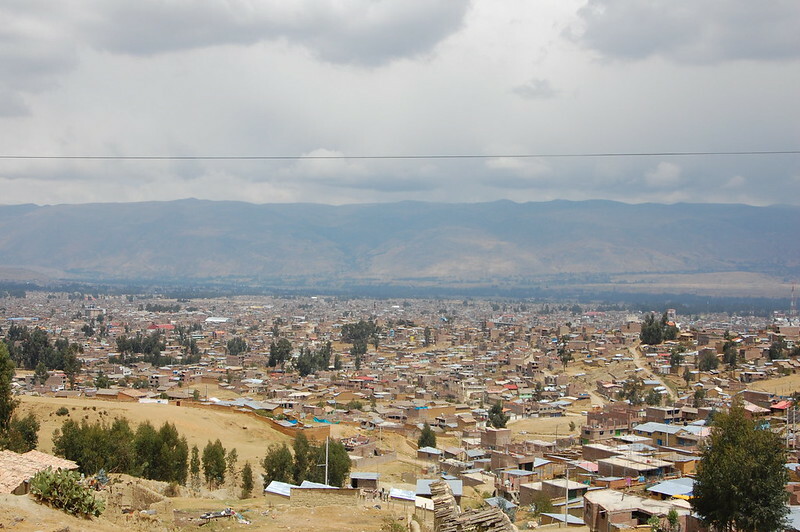 As it turned out, I was lucky because the taxi driver I hired to take me to Kotosh was eager to show me the rest of Huánuco. 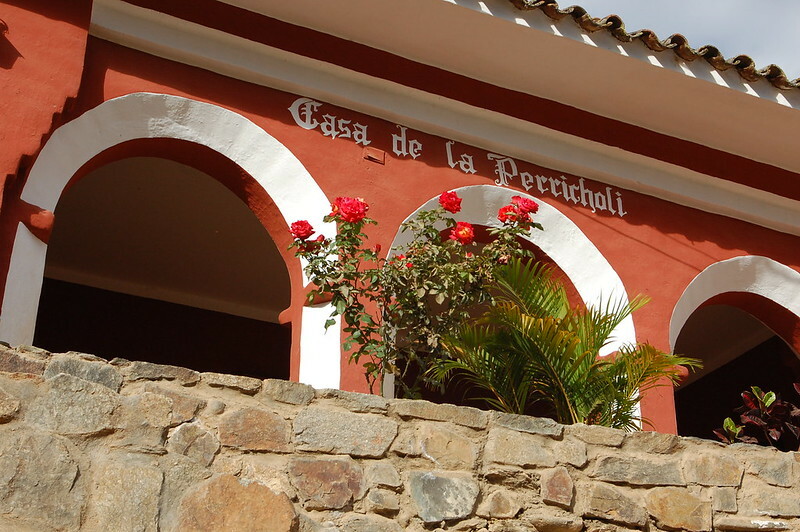 He was adamant that I visit the other major tourist attraction of the region, and one that I had never heard of before: La Casa de la Perricholi. 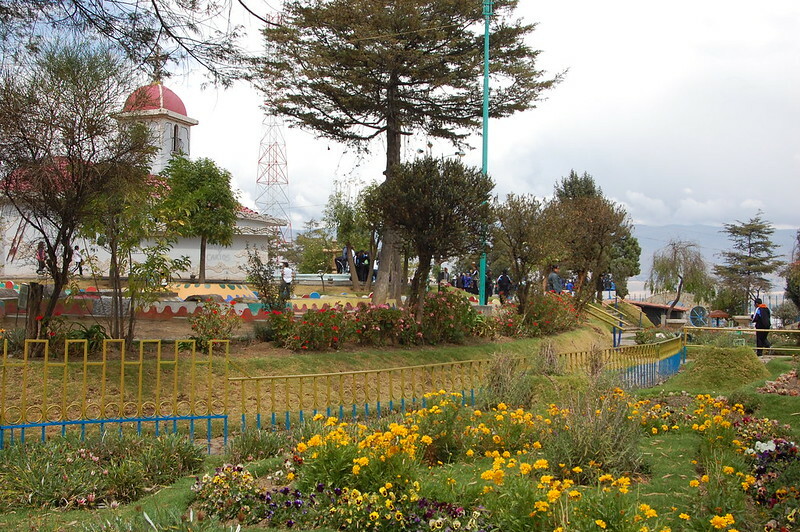 Fourteen kilometers outside Huánuco lies the tiny town of Tomayquichua, with a very pleasant green plaza and a story that dates back to the colonial era. 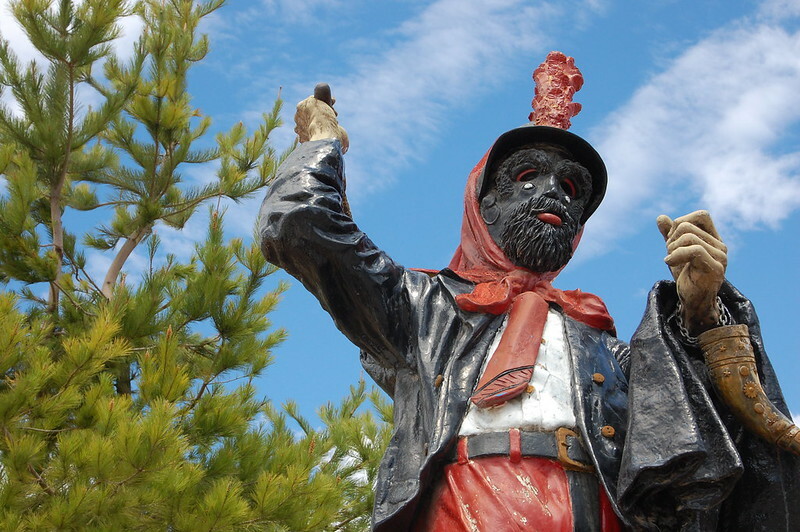 You can get a sense for the story if you look at the statue that sits in front of the municipal building. 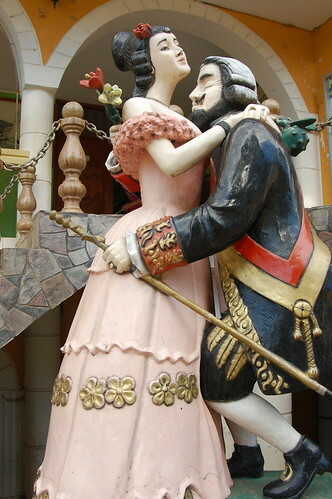 A tall, regal woman embraced by her short lover. 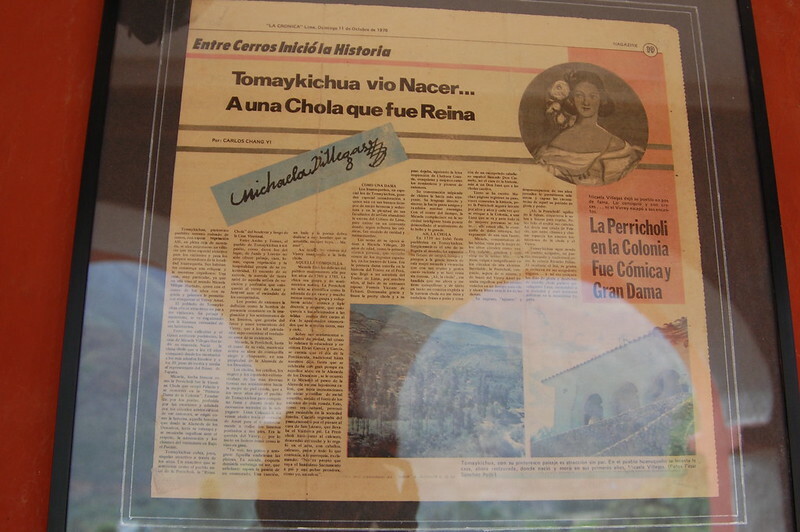 This love affair being celebrated by the town of Tomayquichua is none other than that between a woman named María Micaela Villegas y Hurtado de Mendoza and the Viceroy Manuel de Amat in the 18th century. This star of Peruvian colonial theatre is more commonly known by her stage name, La Perricholi. So why does Tomayquichua honor this woman, a famous actress in the 18th century, who had a scandalous fourteen-year-long affair with a man almost three times her age? Because, supposedly, she was born here, in this little house, although there is a strong argument that she was actually born in Lima. Whatever the actual story, it worth visiting La Casa de la Perricholi because it is a house turned into a museum honoring this one fascinating person. La Perricholi was born in 1748 and had become a much-admired theatre actress by age 20. 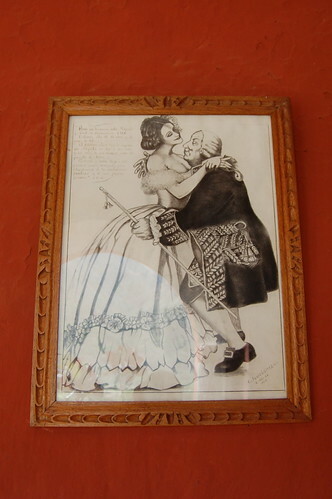 It was soon after this that she attracted the attention of the powerful viceroy, and they defied convention and publicly displayed their relationship on Lima’s social scene for fourteen years. That’s pretty progressive for that era! When visiting La Casa de la Perricholi, you can see the tiny house where she was (supposedly) born, although she lived the majority of her life in Lima. There is this pretty carriage, but I’m not sure if this dates back to that era because it seems to be in pretty good condition. You can even make a wish at this wishing well. I’m not sure how many women have wished for an extremely powerful prince to make them princesses – what do you think? Either way, it was nice to get out of the city and into this laid-back town, surrounded by the green hills, with small houses. It certainly gave me a more complete perspective on what life is like in the region, with its lovely climate and agricultural focus. To be fair, La Perricholi is actually still quite recognized for her role in Peruvian history. 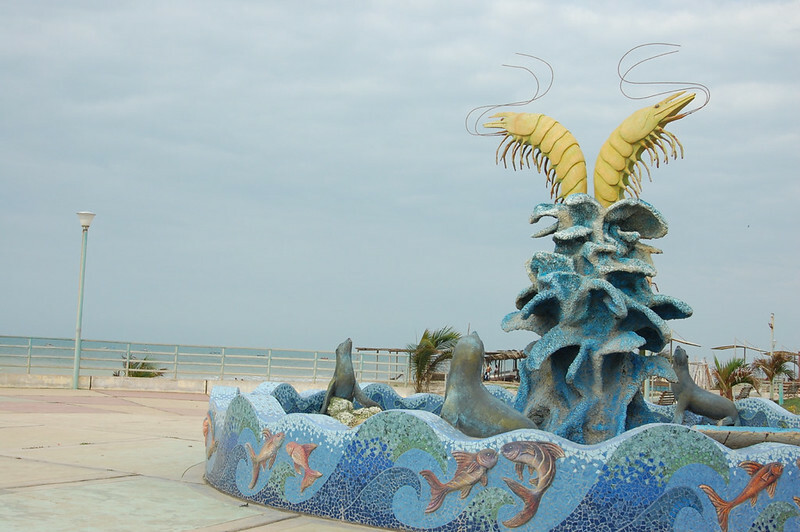 She pushed for some of the beautiful colonial parks and constructions in Lima that exist to this day, most notably La Alameda de los Descalzos in Rímac. She has been the subject of countless books, movies, tv shows, and even an opera! 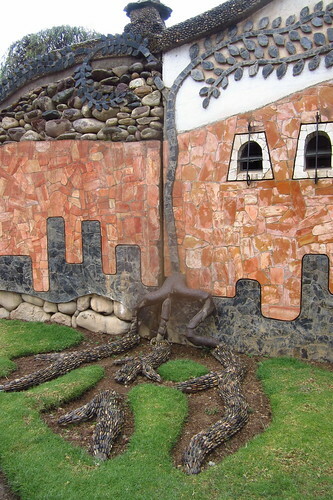 So, if you’re in Huánuco, you should definitely visit. It doesn’t really matter where she was actually born, but it’s a good way to get a sense of her role in Peruvial cultural memory! After my tour of La Casa de la Perricholi was complete, we moved on to a small pisco distillery, but since I wasn’t planning on buying I felt too awkward to take any pictures or even note the name. Be sure to ask in Huánuco if this sounds appealing, or just ask your taxi driver to take you there. But the part I did like? Heading over yet another suspension bridge and taking pictures over the pretty river. Looking at these pictures three years later, I’m struck by how much this landscape reminds of the Valle de Elqui in northern Chile. Low brown hills, suspension bridges, maybe a few more trees? 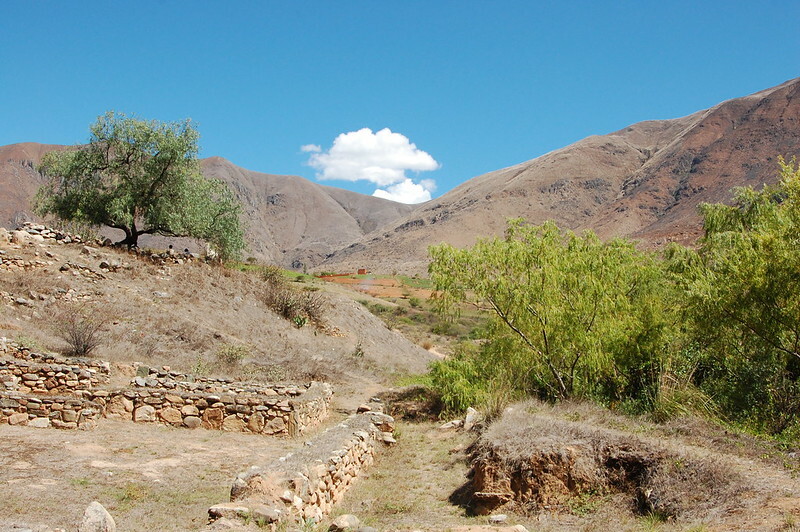 If you have any interest in getting to know the landscape near Huánuco, the Casa Hacienda Shimay comes highly recommended. If I ever make it back to this region, I’m definitely going to stay there. It would be amazing to spend a couple of days relaxing, disconnecting, and going on hikes and horseback rides around the region. Ahhh. 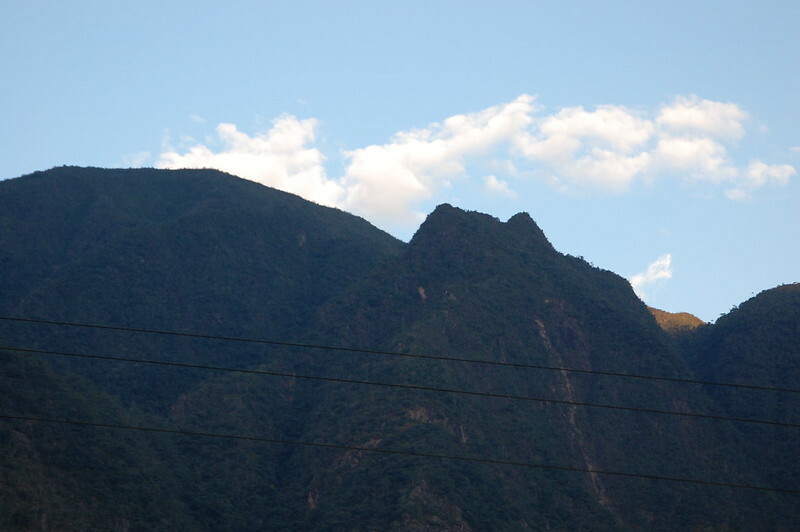 But all in all, I enjoyed getting out of the city and seeing a little more of what Huánuco has to offer. As I mentioned, the city wasn’t for me, but the scenery definitely was. Just another reminder of how your perceptions of a city or a region can be colored by your (usually limited) personal experience. 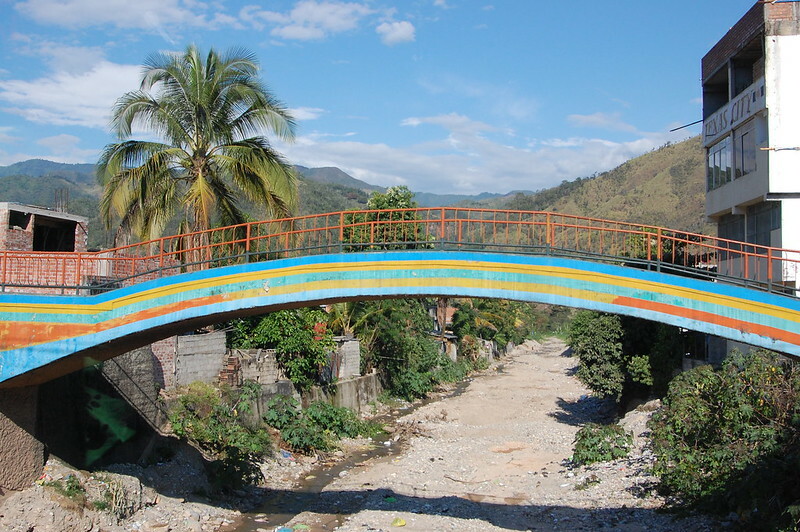 So be sure to get on that local bus to Tingo Maria or hire a super affordable taxi to get into the countryside and really see what this region is about. As I mentioned in my last post, I wasn’t a huge fan of the city of Huánuco, but I think the region deserves more attention and exploration. 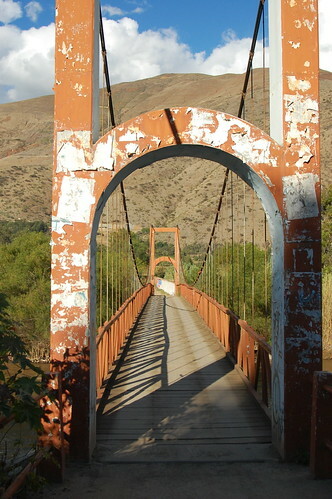 Be sure to visit the ruins of Kotosh, La Casa de la Perricholi in Tomayquichua, and see if you can stop by the river for scenic photos. 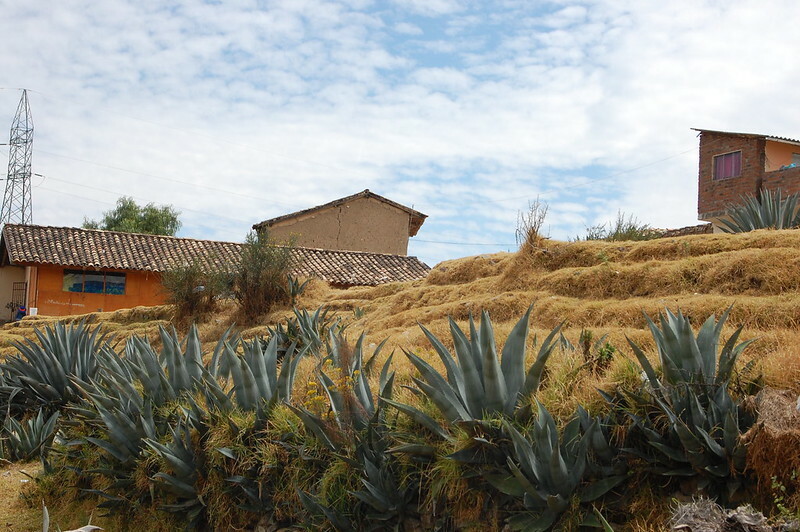 Although I didn’t stay there myself, the Casa Hacienda Shismay is run by locals and offers a nice way to experience the countryside of Huánuco. You can probably arrange a tour from Huánuco, but I just met a friendly taxi driver who was more than happy to drive me around the countryside. Coming from other parts of Peru, the price seemed super inexpensive to me and he acted as a tour guide so I was happy to pay. I think I paid S/.35 to go to and from Kotosh (on the opposite side of the city), Tomayquichua, the distillery, and the route back, and it took about 3-4 hours. 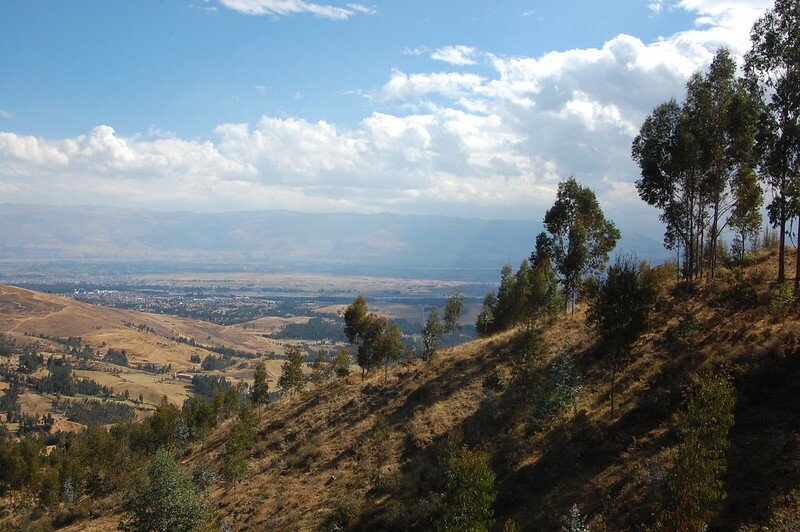 For more information on places you can visit before or after Huánuco, read the recommendations at the bottom of my post on the city of Huánuco and Kotosh. For more information on La Perricholi (in Spanish), you can read this blog post or this Wikipedia article. After spending an active, if rain-filled week exploring the fascinating culture, history, and landscapes of Huancayo, I knew I had to move on, but I wasn’t exactly sure where I wanted to go. 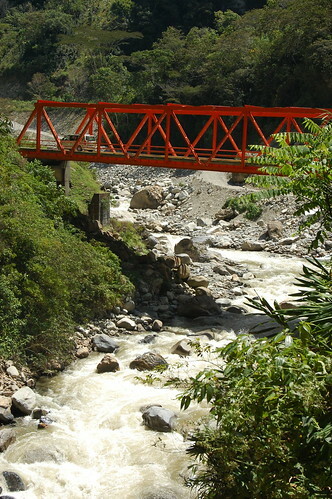 Huancayo is only eight hours from Lima, but if I continued to head further north, I could access the jungle through Pucallpa, or return to the mountain landscapes of the Cordillera Blanca through Huaraz. 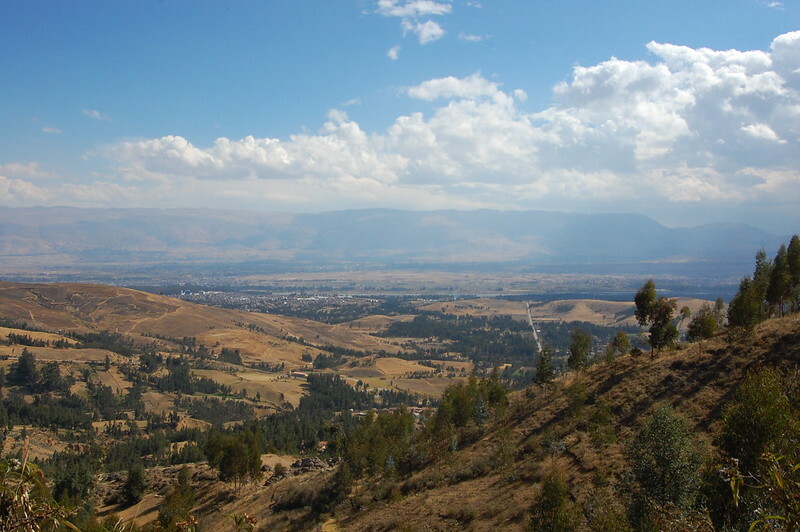 Whatever I decided, my next destination was certain: Huánuco. 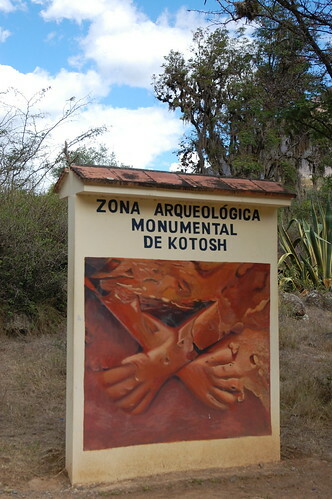 Besides providing more convenient access to the jungle, it hosts one of the most ancient archeological sites in Peru: Kotosh, known for its Templo de las Manos Cruzadas (Temple of the Crossed Hands), a set of ruins about which is little is known. Only six hours from Huánuco, I decided to take a night bus and see how much I could see upon arrival. That turned to be quite a lot! I arrived to Huánuco before dawn, and as I usually do with such early arrivals, I sat down in the bus terminal to get my bearings and wait for sunrise before getting in a taxi. 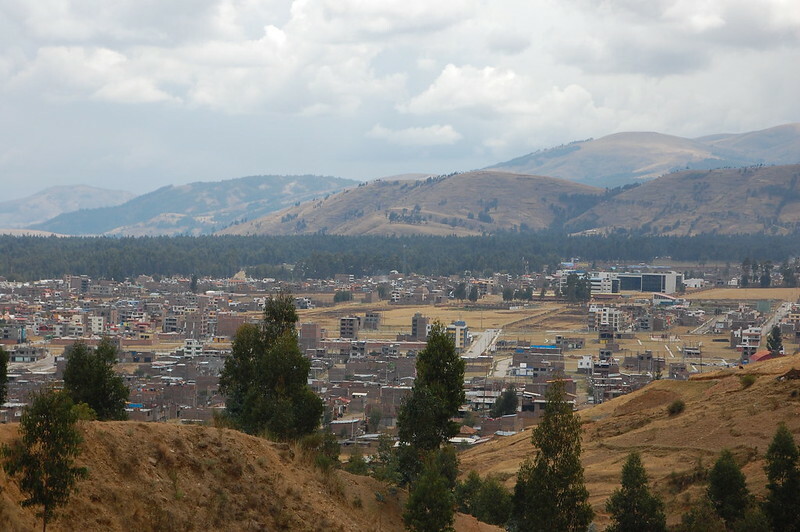 As it turned out, Huánuco is a city of mototaxis, and that means noise, constant noise. 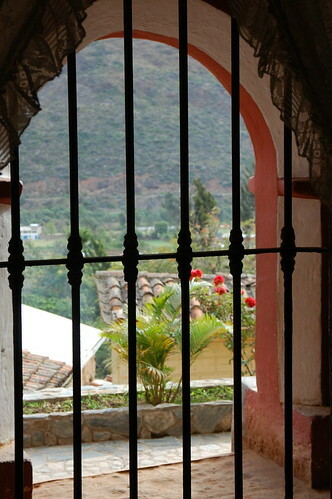 Even staying in a room deep within the hostal located near the main plaza, I could hear noise constantly. Our relationship was off to a rocky start. 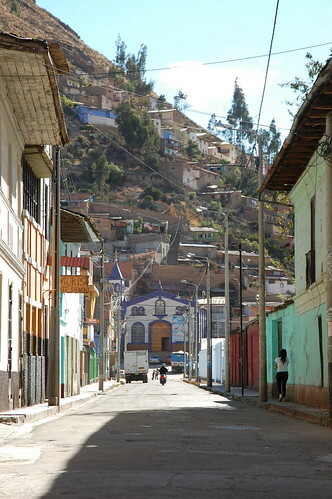 After getting a couple more hours of sleep, I headed out into the bright sun of Huánuco to get a sense for the city. 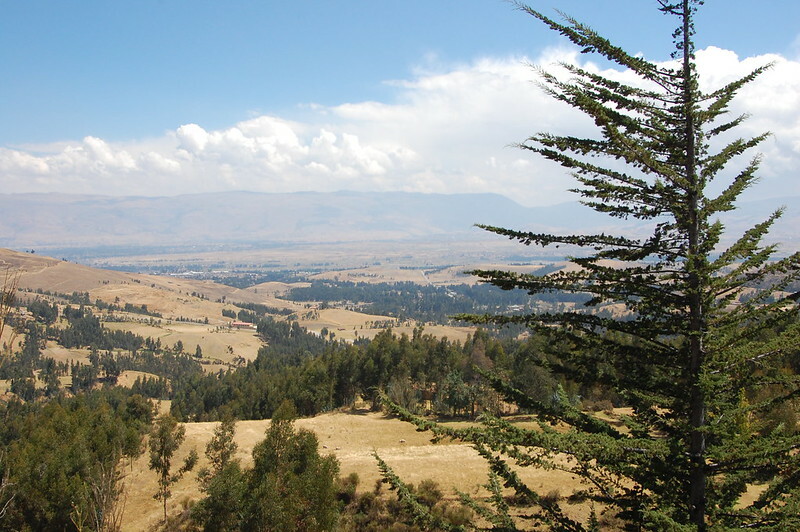 Huánuco’s claim to fame is that it has the best weather in the world (according to Huánuco, of course! 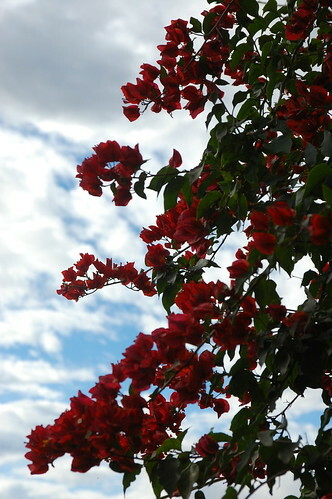 ), and the sun and blue skies were my constant companions. Coming out of a week of rain, this was somewhat refreshing, but with few trees, it was a little overwhelming. 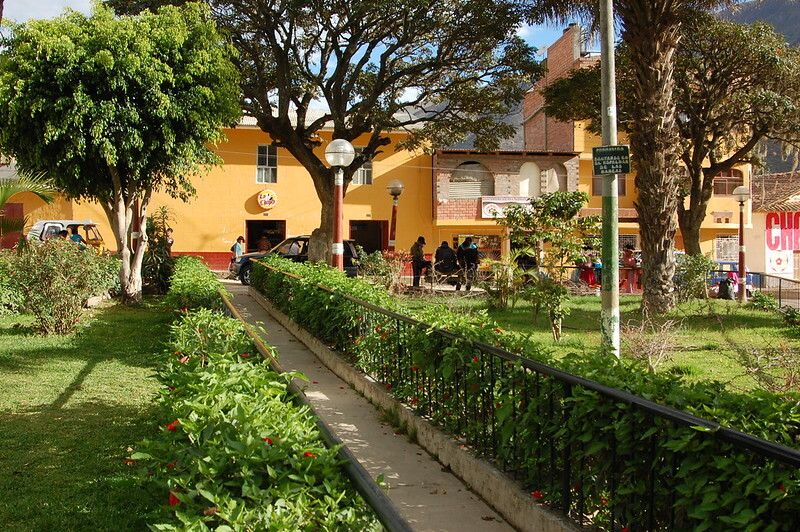 So while in the city of Huánuco proper, I spent most of my time wandering through the streets and heading to the cute plazas near the churches and colonial buildings, where I found benches underneath the trees and brainstormed where I wanted to go next. I particularly liked this church – and for some reason didn’t snap pictures of any others. 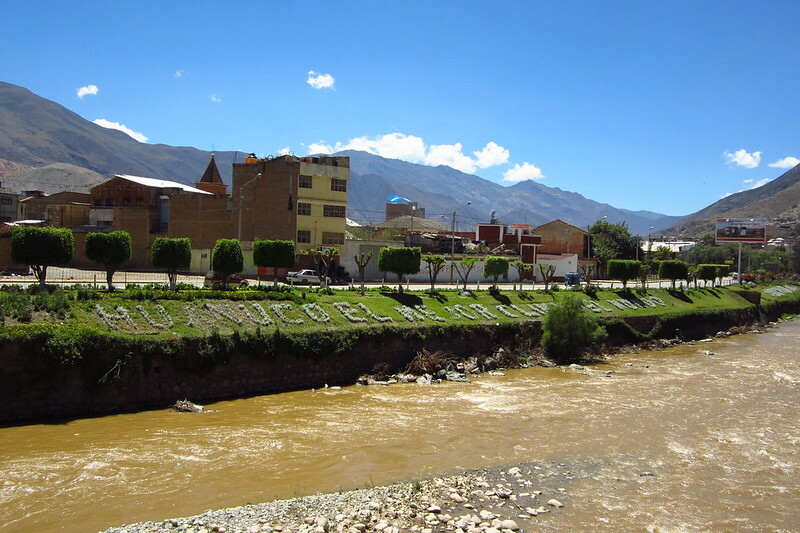 But if I’m being completely honest here, I actually did not like Huánuco – the city of Huánuco, that is. I loved the countryside and will share more about that next. 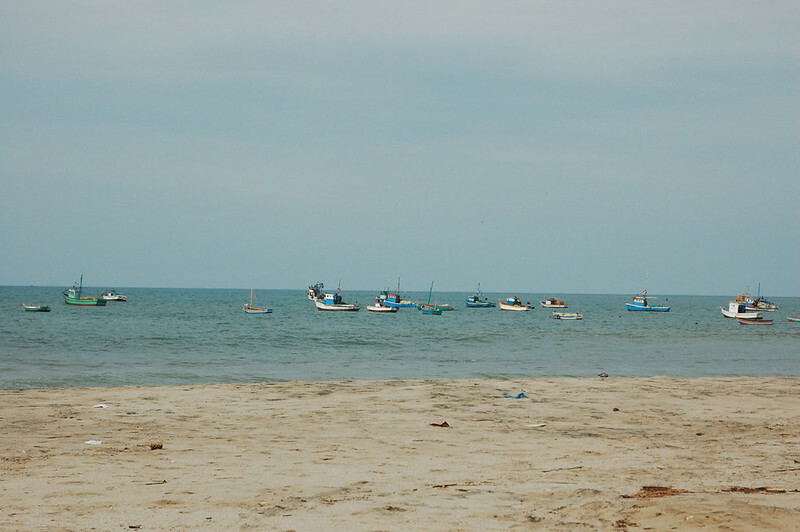 If you’ve read other posts of mine, you’ve probably heard me talk about how amazing Peru is, and how much I love major urban cities like Lima and tiny towns that few foreigners visit. This is not me putting a positive spin on things; I connect to Peru. But I did not connect to Huánuco. 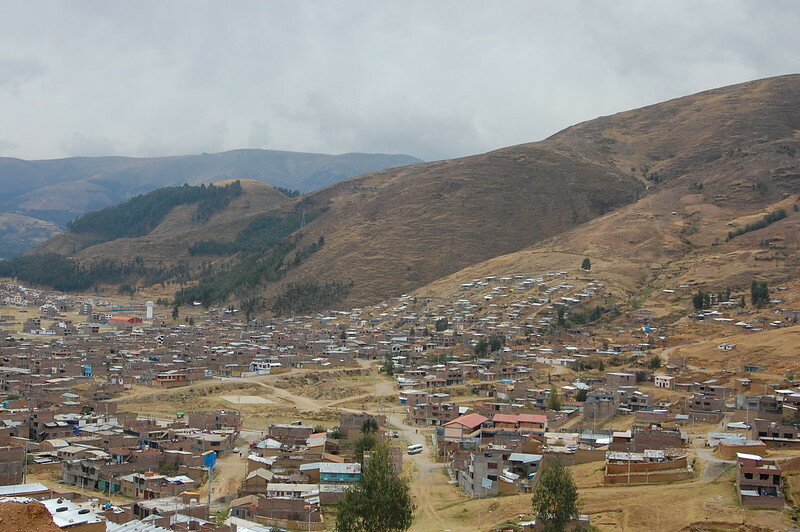 A couple of months after my visit, I read the book Lituma en los Andes (Death in the Andes) by Mario Vargas Llosa, one of Peru’s top novelists, and there is an apt description of Huánuco as this transitory city where people spend time escaping wherever they came from. I recognized that here; there was a heavy, dark energy in the city and I couldn’t wait to leave. 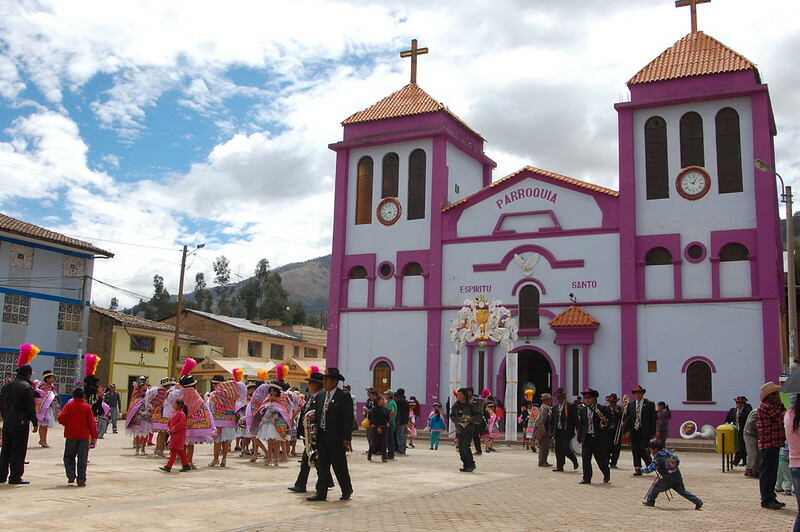 If you do visit, remember that there is more to Huánuco than its loud, noisy city. The local police actually serve as the tourist information office, and they also suggest heading outside the city to really get to know the region. It’s worth spending an afternoon wandering through the city and checking out the many parks, but make sure to leave time in your itinerary to see Kotosh and other sites outside the city. 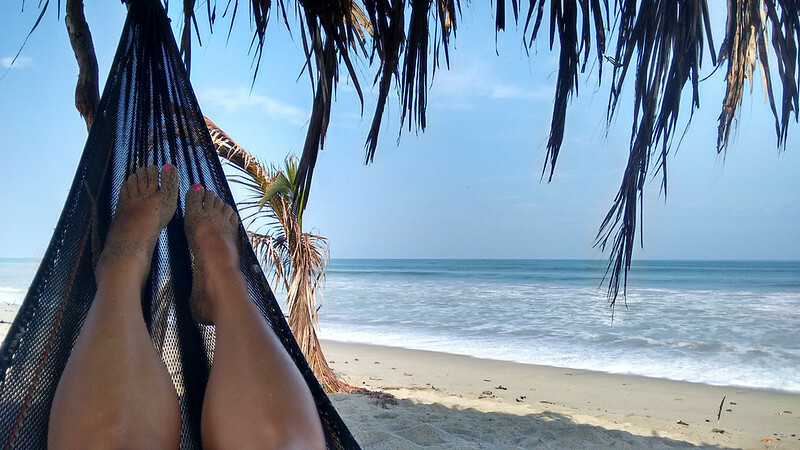 I had originally hoped to stay at Casa Hacienda Shismay for a couple of days, and that would have given me a whole different perspective on what the Húanuco region is really like. 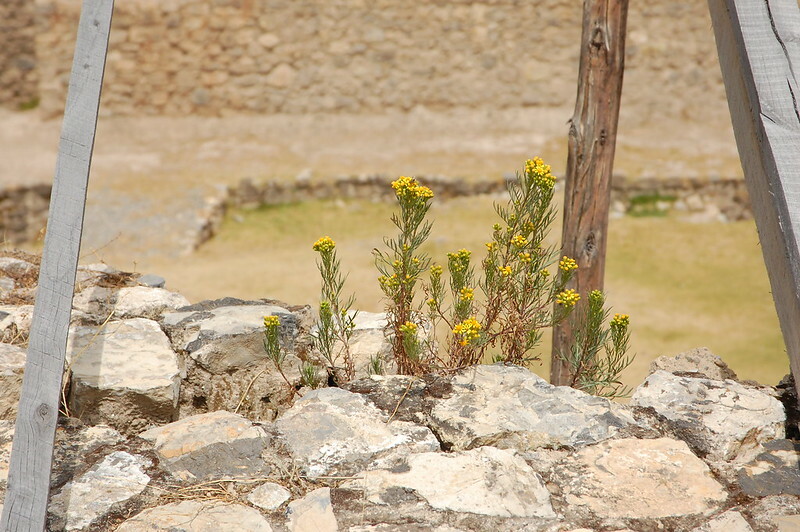 By the time I made it to Huánuco, it had been a while since I’d seen ruins, and I was curious about Kotosh because there is so little information on the site. It is known for the simple temple with two panels, each displaying a pair of life-sized crossed hands. One is crossed as you see in the picture, and the other is crossed in the opposite direction, thought to represent duality so common in Andean cosmology, the masculine and the feminine, heaven and earth, light and dark. 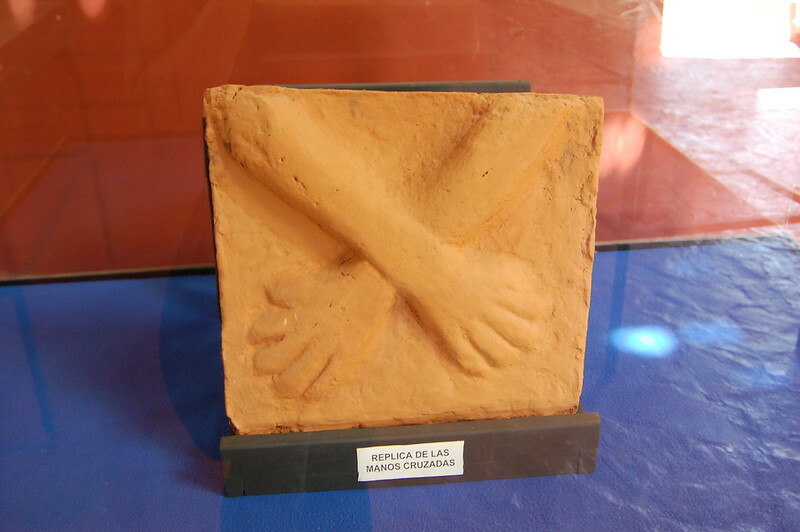 The small on-site museum is pretty sparse and includes this replica of the adobe hands, which have been removed in the name of preservation and can be seen in Lima’s archeological museum. The most important thing to note about Kotosh is that the ruins are set in the midst of a fertile landscape. I couldn’t stop peering off into the mountains and appreciating the distant hills. Of course, this was probably strategic; many sacred sites are surrounded on all sides by hills. My first stop was this set of small temples, which are from the “most recent” period of inhabitants (and are the most photogenic!). 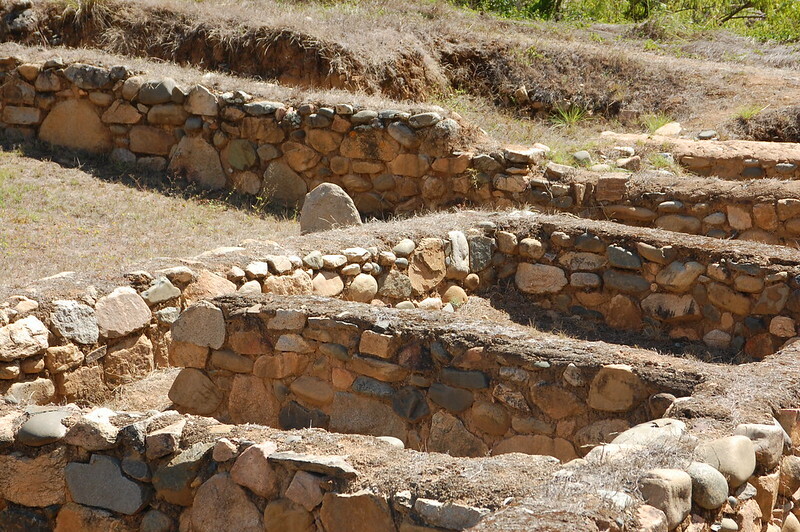 These ruins have bene studied for years by Japanese archeologists, but there is little that is actually known about the ruins except that they were ritually abandoned and filled in, until finally the people who lived here left completely. In fact, the earliest era is just called the Tradición Mito (myth tradition), and it is assumed that there was a loose camaraderie among the most ancient inhabitants. 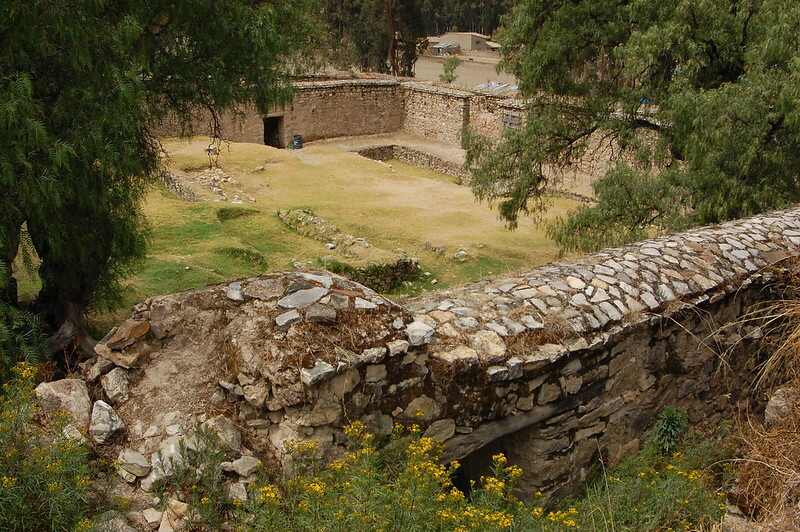 Later on, there seemed to be more exchange with other, more organized groups like those at Chavín de Huantar. 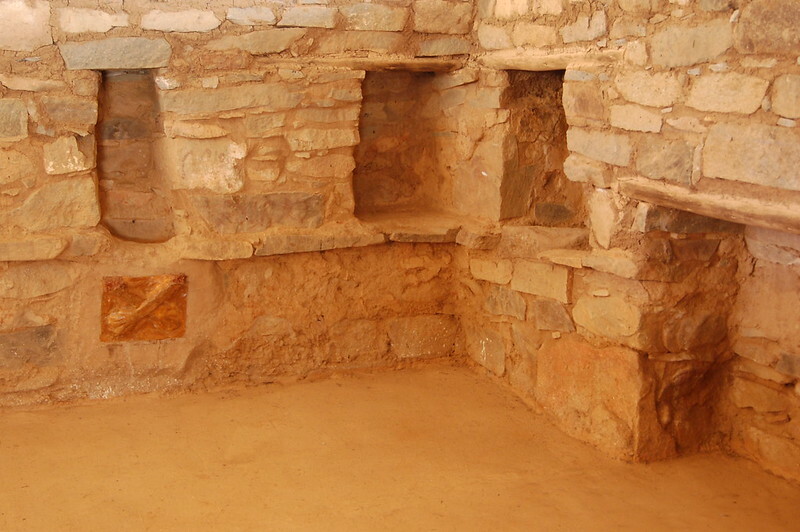 But basically, very little is known about these ruins except that there seemed to be some sort of ritual burning (which could have been to stimulate crop growth) and ritual burials of temples, which was also common with the adobe temples on the coast. Like so many ruins, there is little we know, and much we speculate. But we can definitely agree that they had excellent taste in choosing beautiful surroundings. After checking out the ruins from the later period, it was time to move on to the main event: the Templo de las Manos Cruzadas. 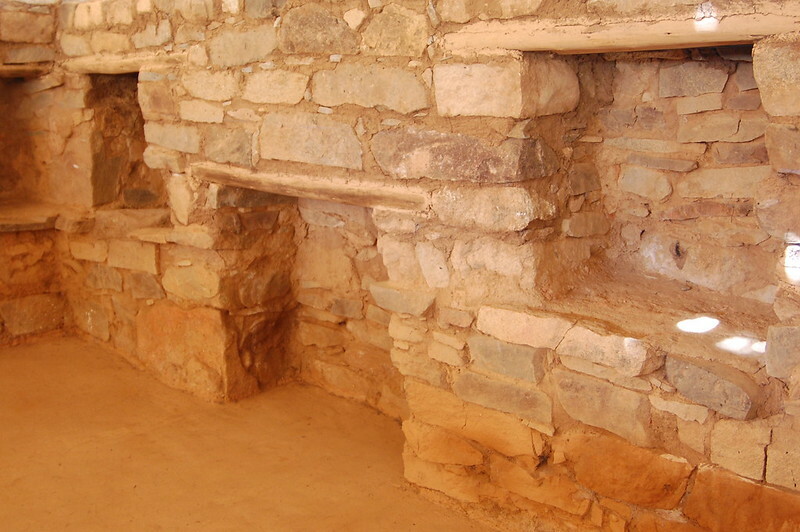 This structure is the largest and as such it seems to be the most important; there are niches carved into the walls, and as this shot shows, this is where the two sets of crossed hands used to be located. The temple also had two floors, which is thought to represent duality as much as the adobe carvings of hands in mirror image. There was a firepit in the middle of this temple, but little else has been determined about this structure. All we can do is speculate as to what rituals used to happen here, what the beliefs once were, which is part of the mystery and appeal. 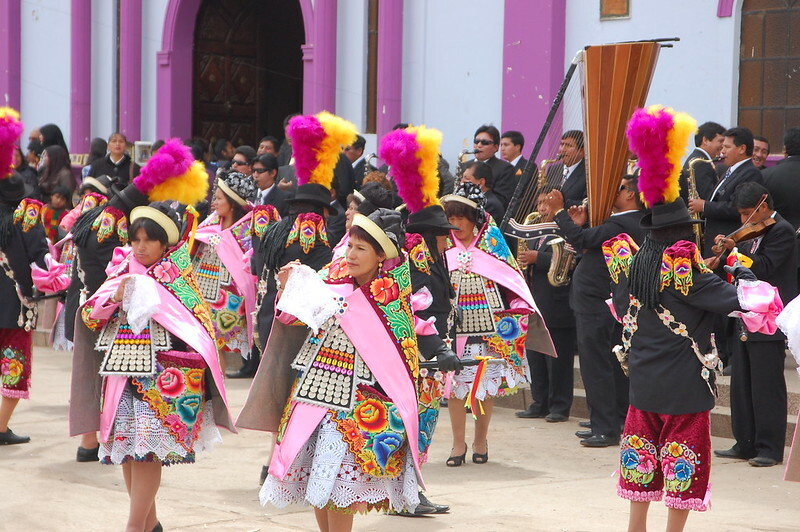 As anyone who loves the Andes has learned, bits and pieces of these traditions have survived over the years, through all the conquering cultures that came after, and remain part of the cosmovisión that lives on today. We may not know details, but we see this connecting thread through time. And for some reason, just as you find in many other beautiful spiritual sites and natural wonders, recent visitors have left apachetas, or cairns here as well. After visiting the ruins, I headed out of the archeological site to the park by the river, crossing this fantastic suspended bridge. I only wished I’d brought a picnic lunch to sit by the river and enjoy the peaceful surroundings. 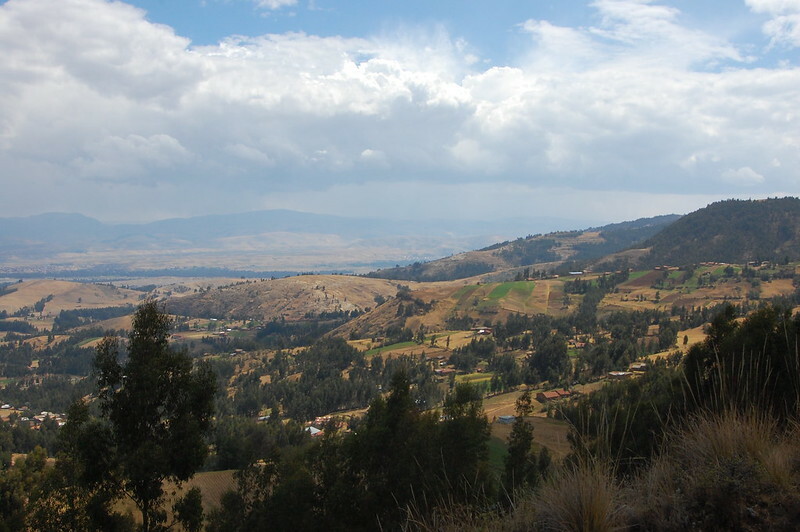 But my adventure in Huánuco wasn’t over yet: I was heading into the countryside to enjoy more of these scenic views and see a little bit of small town life. 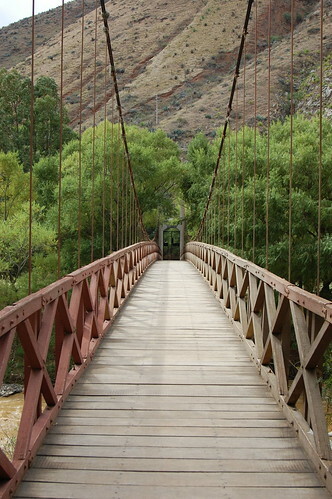 Huánuco is located about six hours from Huancayo so is a logical destination if you’re heading north. 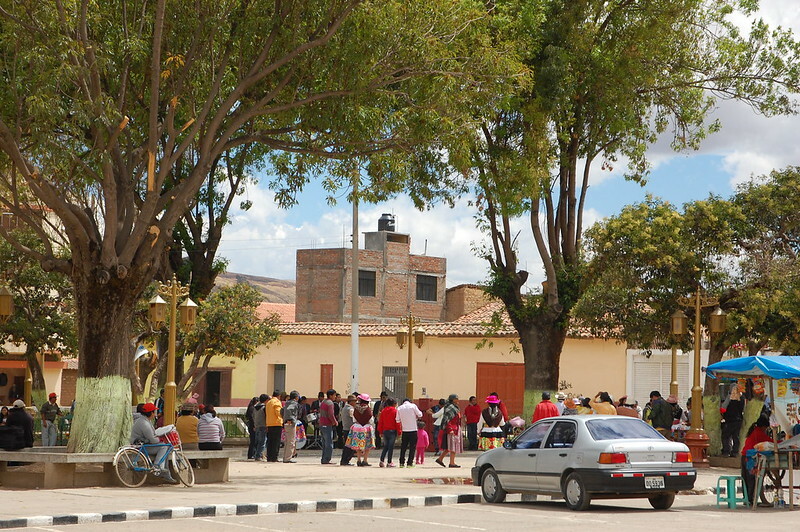 Many people visit Huánuco en route to Pucallpa, a city located on the Amazon. 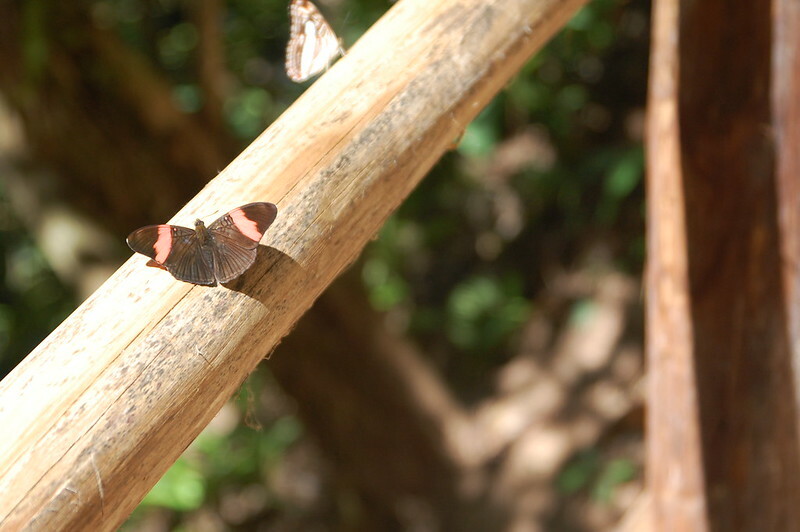 If you want to get a sense of the jungle, you can head to nearby Tingo Maria, about three hours from Huánuco. I regret not going while I was there. Please note if you travel to Pucallpa that all recommendations are to travel by day bus due to potential robberies on this specific route. 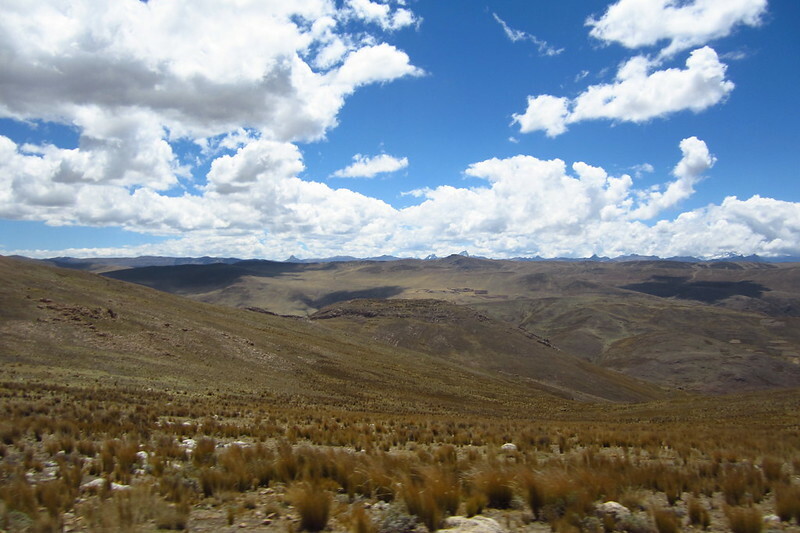 From Huánuco, you can also take the “back door” route to Huaraz. I was very tempted but it seemed too complicated and I was anxious to visit the ruins on the northern coast of Peru instead. Be sure to do your research as many of the buses only run once a day; but if you have an adventurous spirit, it’s a good way to get to the Cordillera Blanca and I’m certain the views are out of this world. Of course, you can get a bus back to Lima, or do what I did and head to Cerro de Pasco and then Tarma using colectivos. 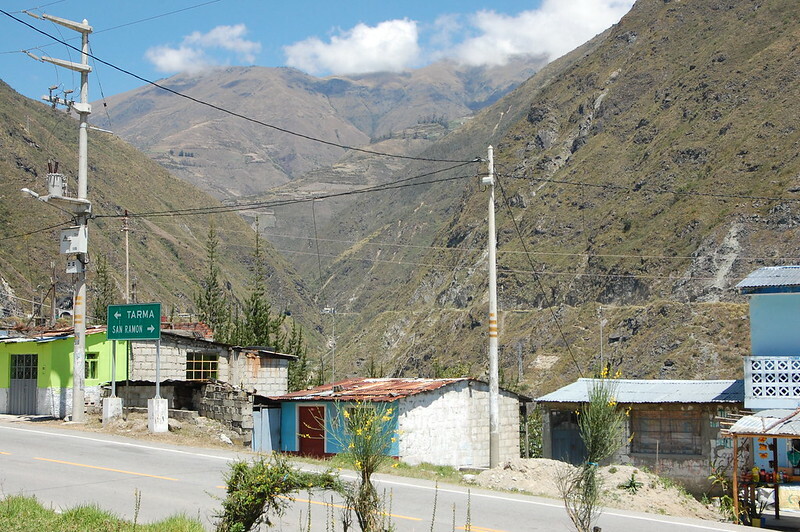 I would not recommend staying where I did in Huánuco; unfortunately, there aren’t too many budget options. 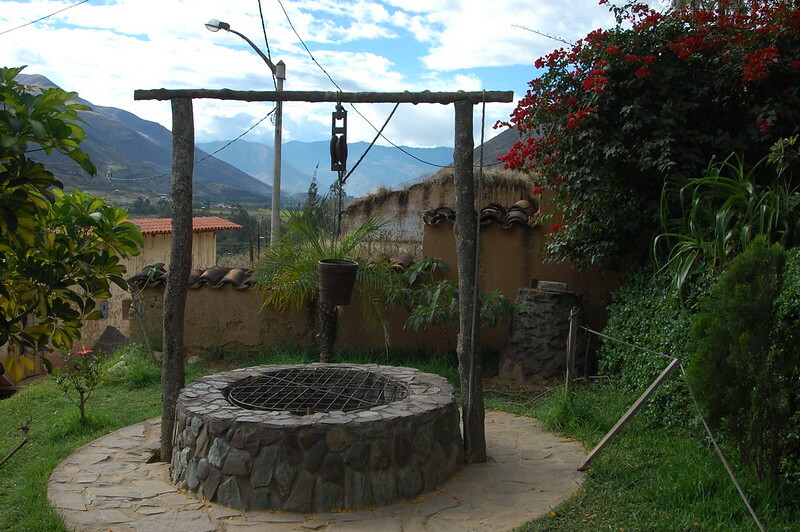 I was very interested in staying at Casa Hacienda Shismay, about 17 kilometers outside Huánuco. 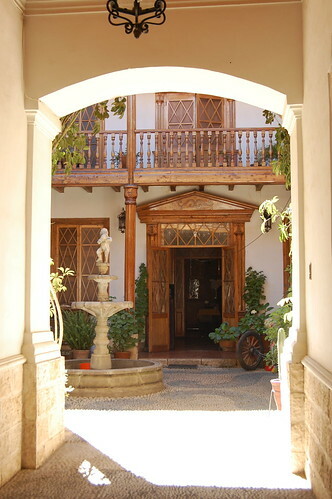 This is a converted hacienda that is run by the locals with access to hiking and horseback riding, and a gourmet on-site restaurant. Totally a splurge but has excellent reviews. They were booked solid during my visit due to group staying there so I wasn’t able to enjoy my escape outside the city. They offer transfers from Huánuco to make life a little easier. 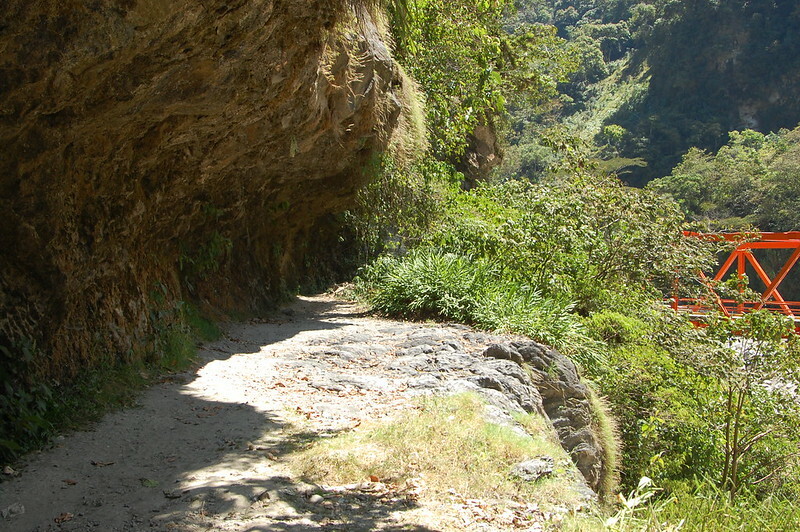 To visit Kotosh, the easiest way is to hire a mototaxi or taxi from downtown Huánuco. It’s very inexpensive – a taxi should cost about S/.12-15, round trip, and includes the wait during your visit. 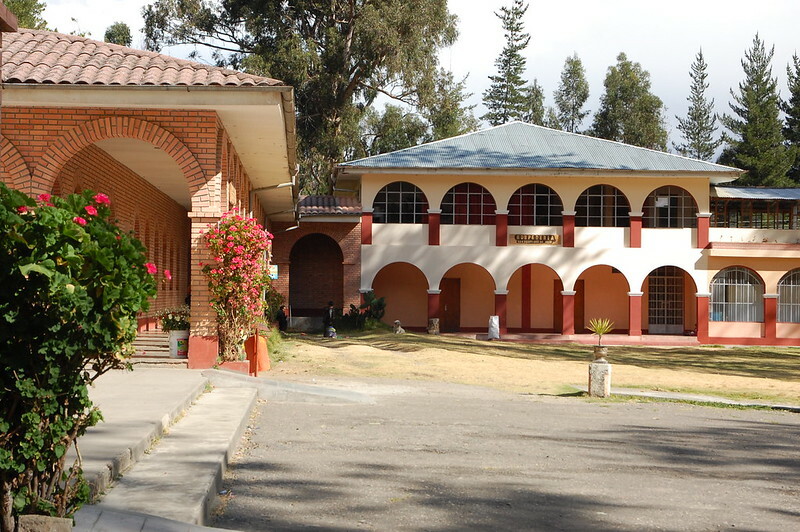 You can also do what I did and have your driver take you to La Casa de la Perricholi in Tomayquichua. Entry to the site costs S/.5 and there are guided tours available for an additional price. Kotosh is located next to a recreational park right on the river, so it’s worth planning to spend a little time there enjoying the surroundings. 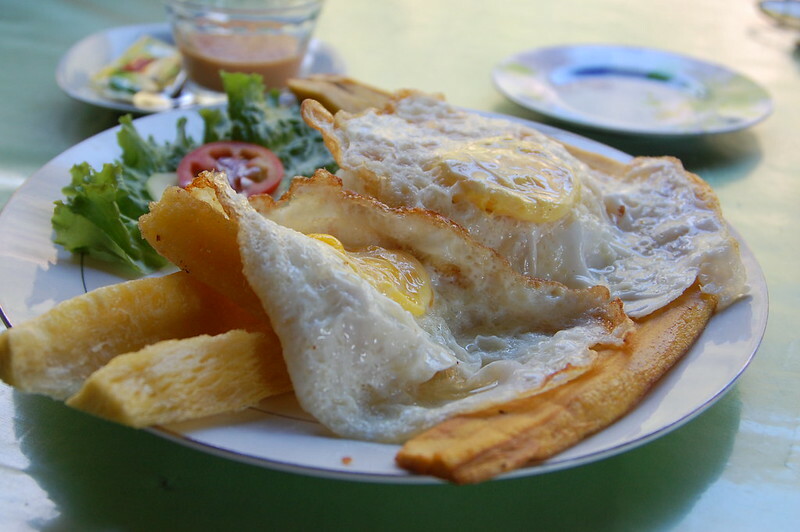 The best restaurants I found were located on the Plaza de Armas, where you can order from the fixed price menus for breakfast, lunch, and dinner. Food is very cheap in Huánuco. I discovered the vegetarian restaurant after I’d already eaten; it’s at General Prado 608. There’s also a health food store where you can buy snacks just off the plaza, and lots of juice options. 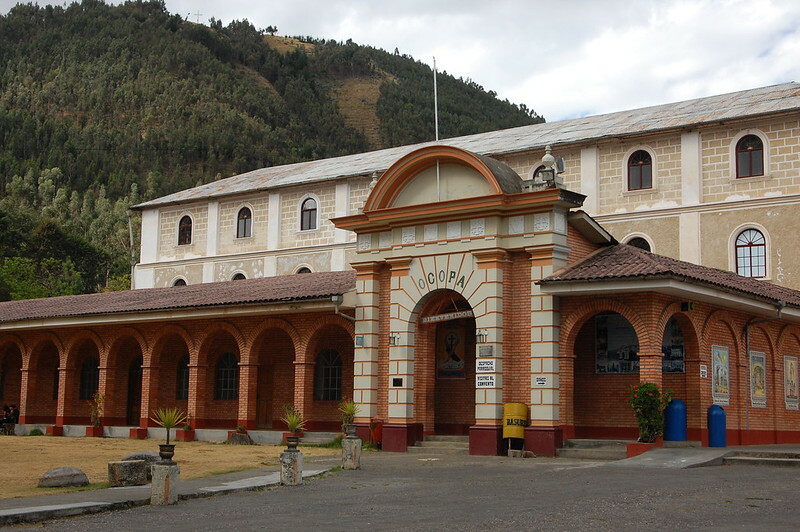 The tourist information office in Huánuco is run by the local police, and they are more than happy to share the little information they have about the region. 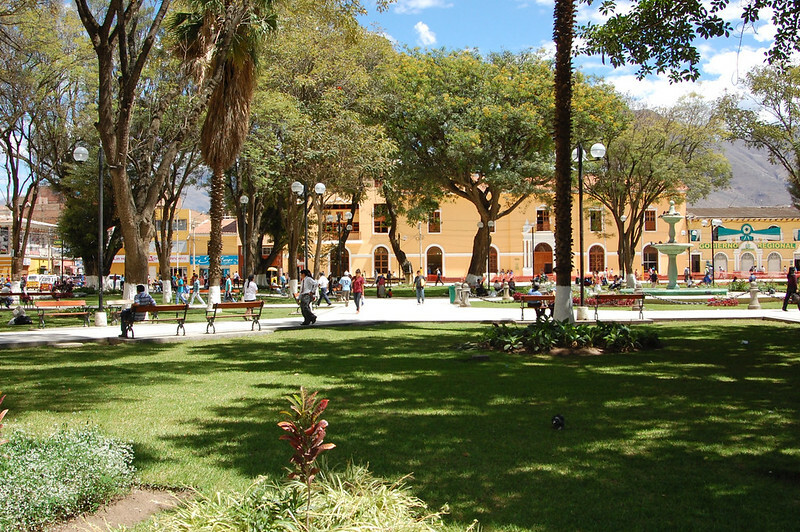 Spend some time hanging out in the many parks and plazas located around Huánuco to take in this high-paced lifestyle. The most complete information I could find on Kotosh is here (in Spanish). 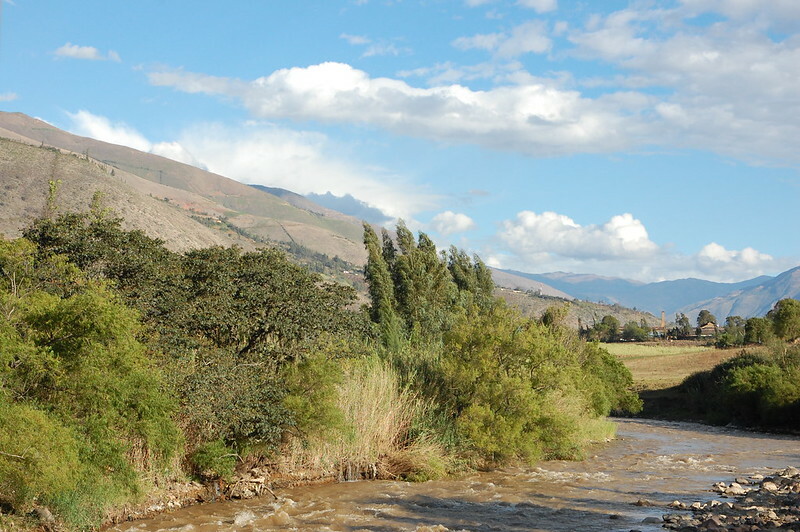 If you’re spending an extended amount of time in Huancayo, you can really get to know the region. You can explore its natural wonders and do some hiking by heading to the rock towers at Torre Torre and the Bosque Dorado in nearby Paccha. 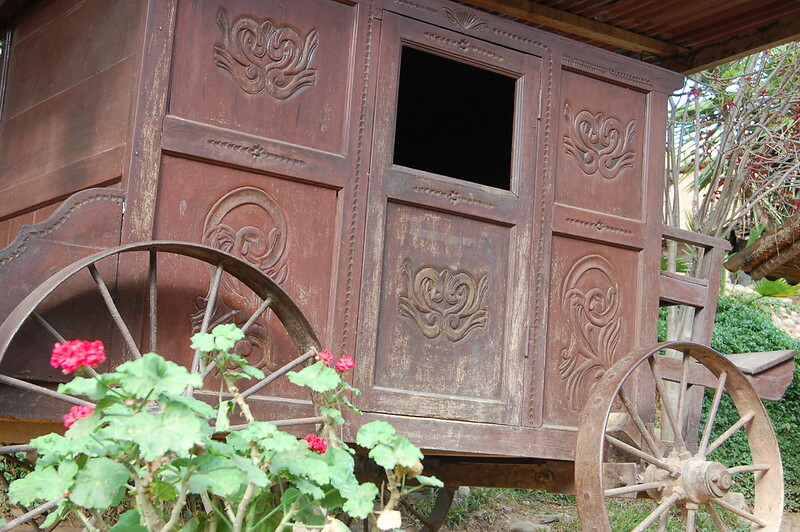 You can explore artisan traditions by taking in the mates burilados at Cochas Chico, traditional hats in San Agustín de Cajas, weavings in Hualhuas, and gold and silver jewelry in San Jerónimo de Tunan. 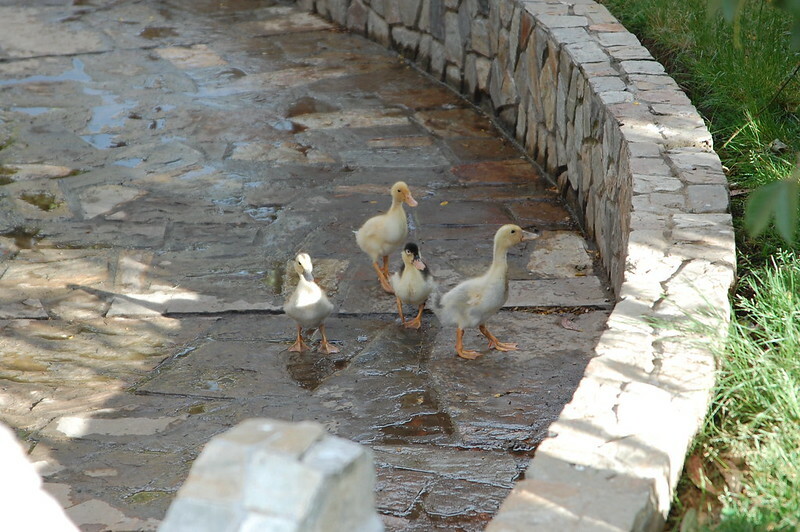 You can visit the fascinating parks in the center of Huancayo or head to Jauja to visit the Laguna de Paca. 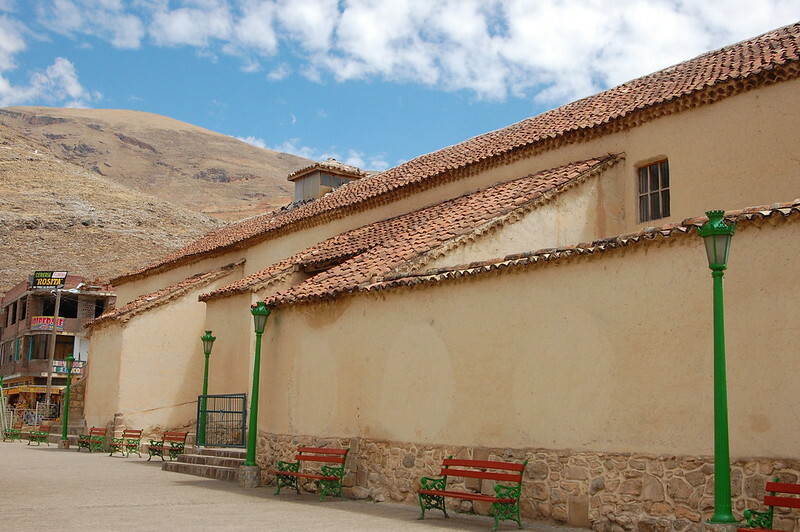 And while you’re over in this part of Huancayo, you should head to Chongos Bajo, founded in 1532 and one of the oldest towns in the region. 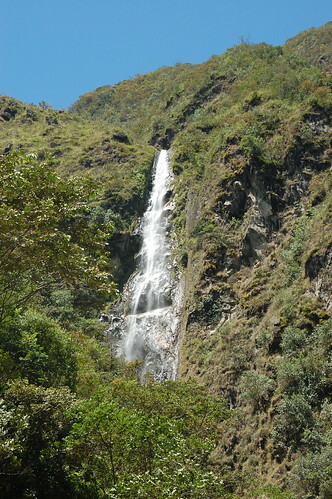 Both can be visited on a day trip from Huancayo that is really off the tourist trail but well worth your time. 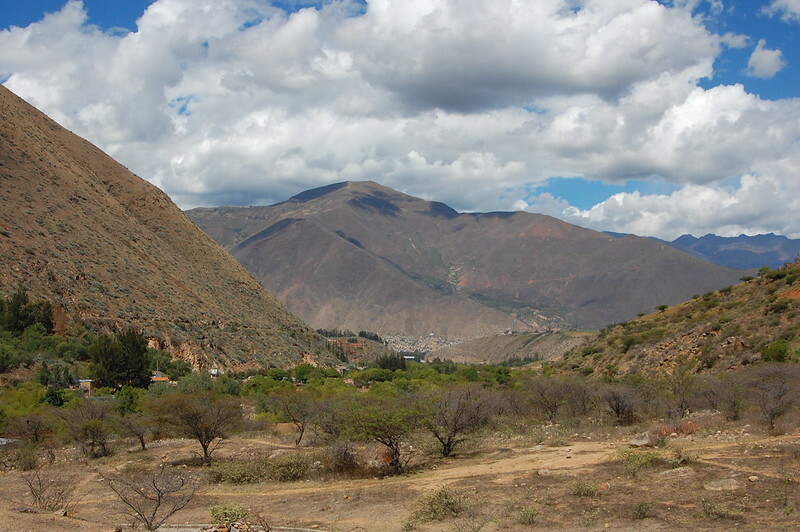 The little population of Huari is located on the outskirts of Huancayo, basically where the most distant neighborhoods of the city turn into small farms. 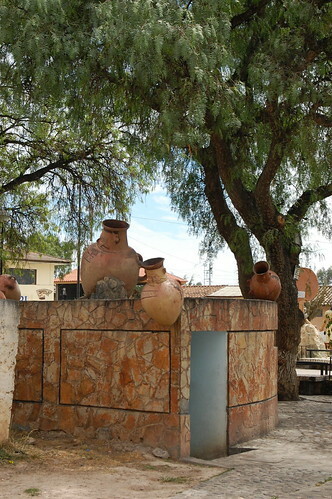 The plaza also displays replicas of the ceramic tradition followed by the Wari, as you can see here. Although I’d done my research on the ruins of Wariwillca before hopping on the bus, I’d heard conflicting reports about whether it was open on Mondays and decided to risk it. Unfortunately, it’s not – so I wasn’t able to head inside the ruins and decided to just walk the perimeter to see what I could scope out. Although this site was once very extensive, the ruins that are currently preserved are pretty small. That said, the legends about the place seem fascinating (some details in Spanish here) and it’s probably well-worth hearing what the guide has to say. In any case, I enjoyed the peacefulness of the little población, which probably doesn’t see that many foreign visitors. Since it was a beautiful day, I decided to continue on to Chongos Bajo, located a little further outside of Huancayo and also easily accessible by public bus. 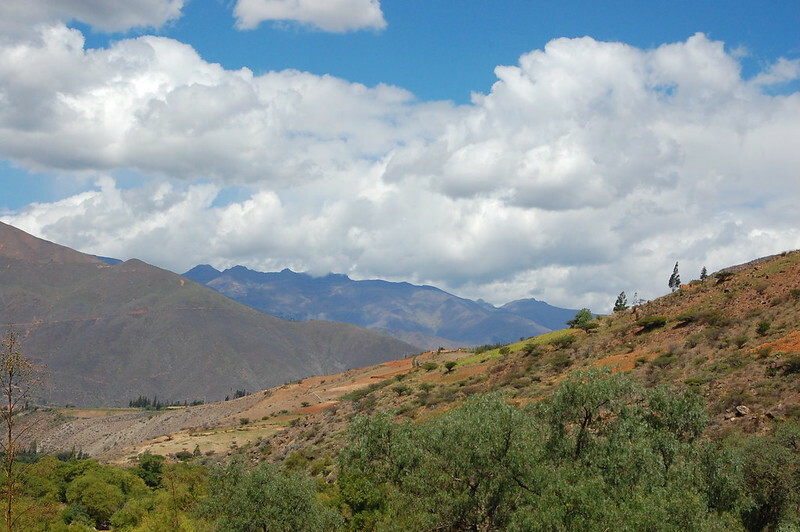 If for nothing else, this trip is worth it to admire the views passing through the foothills of the Andes. 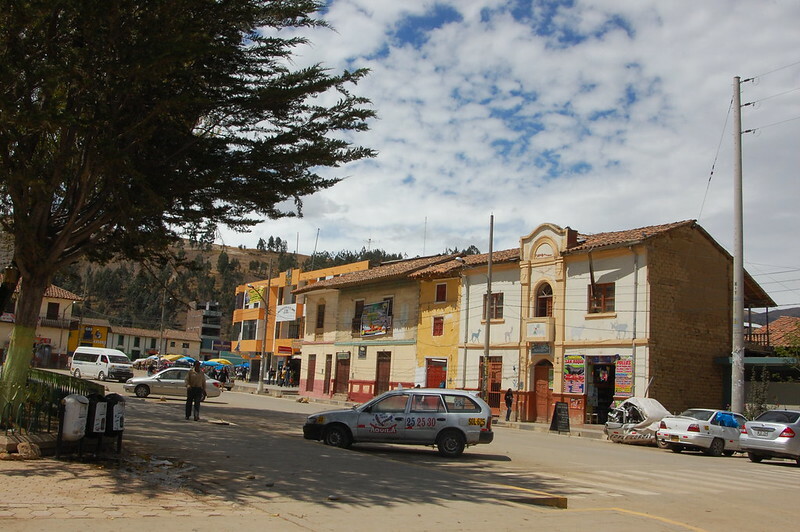 Chongos Bajo is one of the oldest towns in Peru. 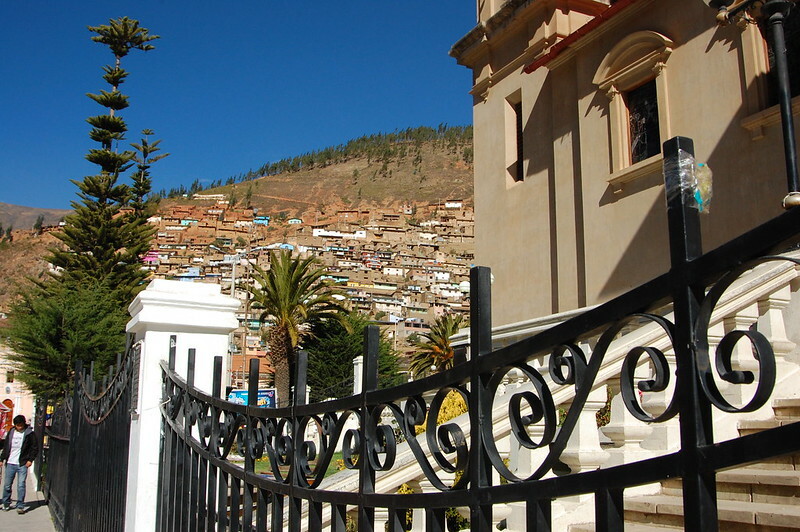 Once inhabited by the Wanka, then taken over by the Incas, this city was one of the first invaded by the Spanish colonizers. The city was founded as Santiago León de Chongos in 1534 and became one of the first places where the Inquisición took place. 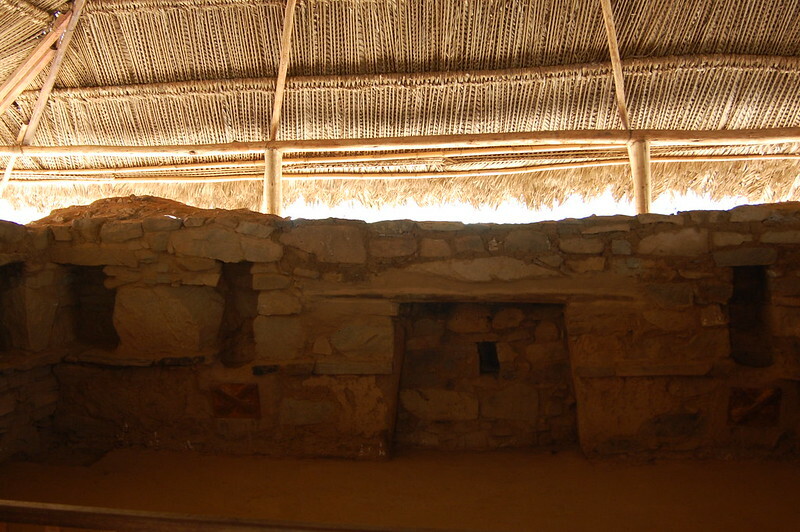 The Spanish were particularly interested in this area when they found gold and silver nearby. 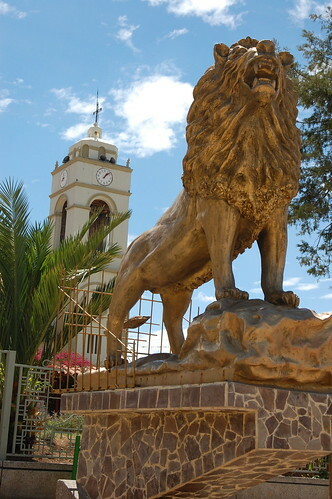 I wonder if the golden lions are a reminder of that former richness. 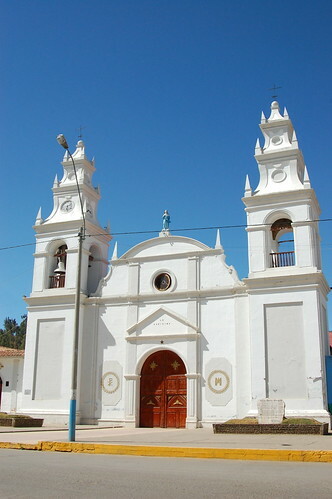 The Iglesia Matriz (mother church) was built in 1565, and much of the construction is original, having survived centuries. 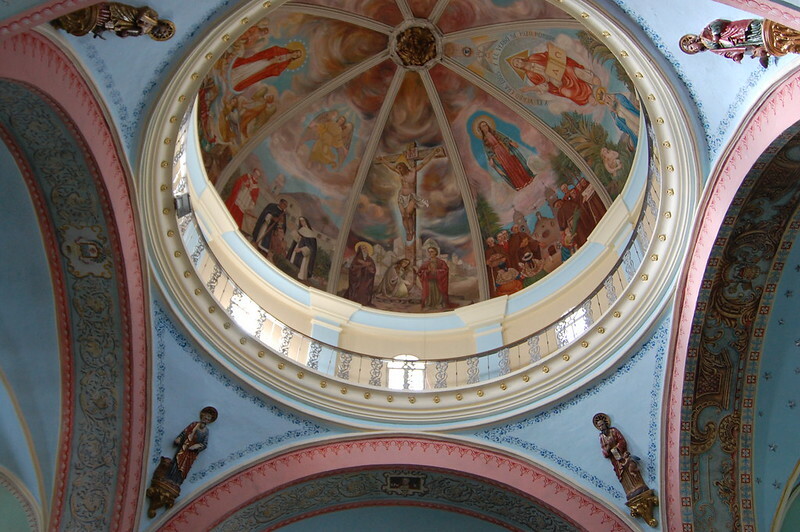 In fact, that was the reason I was told to visit – the history and art contained within the church. Although I did not know this at the time, there is also a beautiful little chapel located in the foothills of Chongos Bajo. 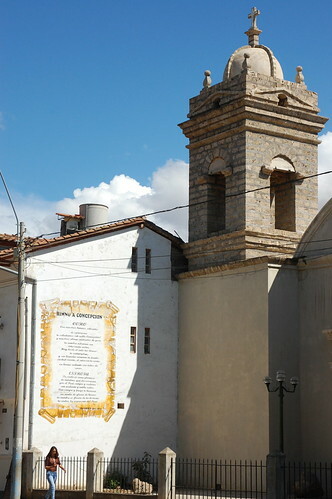 The Capilla el Copón was founded in 1550 by Inés Muñoz de Alcántara, Francisco Pizarro’s cousin and apparently the first Spanish woman who arrived to Peru. 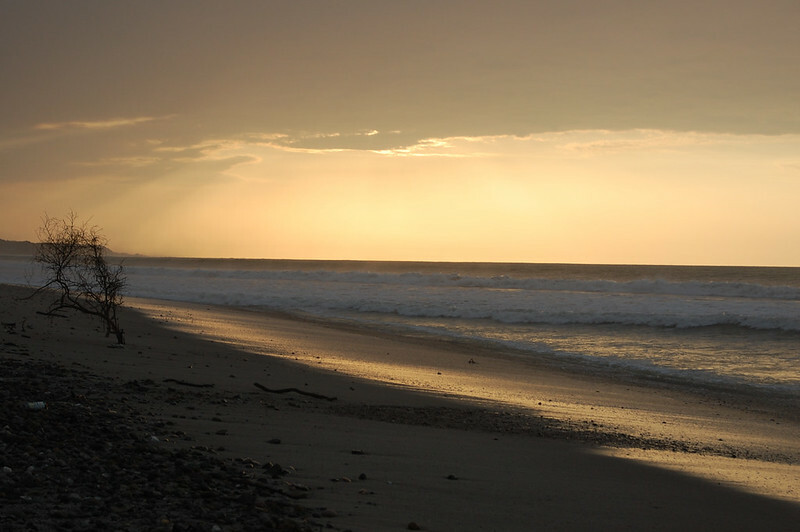 If you do make it to Chongos Bajo, be sure to visit this little photogenic chapel too (and send me pictures!). Even this little side chapel had beautiful art. There was so much to see in and around the plaza. In the plaza, you can also spot these fascinating statues in costumes reflecting the dances of the region (the other one leads this post up). 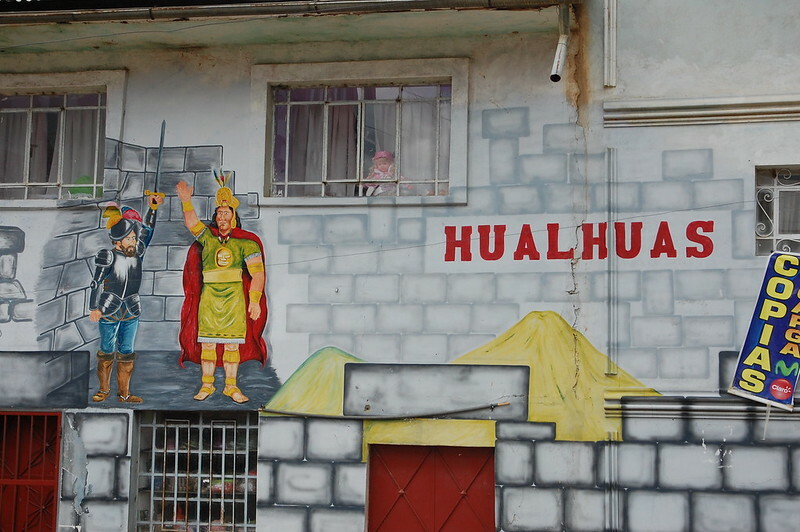 I enjoyed that each town I visited had a unique representation of the strong Huanca (regional) identity. But what most surprised me about my visit to Chongos Bajo was this cross in the center of the plaza, called the Cani Cruz, a much venerated symbol of devotion. 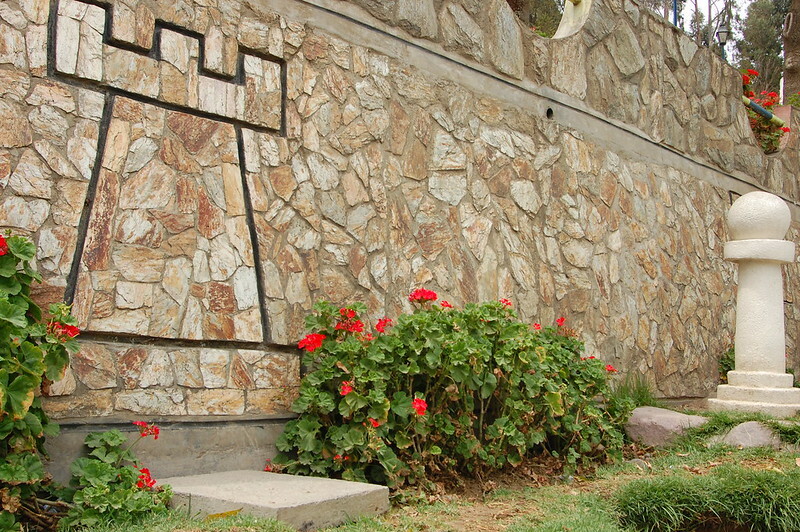 Every single day, the faithful flock to this cross to pray and give offerings of flowers and candles. The effect of all this devotion is that the spot has a very different, peaceful energy that I personally could feel in the air. I can understand why this has become a pilgrimage site of sorts. After exploring the plaza I walked down some of the side streets to get a sense of the town. I loved the sense of being surrounded by the hills. 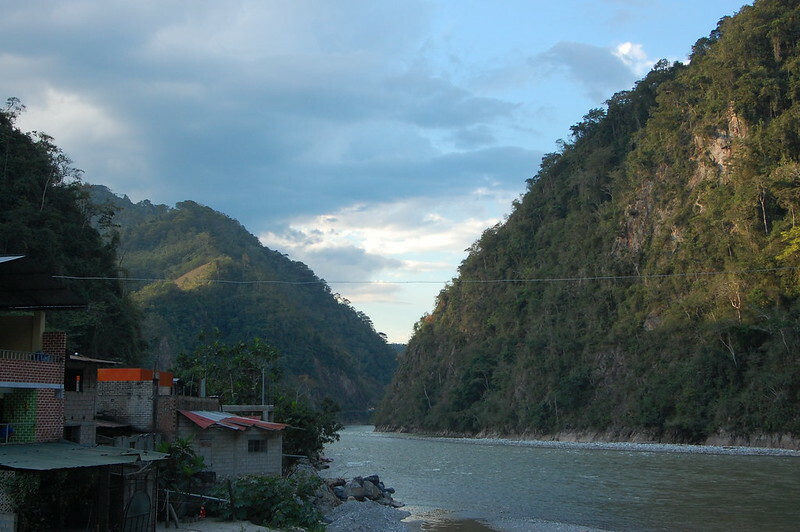 Here in Chongos Bajo, I felt like I was in the middle of the Andes, experiencing life as it occurs on a daily basis. 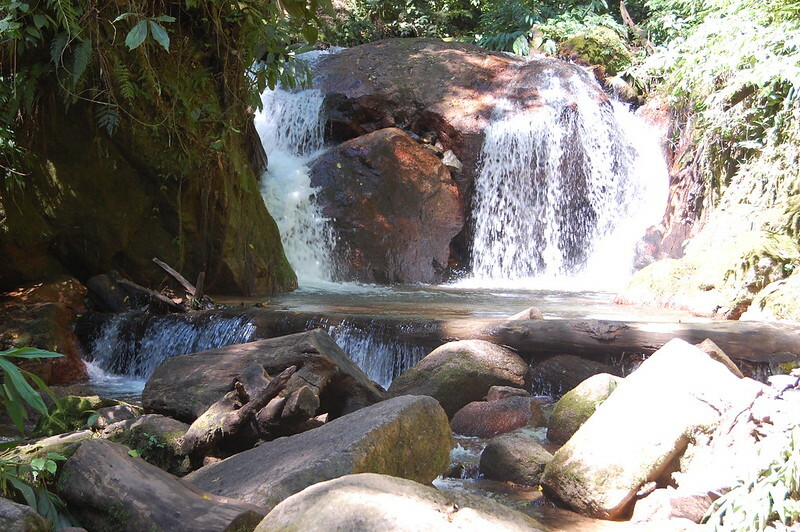 Despite its long history, Chongos Bajo is a well-kept secret in the Junín region. 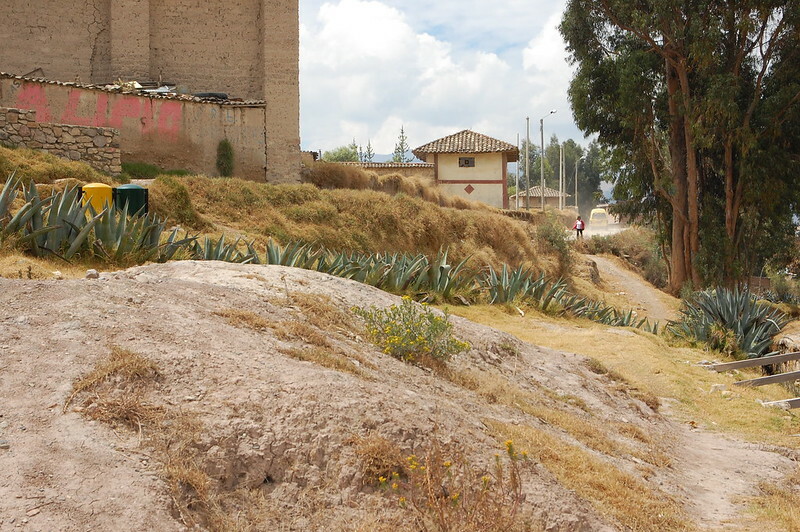 If you want to see what life is really like near Huancayo, it’s only a bus ride away. It’s towns like these that inspire me throughout my travels, and maybe it’s because I’m from a small town myself. I love beautiful landscapes and fascinating ruins as much as anyone else, but slow travel means getting to spend time exploring places like Chongos Bajo, where centuries-old traditions continue in the middle of the Andes. 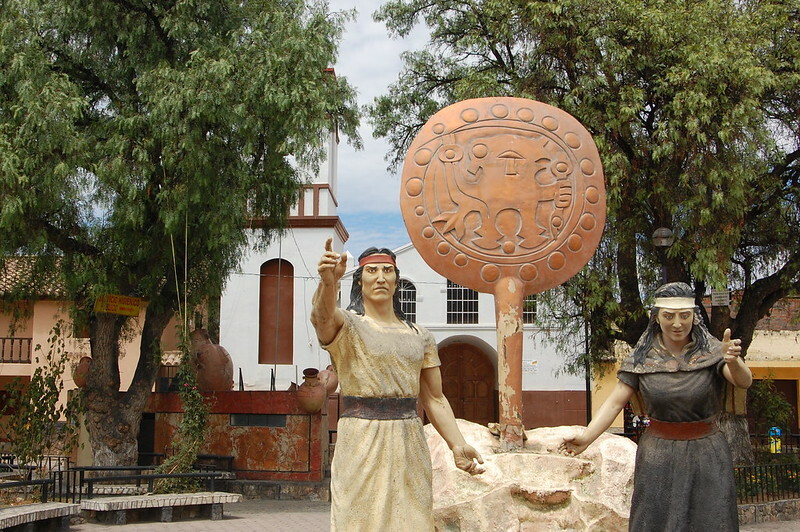 The archeological site of Wariwillca in Huari is open Tuesday through Sunday from 9AM to 1PM and then from 2-5PM. Don’t make the mistake of going on a Monday because you won’t be able to visit! 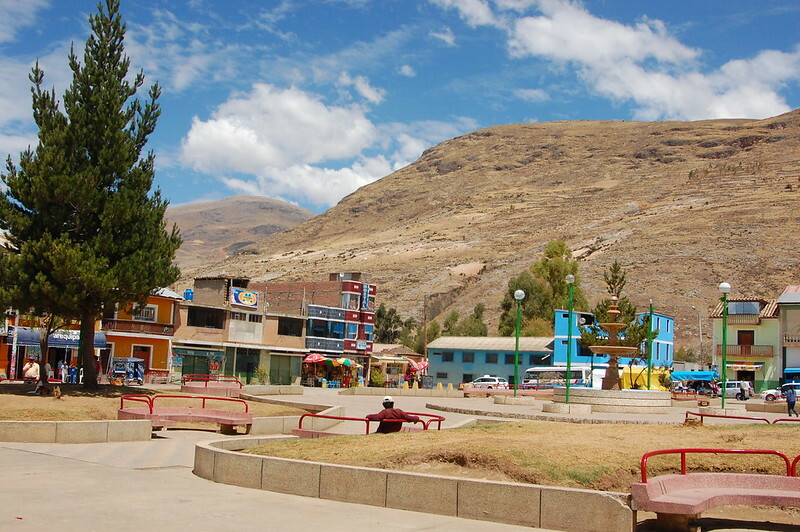 The buses to Huari leave from one of the plazas in Huancayo, but check locally to be sure. 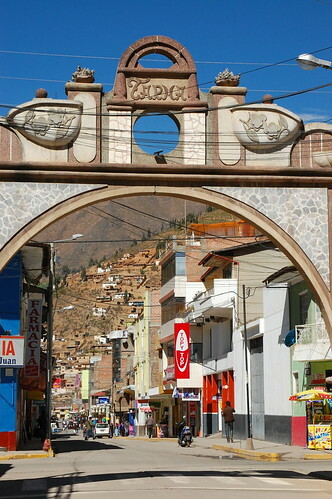 To get to Chongos Bajo after Huari, ask the cobrador or driver to drop you off at the traffic circle where you can then catch a bus to Chongos Bajo. They’re both located in the same part of Huancayo but on different combi routes, so just ask! 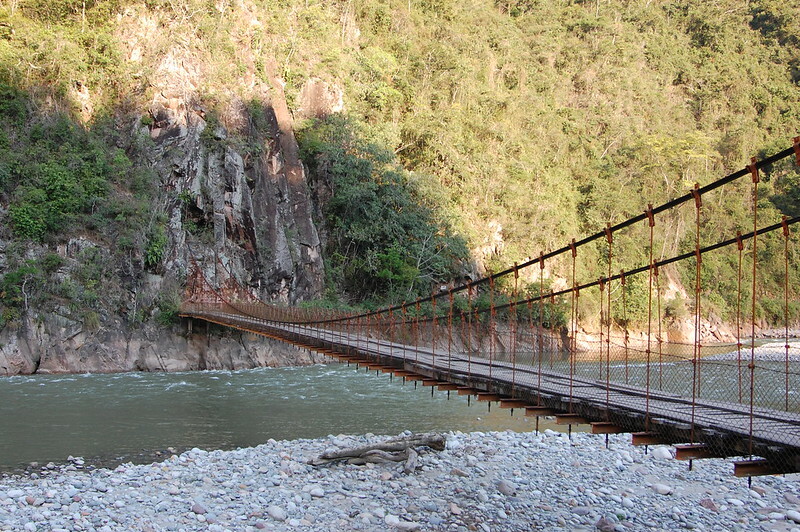 Chongos Bajo has so much history and is well-worth the visit just for the views along the way. 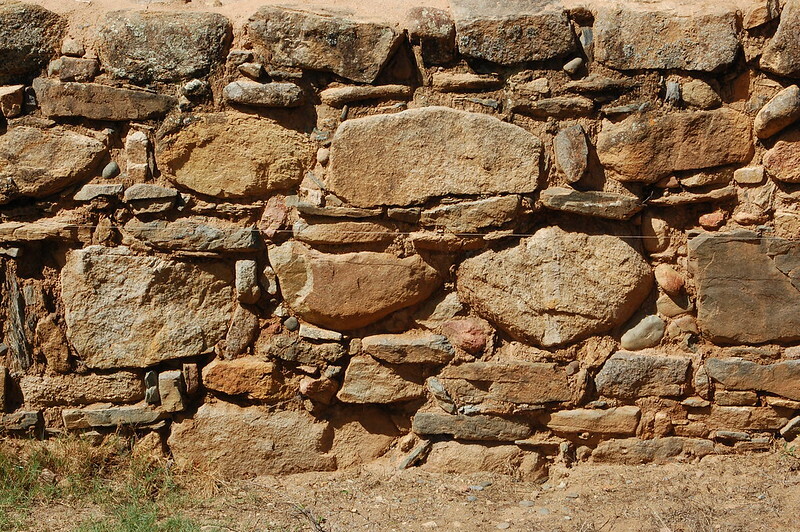 Be sure to visit the Iglesia Matriz, the Cani Cruz, and the Capilla el Copón. 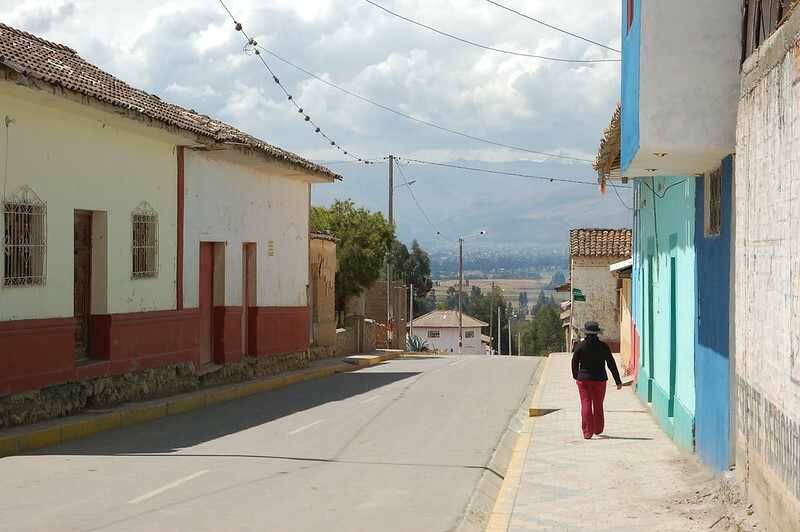 This is a rural town where you can get a sense of daily life outside the busy city of Huancayo and was probably the place I most enjoyed visiting in Huancayo (and I loved Huancayo). 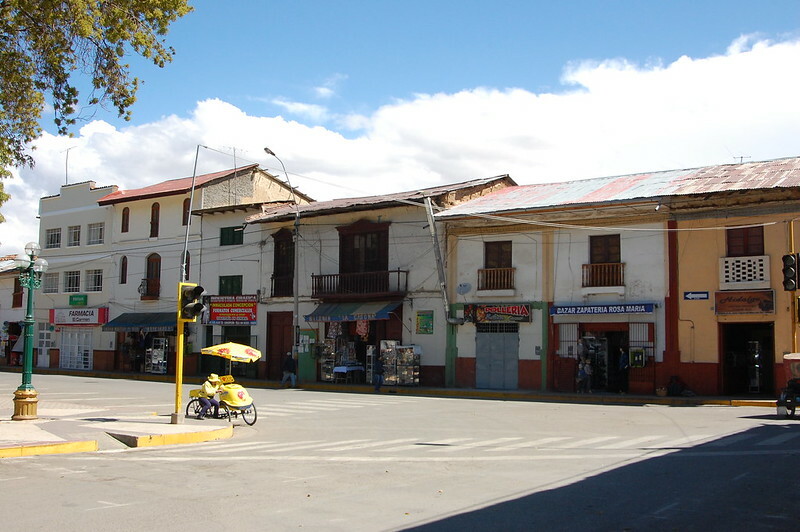 If you like small towns like this, be sure to visit Paccha and Cochas Chico along with Hualhuas, San Jerónimo, and Concepción. 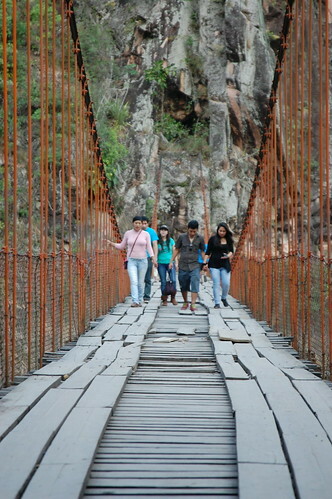 There are a lot of cool places to visit in Junín besides Huancayo! If you’re intrigued by central Peru, particularly Ayacucho, Huancavelica, and Huancayo, chances are you’re attracted by one of three things: strong artisanal traditions, the chance to experience living culture, or a deep curiosity for the history of the region. Although the views of the sierra central (central highlands) are stunning (just glance at my photos of Paccha if you’re harboring any doubts), Peru is filled with gorgeous landscapes. So there has to be something else that draws you there. 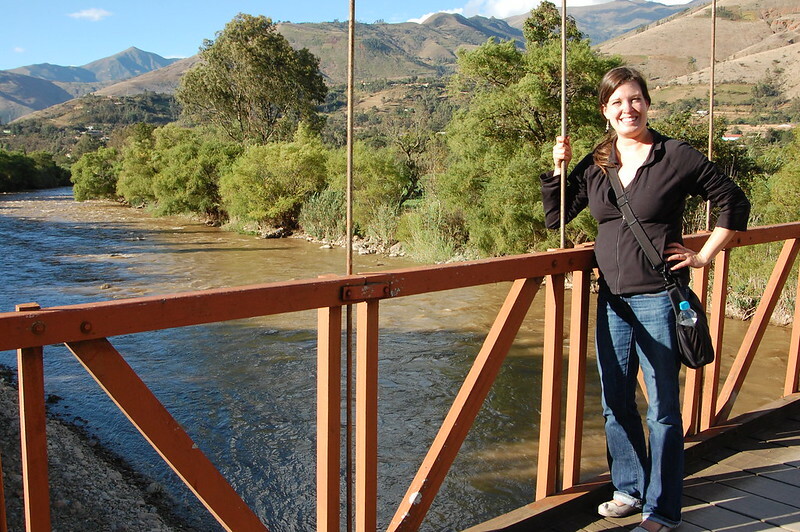 Lucky for me, they’re all easily accessible with public transportation, which gave me the chance to do a self-guided, slow-paced tour of the Valle del Mantaro. And if you have the time, I highly suggest you travel this way too. 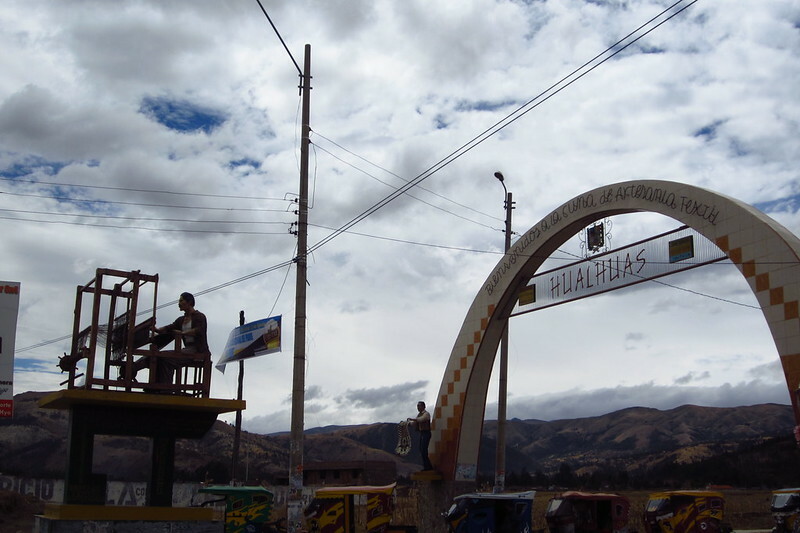 My first stop in the Mantaro Valley was Hualhuas, a small town located about 12 kilometers from Huancayo and easily accessible on one of the buses that runs between Huancayo and Concepción. My motivation to visit Hualhuas was twofold: not only did I want to see the colorful weavings that Hualhuas is known for, but I also knew that Hualhuas was celebrating its annual fiestas during my visit. After getting dropped off at the entrada (entrance) to Hualhuas, I jumped into a mototaxi to head to the main plaza. On the way, we picked up a trombone player running a little late to the celebrations in front of the church. He was a little surprised to see a foreigner on her own, but gave me a brief explanation of the importance of the music and dance and encouraged me to stick around to watch him perform. I’d arrived just on time, as the party was just getting started. Everyone from Hualhuas was hanging out in the main plaza, eating snacks from the wandering vendors, enjoying cases filled with big bottles of beer, kids running around playing with toys. And then the dances began, and I tried to find a discreet spot to watch the dancers and take pictures. As I mentioned on Instagram, most Andean dances play with power and parody, serving as expressions of cultural survival and endurance. You can see the men above are wearing wigs and often masks, whereas the women are in especially fancy versions of local dress, carrying baby dolls tied into their mantas as they dance. 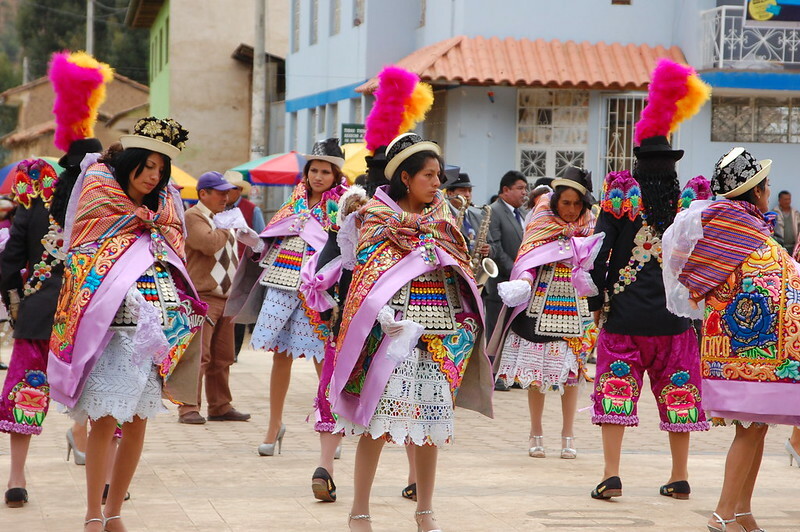 Despite my research back in grad school about Peruvian music, there’s a lot I don’t remember about Andean dance traditions, but one thing that stuck in my mind is that many of them mock the way Spanish ruled during the colonial era. You can see a reminder of those times in the mural above. 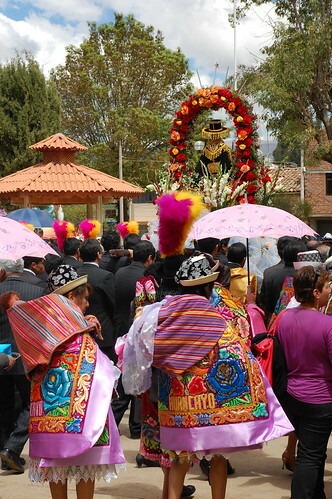 After some of the dances, the entire town joined in a religious procession around the plaza before entering the church. This elaborately dressed icon was paraded in circles, passing through artistic mats made of flower petals. 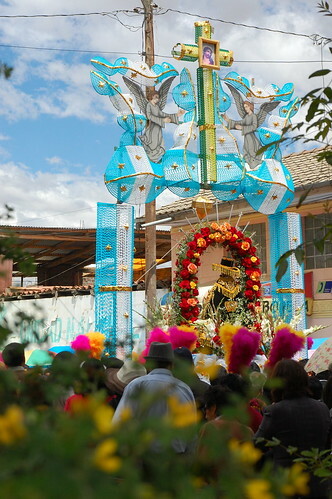 This reminded me of watching the Easter Sunday celebrations in Huaraz earlier that year. Even if you don’t understand all the aspects of another community’s devotion, it can be moving just the same. After watching the celebrations for a while, I wandered around the food stands near the plaza, hoping to find vendors selling some of those famous weavings, but I left without any luck. Thankfully, I was able to buy some at the feria dominical in Huancayo the next day. 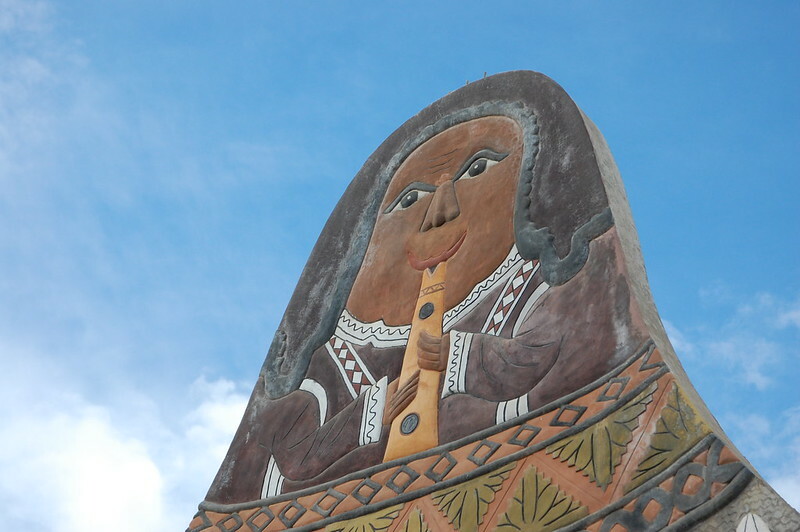 You can see that Hualhuas is called the “cradle of textile art” in the photo above! 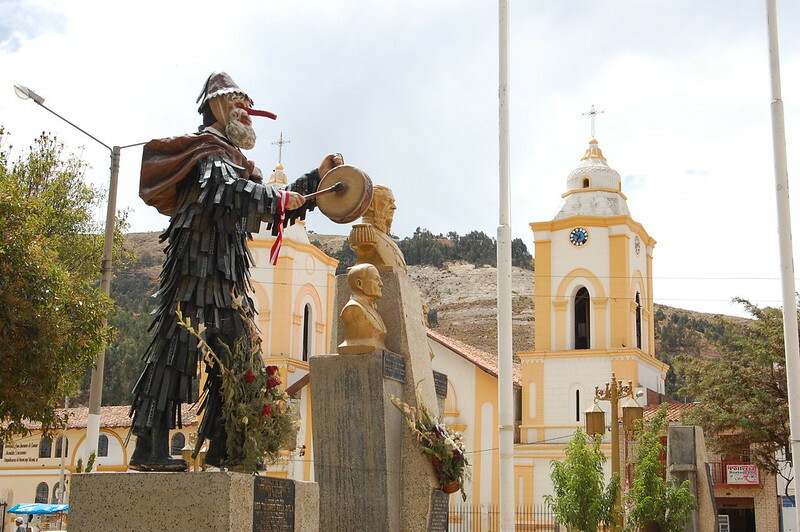 San Jerónimo is a typical small Andean town with a quiet, tree-lined plaza, attractive statues celebrating local dances, and businesses all around the plaza. It seemed that there was another fiesta going on here as well, but it may just have been a family celebration. I wandered around the plaza and over to the Saturday market, getting a sense for the place. 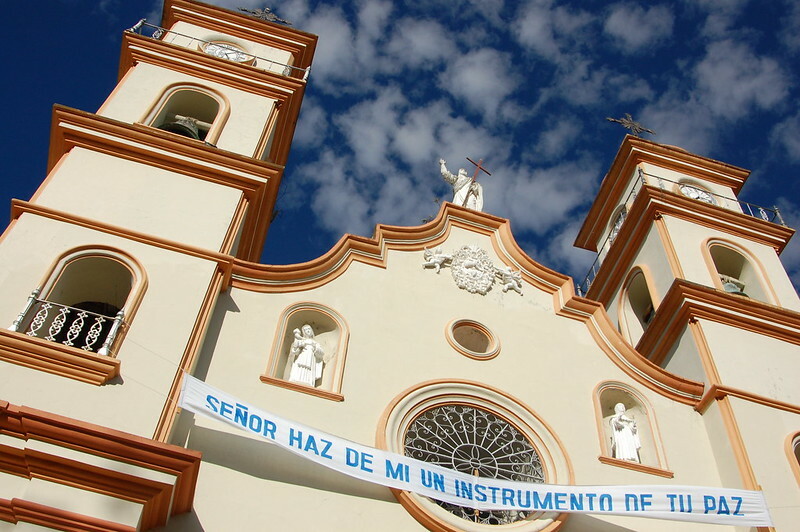 But let’s be honest, San Jerónimo is a small town; the real attraction is the jewelry. 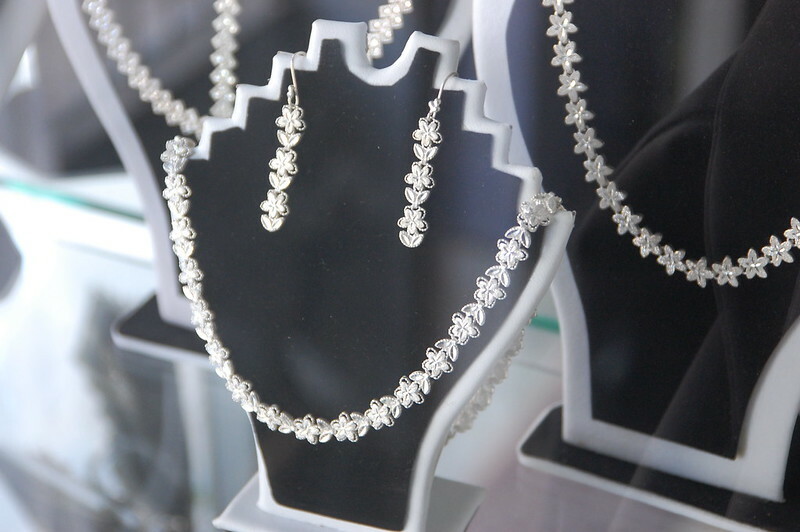 Lucky for shoppers, the main street is lined with stores selling jewelry at extremely affordable prices. There are many different stores and it’s worth taking your time to find the place that sells pieces that are more your style. If you’re into jewelry, San Jerónimo has some of the best pieces I saw in all of Peru and Ecuador. Look at those details! If you’re lucky, they may even offer you a tour of the workshops in the back. And since they do so much business, there isn’t too much pressure to buy, although you’re absolutely going to be tempted if you like jewelry! Purchases made, it was time to head to Concepción. Concepción is a slightly larger town with several churches worth looking at; it also has well-preserved colonial buildings and a laid-back vibe. I spent a little while just wandering around the plaza and taking in the buildings. 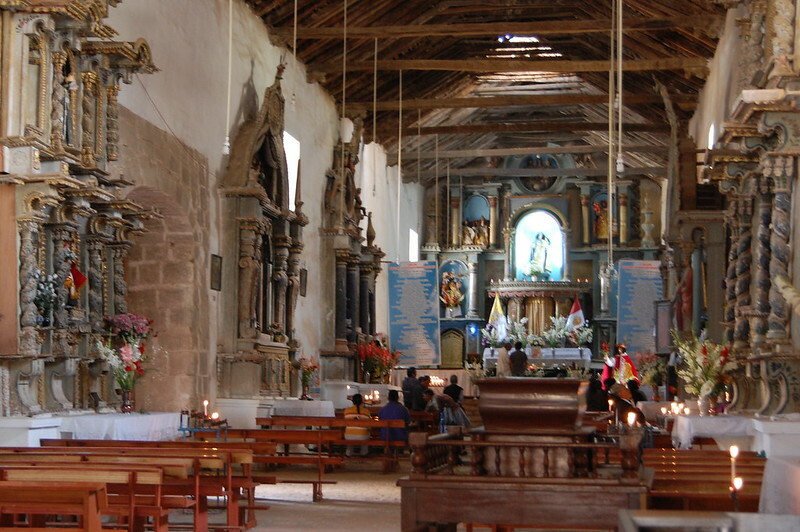 There’s a historical vibe to Concepción that reminded me a lot of Ayacucho with its many churches. So many well-preserved colonial balconies! And look at this amazing interior patio! I could have spent a couple of hours just wandering the streets of Concepción trying to spot interesting architecture. But at this point it was mid-afternoon, and I knew I had limited time to visit my final destination for the day: the convent at Santa Rosa de Ocopa. 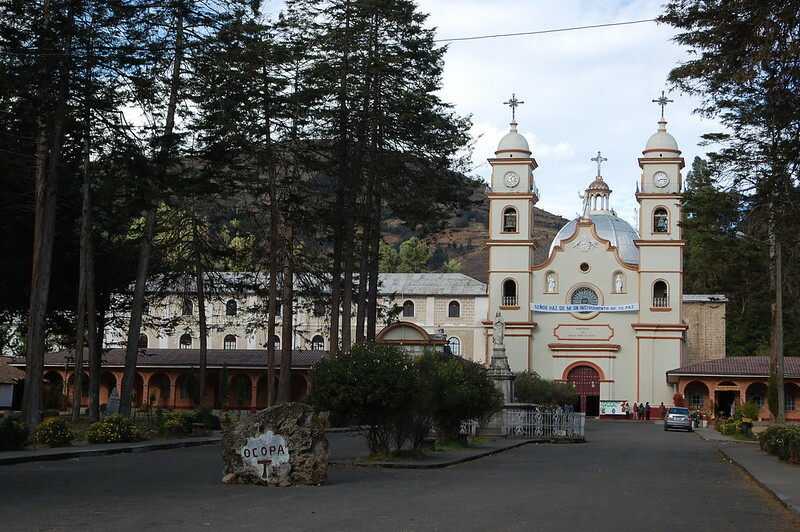 The final destination for any tour through the Valle de Mantaro is Santa Rosa de Ocopa, a convent founded way back in 1725 by the Franciscans. The Renaissance-style church is open to the public and is well worth a look, with its vividly painted artwork and colorful altars. There is also the opportunity to wander around the outside of the convent, taking in the size and peaceful location inside a forest. With few other visitors besides us, it seemed like a nice place to have a picnic and there were families hanging out there. If you want to get inside the convent, they offer tours that enable you to see a vast number of paintings in religious themes, as well as the celebrated library containing over 20,000 volumes, maps of the Franciscan missions in Peru, a small museum dedicated mostly to butterflies and insects from the jungle, and the main attraction, a brightly painted mural. Unfortunately, you can’t take pictures inside, but it gives you a sense into how this convent has operated for centuries. Regardless of how I feel about the impact of religious missions over the years, visiting the convent enabled me to understand a little more about how this tradition has influenced the region, particularly the religious art produced by the talented painters of the escuela cuzqueña. After a very peaceful tour, I headed back to the tiny plaza near the convent, where a combi was collecting passengers to head back to Huancayo. Returning was as easy as that! If you are interested in learning more about this region, I highly suggest spending a couple of days exploring the towns in the Valle del Mantaro (Mantaro Valley). You can book a tour or do as I did and head there on public transportation. Though it takes longer and I probably saw a little less, I appreciated the time to wander about on my own and get a sense of the small towns in the region. 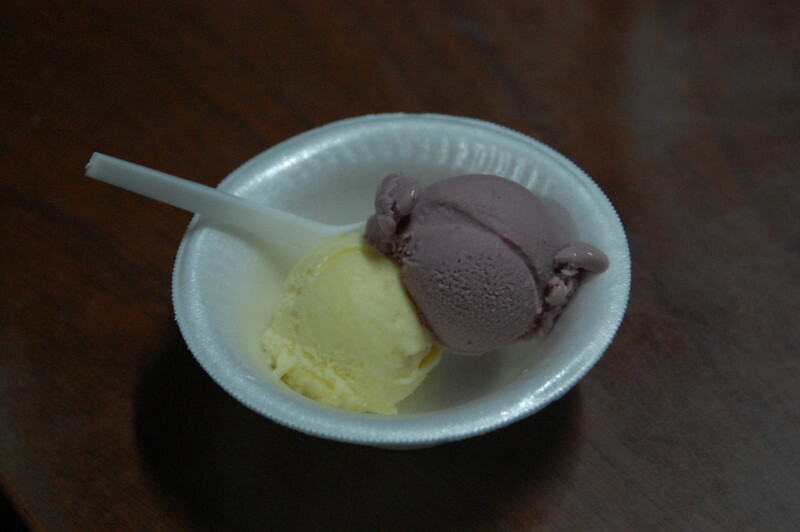 The tours to the Valle de Mantaro start in Hualhuas, head to San Jerónimo, and then head to a milk-processing plant near Concepción where you can try yogurt and cheeses. 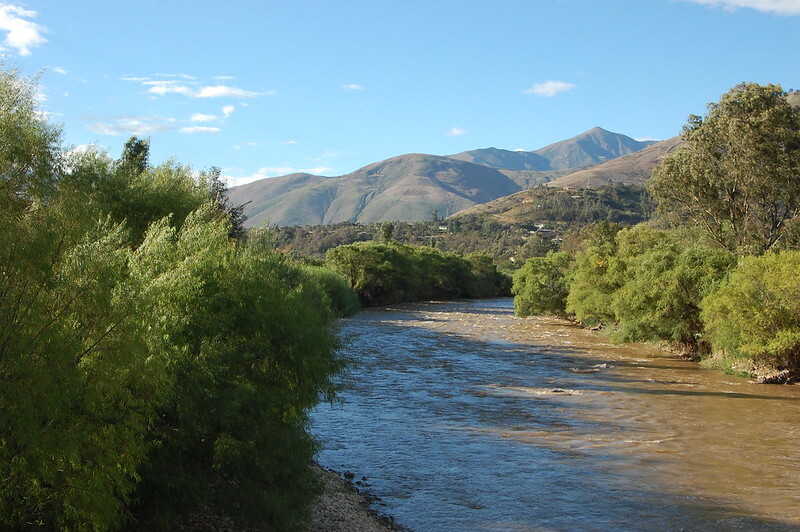 From there, they head to Jauja to take a boat ride on the Laguna de Paca (which looks beautiful), followed by lunch at Ingenio, where trout are raised. Finally, they end at the convent. That’s a lot to squeeze into one day and I preferred to take my time, just visiting Hualhuas, San Jerónimo, Concepción, and Santa Rosa de Ocopa. While you can buy weavings from Hualhuas at the Feria Dominical (Sunday Market) in Huancayo, you can’t really find the selection of jewelry that is available in San Jerónimo, and it’s well worth your time to head to all the shops in San Jerónimo. You just get off the bus at the entrance to San Jerónimo and walk in and there they are! If you only have time for one place, make it this one. 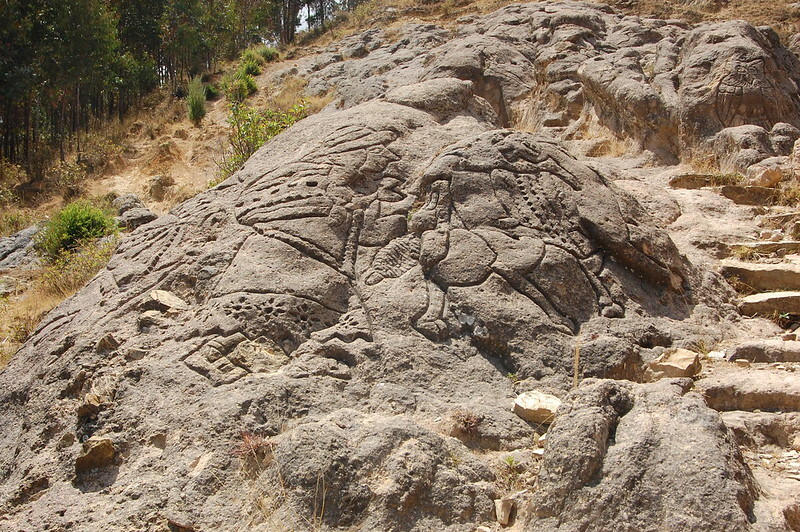 Besides Hualhuas and San Jerónimo, nearby Cochas Chico is known for its carved gourds, or mates burilados, which I describe in more detail here. If you like hats, San Agustín de Cajas is known for its traditional hat-making and is located near Cochas Chico, only 15 minutes from Huancayo. I thought I would head there but the weather wasn’t super cooperative during my visit. More info here (in Spanish). 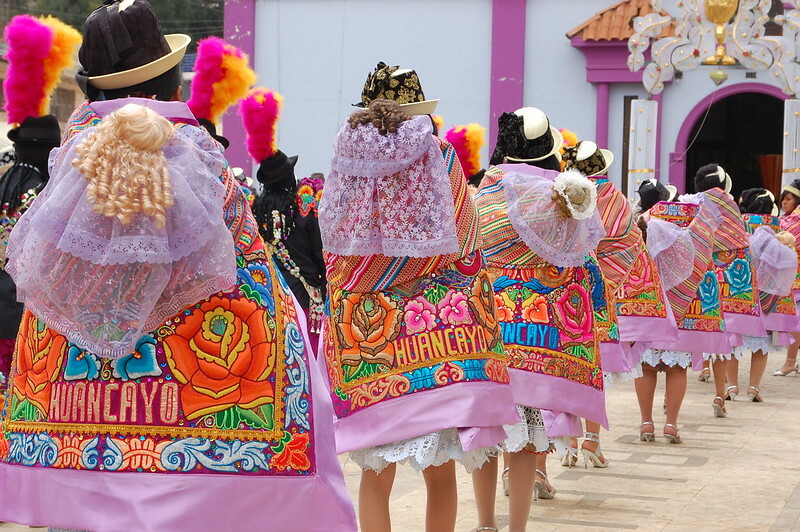 The excellent English language blog Vida Huancaína has posts on Hualhuas, the Festival San Roque in Hualhuas in 2014 (my photos are from 2013), and San Jerónimo. 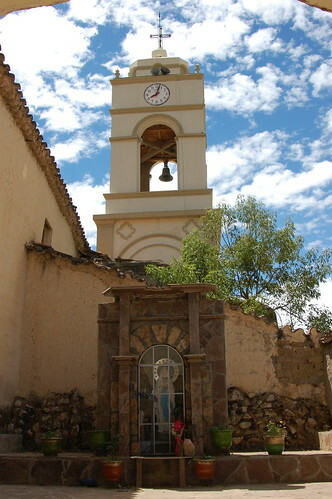 A tour of Santa Rosa de Ocopa costs S/.5 and leave on a set schedule, so you may want to check the hours of operation before visiting (they take an extended lunch break from 12-3PM). The last tour is at 5PM. Buses to Concepción leave from Av. Ferrocarril in front of the mall/market and have a frequent schedule so you can get on and off. There are also colectivos (shared taxis). I spent a grand total of S/.9 the whole day! 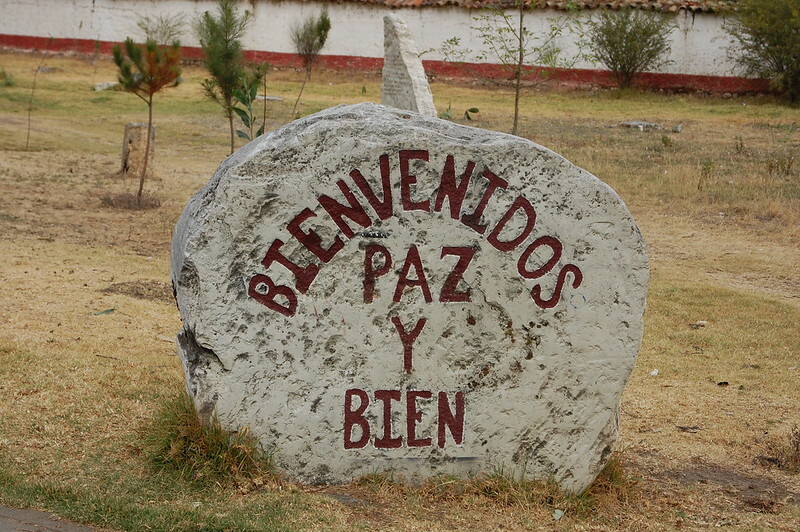 Arriving in Huancayo just before my birthday, I wanted to make sure I did something special to commemorate this once-a-year occasion, but how should you celebrate if you don’t know anyone in town? As I wandered through the center of Huancayo, I stumbled across one of those tourist information stands that actually double as a tour agency, curious about what kind of adventures I could have in the area. Well, luckily for me, the person manning the stand was actually a professional tour guide covering for his friend. 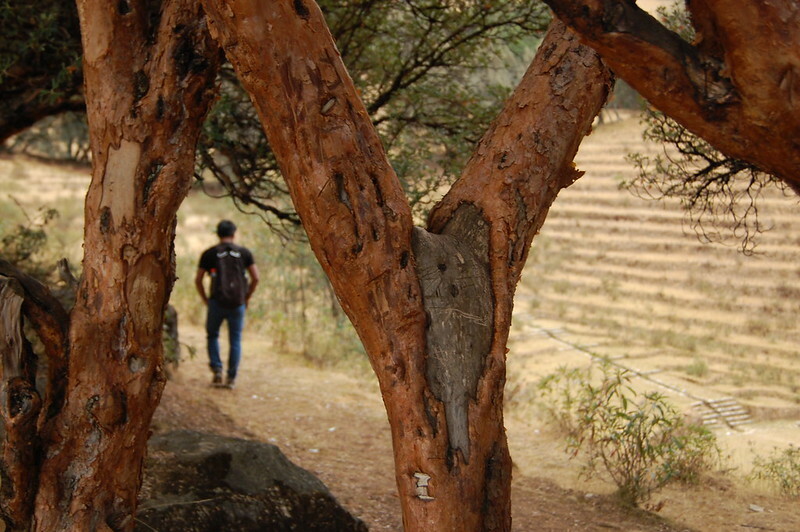 So when I told him I really wanted to get out in nature for my birthday, he had the perfect suggestion: a hike up to Paccha to see the Bosque Dorado and down to Cochas Chico to learn more about the art of mates burilados. And since it was his day off, he offered to join me on a low budget adventure. That’s the universe providing a birthday gift! 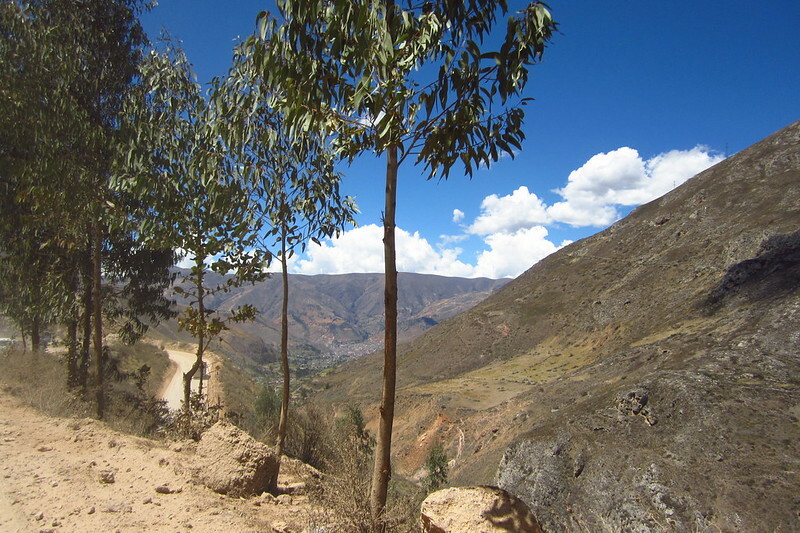 Getting to Paccha from Huancayo is fairly straightforward. We headed to Av. Ferrocarril, right in front of the markets by Real Plaza shopping mall and the mercado, and waited until we spotted a bus to Paccha (the destination is on a placard in the window of the bus, but you can always check with the cobrador to verify the final destination). 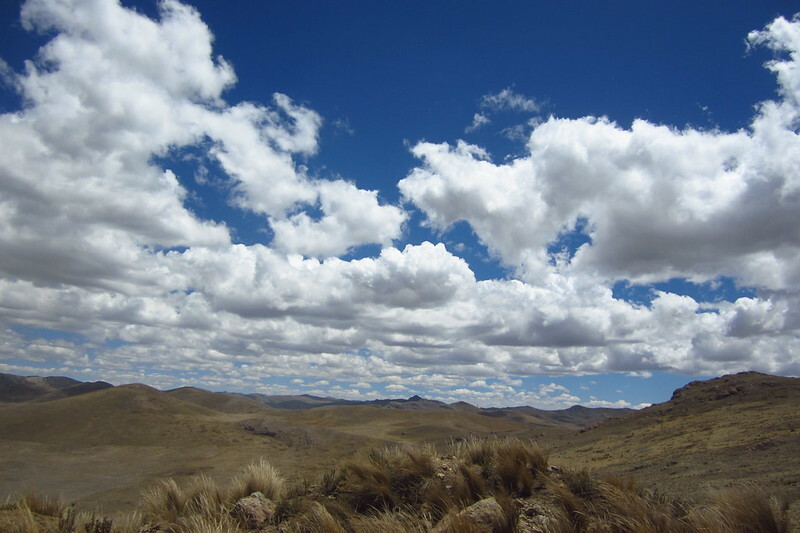 Paccha is just 10 kilometers outside of Huancayo in the gorgeous Valle de Mantaro, and to hike up to the Bosque Dorado you need to get off at the last stop. 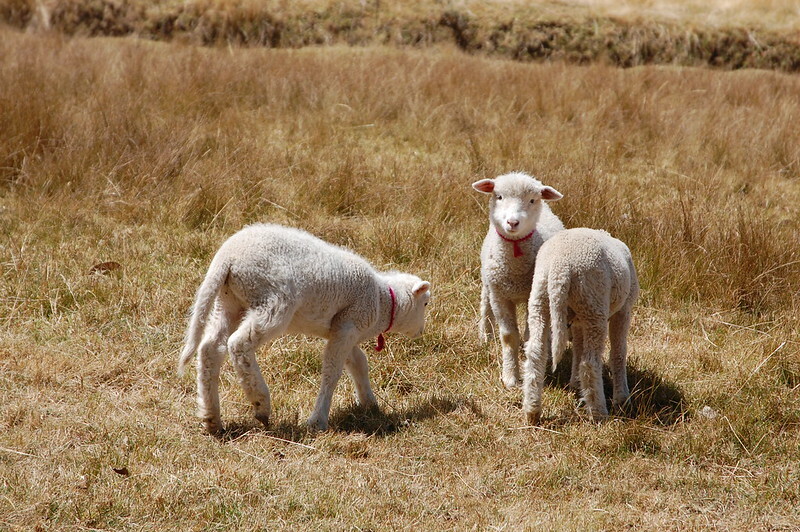 Like many of the towns in the Valle de Mantaro, Paccha is all about farming, so we were greeted by these adorable lambs. After buying some more snacks and provisions at a little shop at the bottom of the hill, we set off on our walk up towards el Bosque Dorado. While totally doable, the walk is pretty steep and at altitude, so you should be in pretty good hiking shape or be prepared to stop a fair amount along the way. That gives you a chance to appreciate the views. On our hike, we ended up being joined by another companion, this one canine. This dog decided to hike with us the entire way (it may have been the food in our backpacks he was actually interested in). I only hope he found his way home afterwards – it was a long journey! So the journey continued up and up and up, with the views getting more broad and sweeping as we increased in elevation. Look at those treelines! Look at those storm clouds! I particularly appreciate the natural patterns made by the crops in the valley below, and the contrast between the healthy green trees and toasted brown fields. About halfway up the hike, we came to our first destination: these carved rocks that tell the story of Huanca traditions and culture. In this picture, you can see a woman dressed in the local style carrying a load on her back inside her manta (a cloth tied around her neck, used to carry both babies and heavy items!). You can also see a pack animal and an owl in the background. 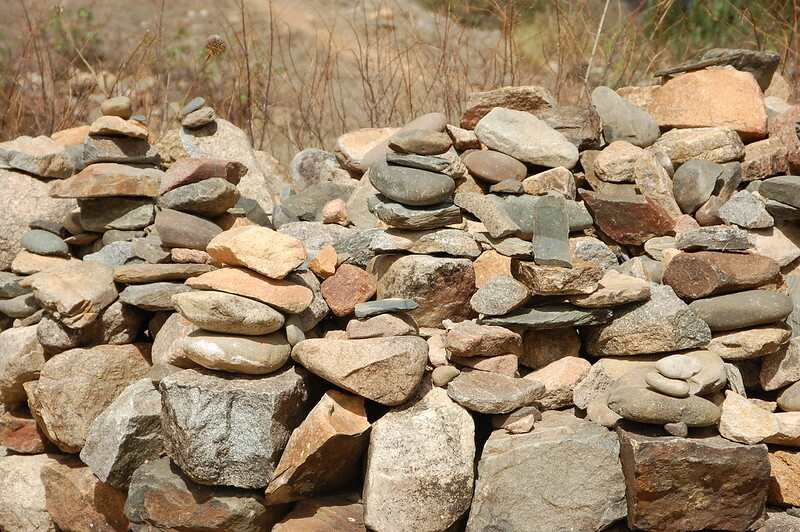 According to my new friend, these rocks were carved by the community as a fun celebration of local culture. 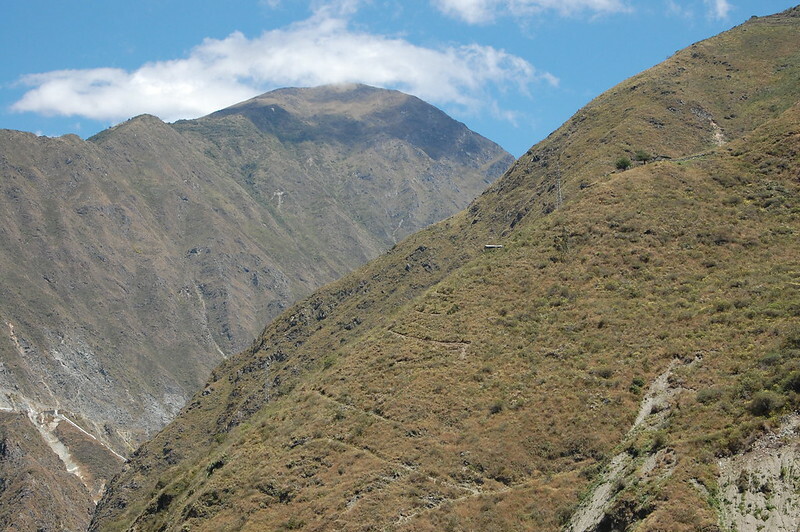 And we continued our climb up, and up, and up… Wouldn’t you fall in love with the Valle de Mantaro too? 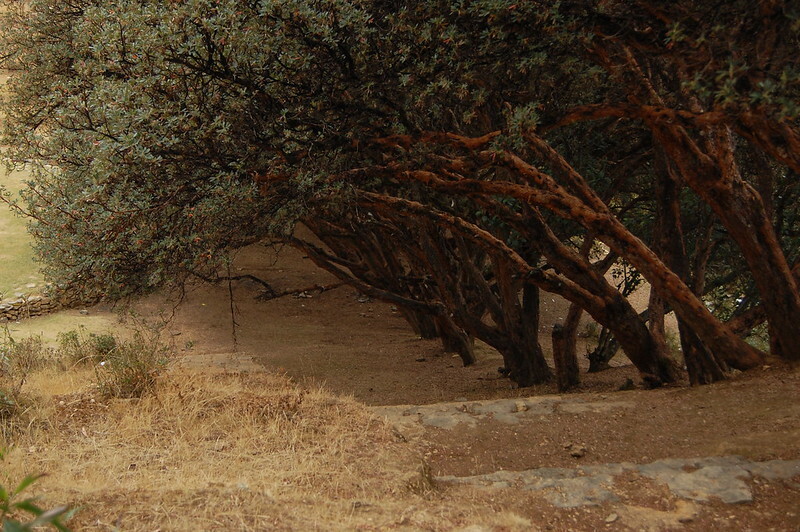 Finally, we reached our first destination: the Bosque Dorado, or Golden Forest. This forest is named due to the quinual trees. 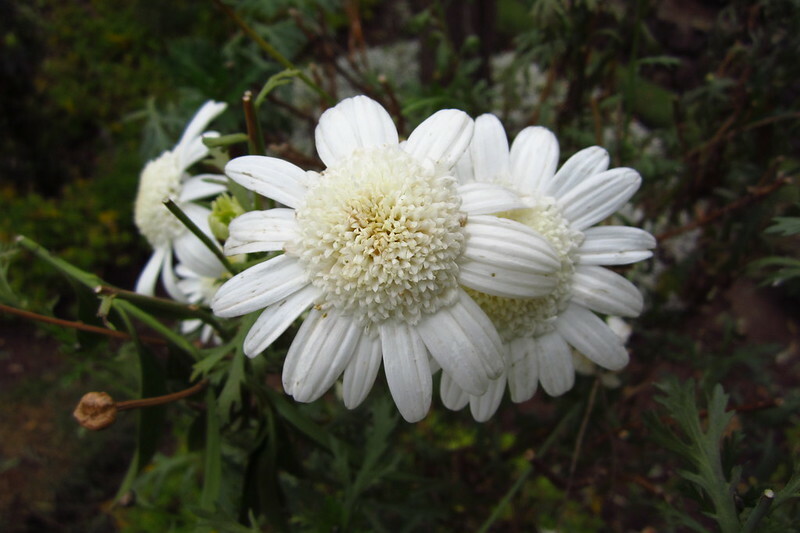 The quinuales are native to Peru, Ecuador, and Bolivia and are threatened with extinction so are preserved by locals as much as possible. 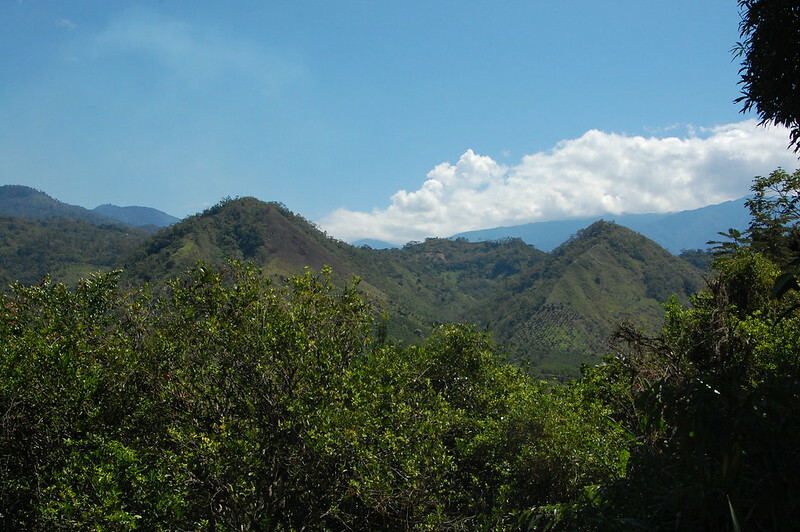 According to my research, this area was restored through reforestation with an eye toward preserving native plants and other types of trees and bushes. I particularly loved the look of the trees creating natural shade along the paths around the amphitheatre. This ended up being natural protection for rain – just as we sat down to start our picnic, the skies opened up and it started pouring! So we ran underneath the trees and then to a nearby cave… hence why I don’t have any photos of just the amphitheatre! Thankfully, the storm passed quickly and we were rewarded with even more beautiful views of the valley – and of course, my favorite clouds. 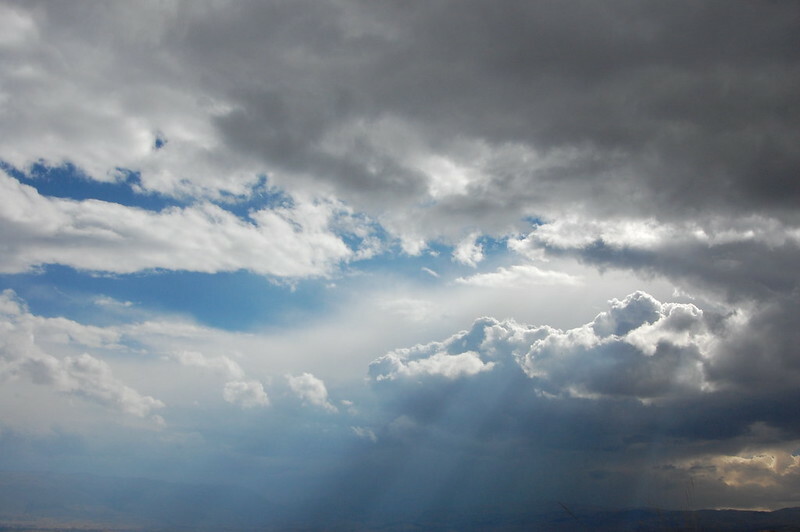 This continues to be one of my favorite pictures from my travels, with the skies opening up and the sunrays peeking through the clouds. After sufficiently admiring the views (I took a lot of photos and had trouble narrowing them down for this post), we left our perch above the Valle de Mantaro and continued our hike down to Cochas Chico. Downhill was much easier than uphill. I mentioned recently on Instagram that the reason you see so many small towns in Peru dedicated to one specific type of artesanía, or handmade folk art, such as knitting, weaving, pottery, woodworking, or silversmithing dates from the Spanish colonial era. The Spanish wanted to keep the locals busy so each town became known for one specific type of craft. To be fair, this tradition has been in the Andes for centuries – the pre-Columbian cultures were master artisans and their stories were encoded in their designs. Keeping subjugated peoples busy and paying tribute was a priority for all the conquerors, including the Incas and their many predecessors! 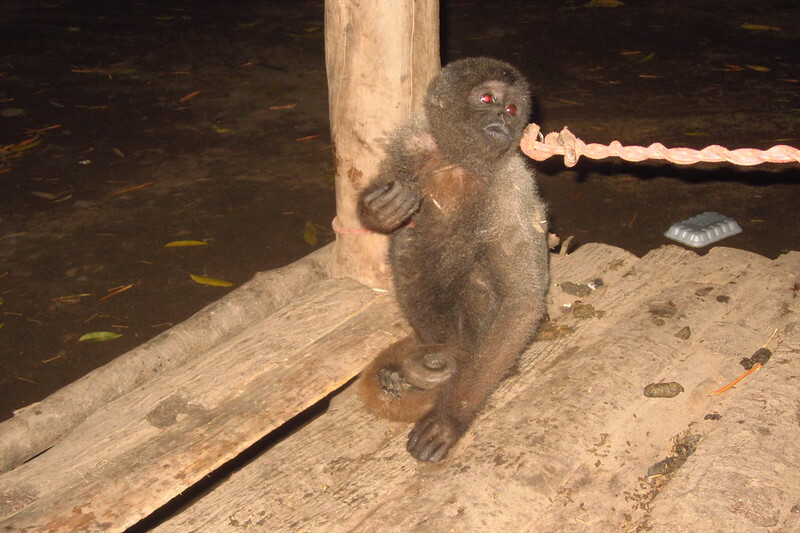 As you can probably guess from the photos above, Cochas Chico is known for its mates burilados. Mates are dried gourds; you may be familiar with yerba mate, the strong herb drunk throughout Argentina, Uruguay, and even Paraguay, Brazil, and Chile. Well, yerba mate is drunk from a mate, usually a hollowed out gourd. 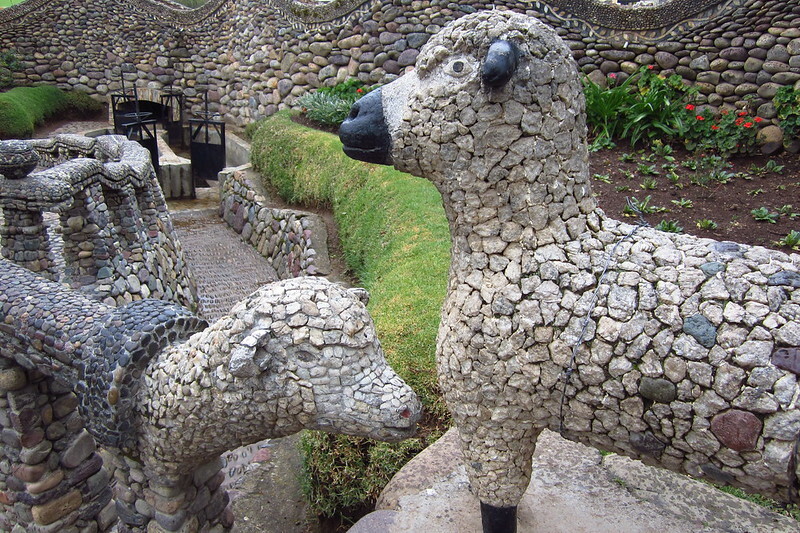 In Peru, these mates are carved using a stick from the quinual tree fitted with a steel tip. The designs are intricate and depict daily life in the Valle de Mantaro, pastoral scenes including people and animal and crops. To get different colors, artisans use techinques that involve coating the surface, burning the surface and carving with burning tips. It’s pretty fascinating stuff. 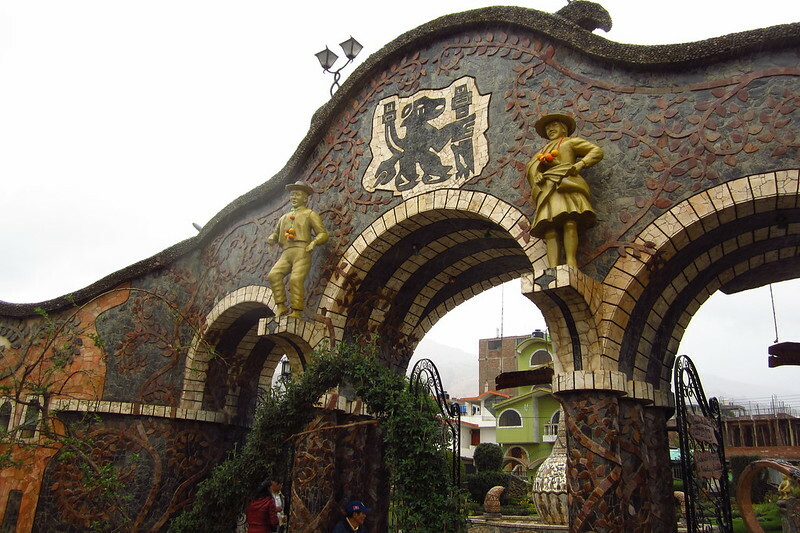 As I mentioned in my post about Huancayo, this region loves its themed parks. 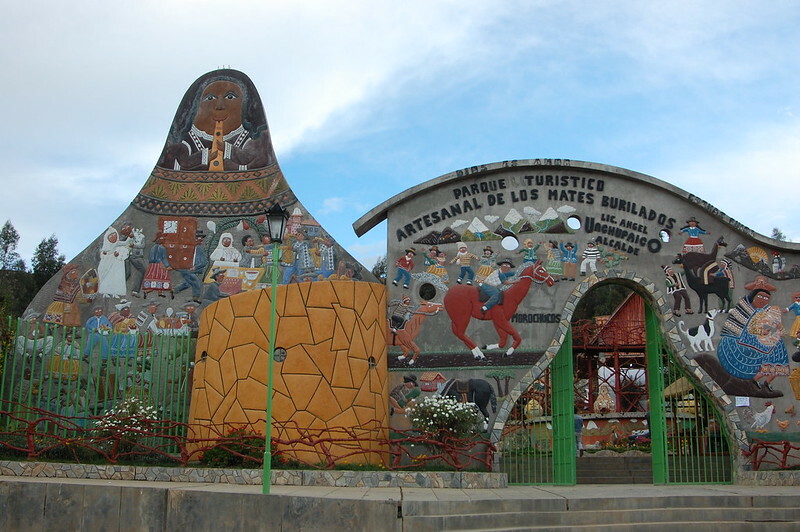 The Parque Turístico Artesanal de los Mates Burilados (the Artisanal Tourist Park of the Carved Gourds) is dedicated purely to the art of this tradition. 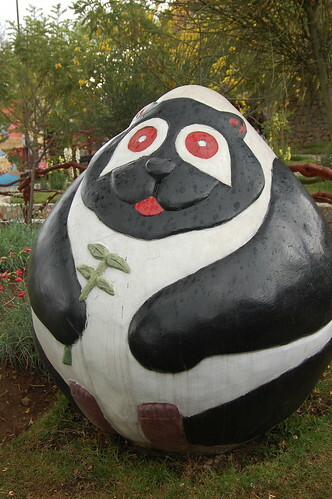 Throughout the park, there are giant sculptures echoing the same styles that you see in the tiny carved gourds. Yes, that means birds and cuy (guinea pig) and other animals. There’s a little bit of everything at this park, and it is adorable. Besides the giant sculptures, the artisans have stalls set up and sell their amazing pieces of art. There are more accessibly-priced pieces in much more simple styles, and then there are the true treasures, intricately carved gourds that tell stories. Remember that I mentioned above that the pre-Incan cultures told their stories through their artwork? That tradition continues through today. I chatted for quite a while with one of the artisans there, who walked me through the process and explained her particular style and technique. Of course I bought a piece for myself (and gifts for my family! ), but since it’s in storage, here’s a link to a photo of some mates burilados so you can get a sense of what I’m talking about. Despite the rain, the visit to Cochas Chico was absolutely worth it. We just visited the park, but apparently you can also visit the artisans’ workshops. 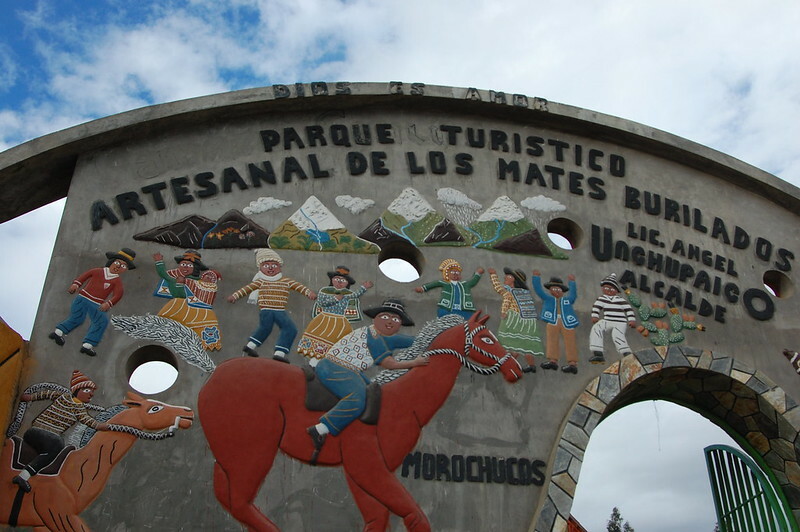 As you can see, visiting Paccha and the Bosque Dorado de los Incas and Cochas Chico and the Parque Turístico Artesanal de los Mates Burilados was a perfect easy day trip from Huancayo. 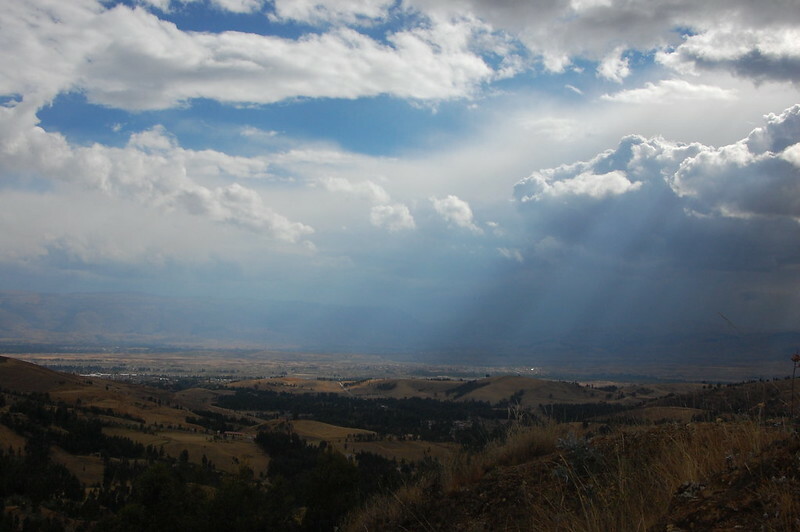 There was a little bit of everything I love: hiking out in nature, amazing views, lots of cool clouds, and, of course, artesanía with a history and culture lesson thrown in for good measure. All in all, an excellent birthday. 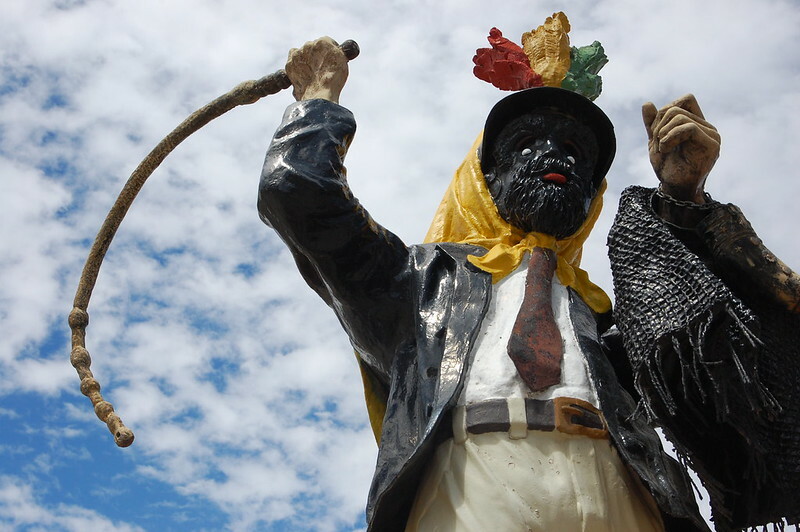 Paccha is only 10 kilometers for Huancayo, and Cochas Chico is even closer, so you basically have no excuse to avoid going here on a day trip from Huancayo. 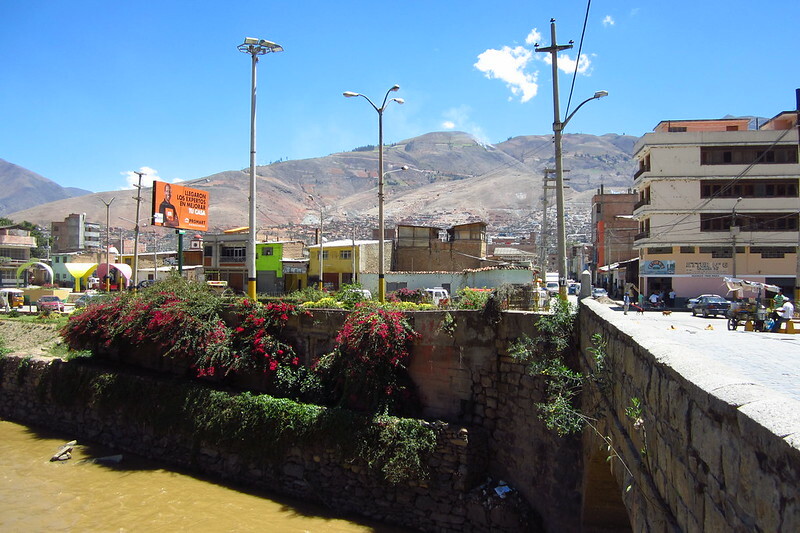 There are buses that run to and from Paccha and Cochas Chico from the center of Huancayo. I suggest waiting on Av. Ferrocarril and checking the placards in the front of the bus. If you’re not interested in the hike, there are more frequent buses to Cochas Chico, but el Bosque Dorado was totally worth it. 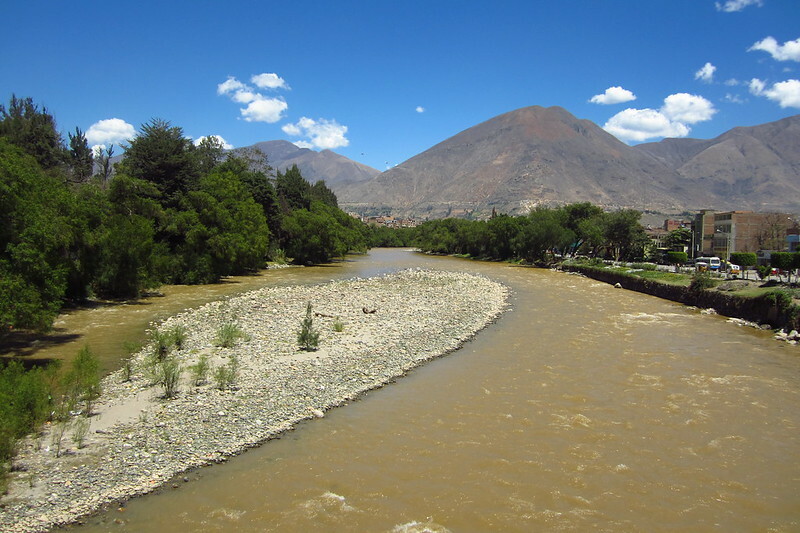 My favorite English language Huancayo blog is Vida Huancaina, and since they lived in Huancayo for a year, they most definitely visited the Bosque Dorado and Cochas Chico. You can get their take on it at those links, and there is a great photo of the artisans carving the gourds! There are some excellent photographs of the Bosque Dorado here. And if you read Spanish, this article tells a little more about the history of the project. Let’s go back in time a couple of years. One of the goals of my #100daysofsouthamericanmemories project has been to revisit the second half of my extended backpacking adventure back in 2013, sharing stories and photos on Instagram and picking up the narrative where I left off here on the blog. 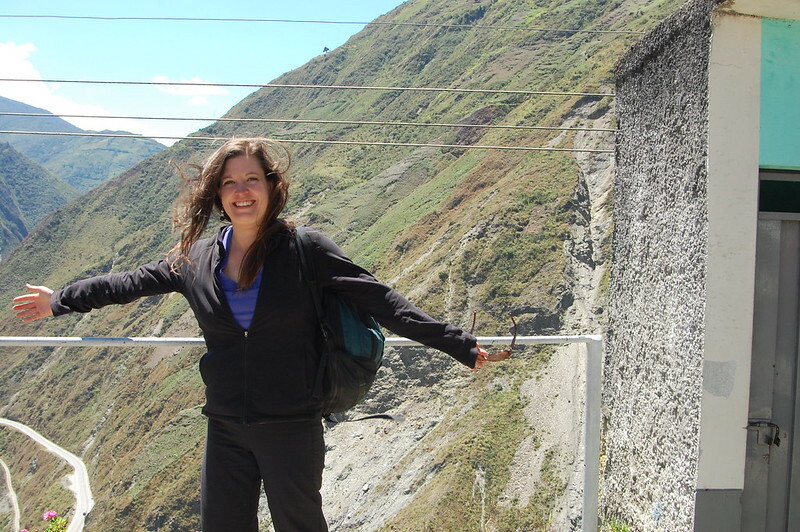 Before I moved to Chile at the end of 2014, I was enthusiastically sharing stories about my travels in central Peru. Visiting the sierra central (central Andes) was one of my travel dreams and the first opportunity I had to really get to know Peru off the beaten track. 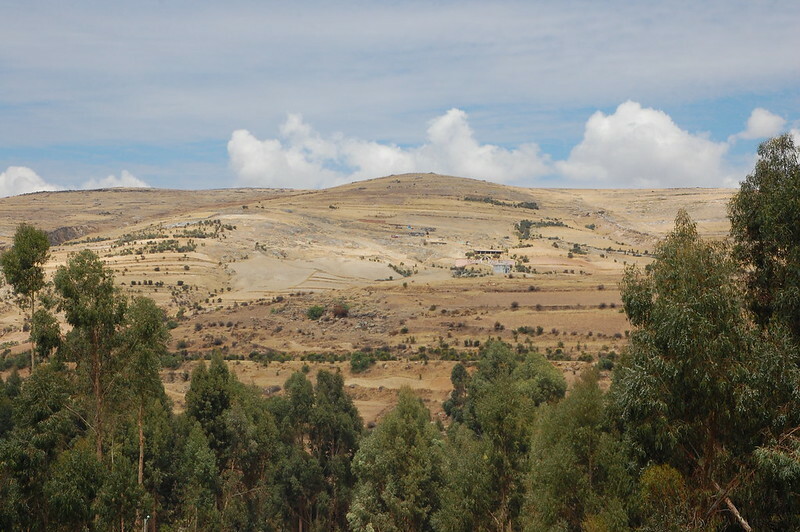 I started in Ayacucho, headed into the mountains of Huancavelica, and then took the Tren Macho to Huancayo. Because that trip marked a changing point in my life, the memories are as vivid as ever, and it has been powerful to share snippets of life on the road in short Instagram posts. As hoped, this has created the necessary momentum to pick up the threads from three years ago and keep on weaving this blog, which I still hope will help readers consider other destinations that take you deeper into the heritage of this fascinating region of the world. 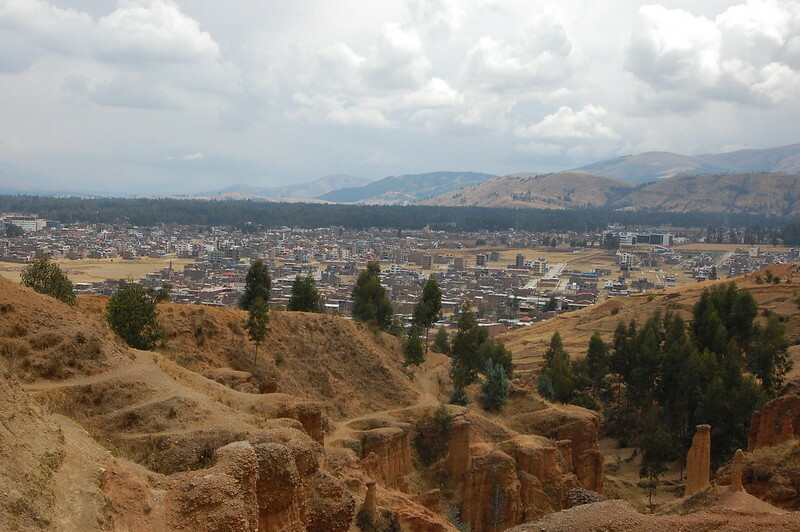 Huancayo is imprinted on my memory as one of my favorite cities in Peru. 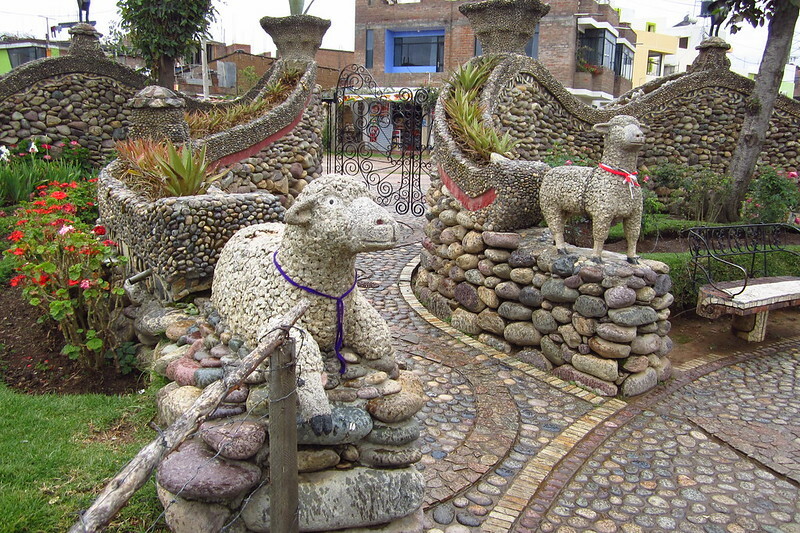 I was enthusiastic about visiting Huancayo because many of the families I worked with in Huaycán were originally from Huancayo, and I was curious to learn more about this very agricultural and very artistic region. 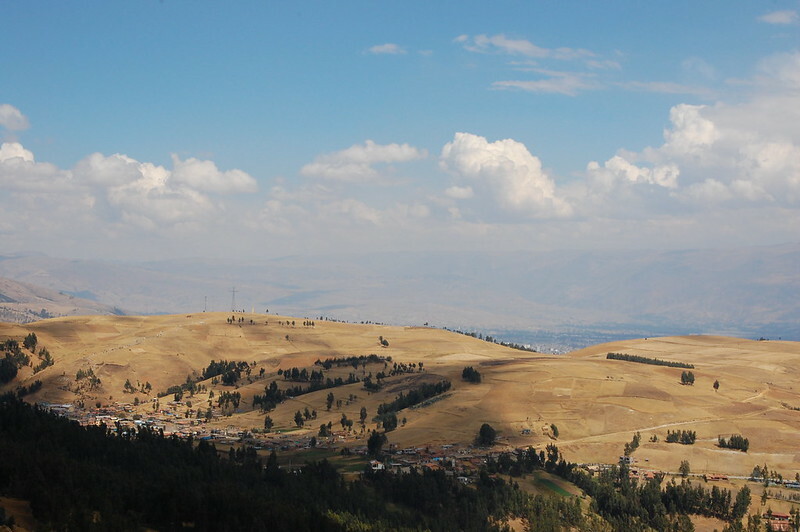 I pulled into Huancayo on a train the day before my 32nd birthday, curious what the city had in store for me. Well, there was one thing for sure: a lot of rain. 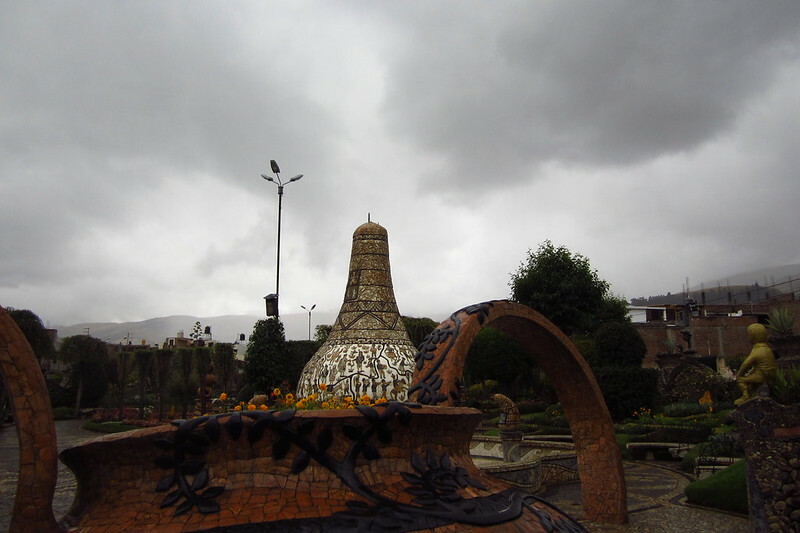 It says a lot about the city that the fact that it rained consistently throughout my stay didn’t mar my high esteem for Huancayo and the Junín region. 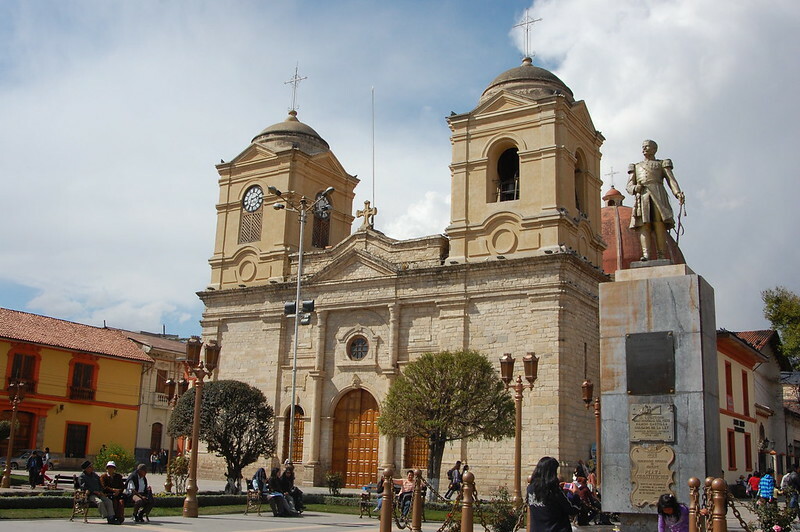 As always, I dropped off my heavy backpack and headed directly to the Plaza de la Constitución, Huancayo’s main square, where I admired the cathedral and got my bearings. Because Huancayo is relatively close to Lima, there were a number of Peruvian tourists milling about, but I only spotted a handful of fellow foreigners in my week there. 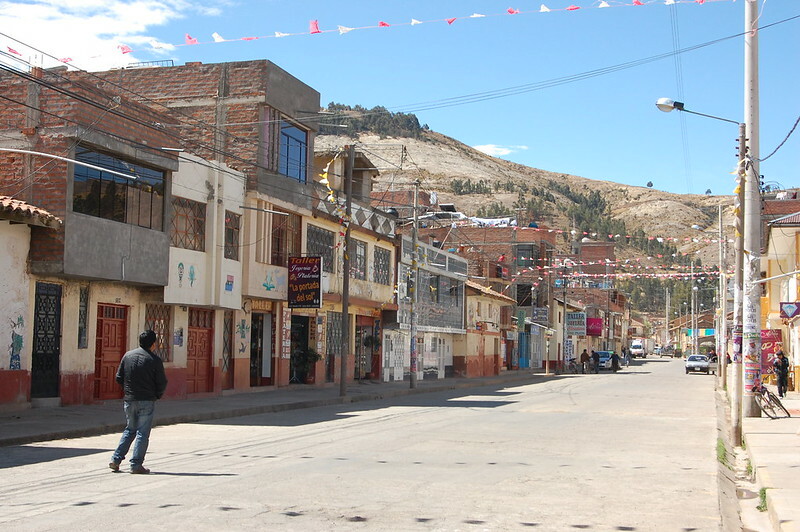 The commercial center of Huancayo is relatively compact, walkable, and easy to navigate. 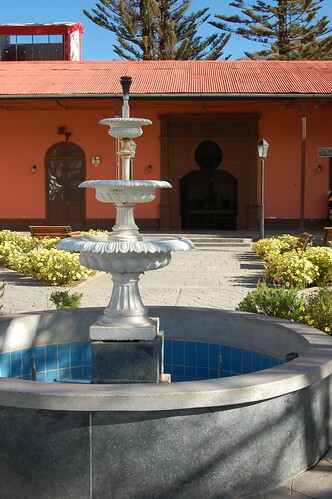 You can visit the pretty plaza where the municipality building is located and head to the (commercial) artisan market. A few blocks away, you’ll likely spot the blue towers of the Iglesia Maria Inmaculada (much more beautiful on a sunny day, but what can you do?). 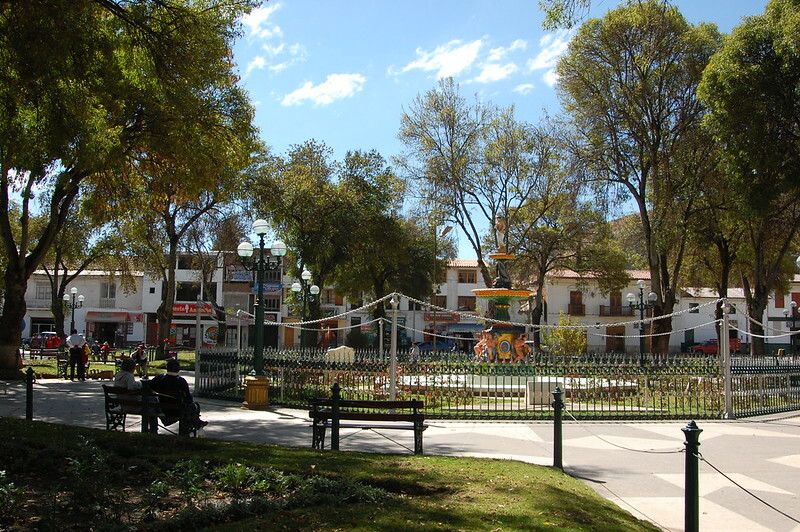 But if we’re being honest, Huancayo’s appeal lies in its creative parks, located all over the city. 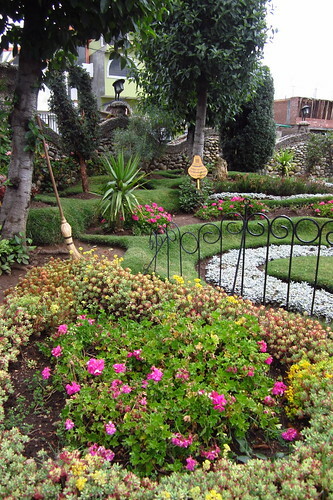 Cerrito de la Libertad, located up a steep hill en route to Torre Torre, is filled with beautifully landscaped flower gardens, a pleasant gazebo, and a playground for kids (as well as a small zoo). Cerrito de la Libertad is provides a good vantage point over the city, although for the best views you should continue up to Torre Torre. 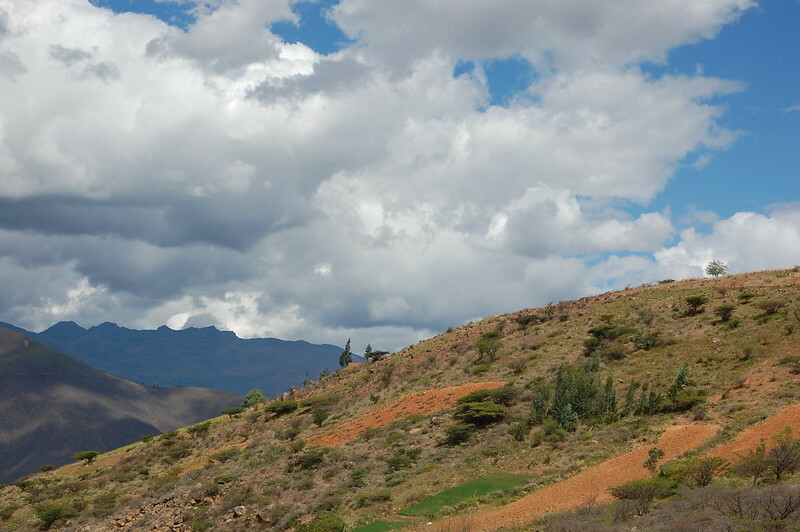 As I continued climbing into the hills of Huancayo towards Torre Torre, I was struck by the different atmosphere just a couple of kilometers outside the hectic downtown area. Suddenly I was out of the commercial buildings and into the simple brick constructions typical of the farmlands that are found throughout the Valle de Mantaro. After following the signs leading to Torre Torre, I ended up at these fascinating rock formations, shaped like towers (hence their name). I’m a big fan of red rocks, so these certainly did not disappoint! The sun even managed to peek out from behind the clouds for a couple of pictures. Visiting Torre Torre felt otherworldly for a moment, as I faced the rocks away from the houses behind me. As I was standing there admiring the view, I heard a woman call to me from below; she was herding her goats at the base of the rocks and suggested I get a different view from that angle. Nervously watching the skies and unsure of my climbing ability, I decided not to scramble down (or up). When no one knows where I am, I tend to err on the side of caution. But I definitely was sure to admire the views as I descended back through the neighborhoods on the outskirts of town. 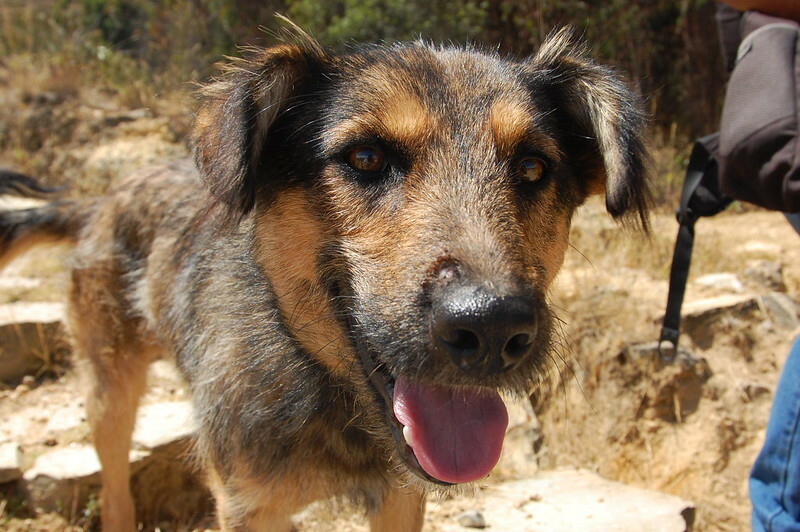 Word to the wise – be careful what route you take through Cerrito de la Libertad on your way back, as neighborhood dogs can be aggressive. On the other side of Cerrito de la Identidad you find the Parque del Ajedrez, a small park dedicated to the game of chess (which is quite popular in Peru). Totally worth stopping by if only to admire the creativity of the stoneworkers who set up this homage to chess. Thankfully, at this point I was just a few blocks from my hostel, because the skies decided to open up as I arrived back. Saved by the bell once again! 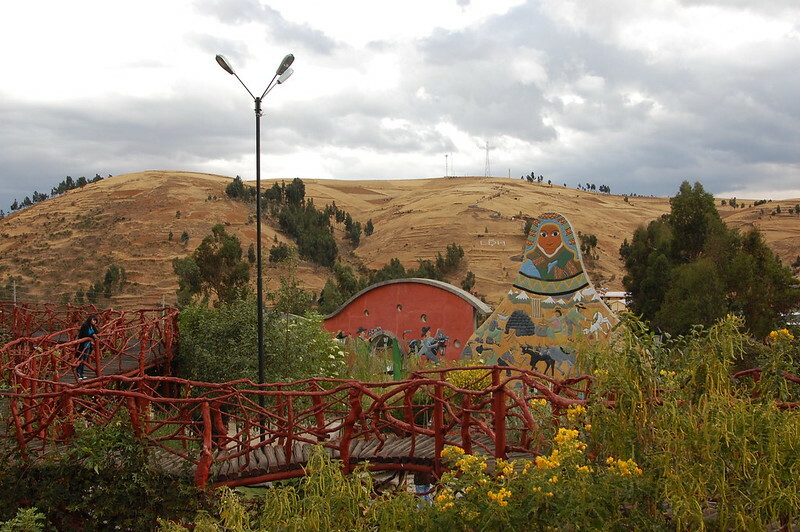 On my last day in Huancayo, I was determined to visit Parque de la Identidad Wanka, another creative park dedicated to the culture of the region. 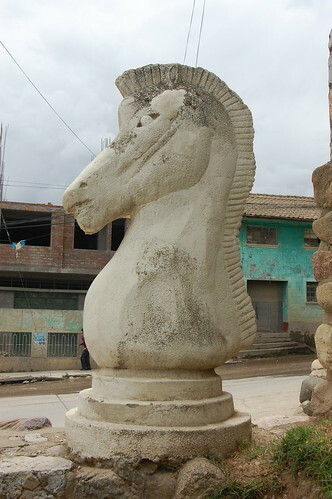 As I’ve mentioned (and as you’ll see in future posts), Huancayo and the Junín region represent a fascinating intersection of farmlands and agriculture, rich indigenous traditions, skilled master artisans, and remnants from the Spanish colonial era. 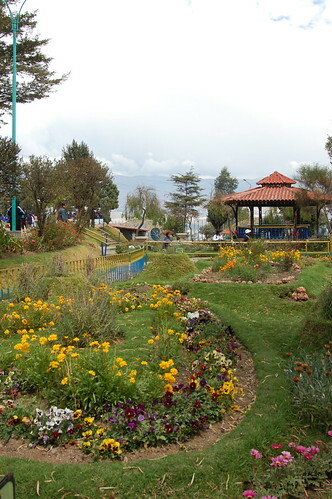 All of this comes together in the unique Parque a la Identidad Wanka, or Huanca, where all these aspects are celebrated. Other statues honor distinguished musicians, dancers, and even a photographer who are from this region. 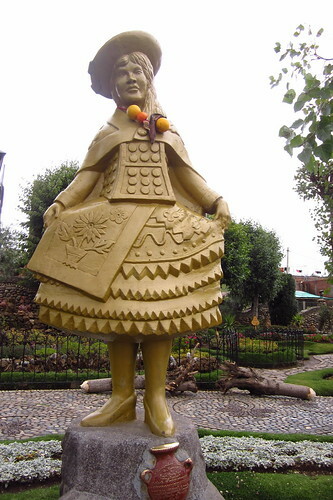 The Wanka influence on Peru’s folkloric traditions cannot be understated. 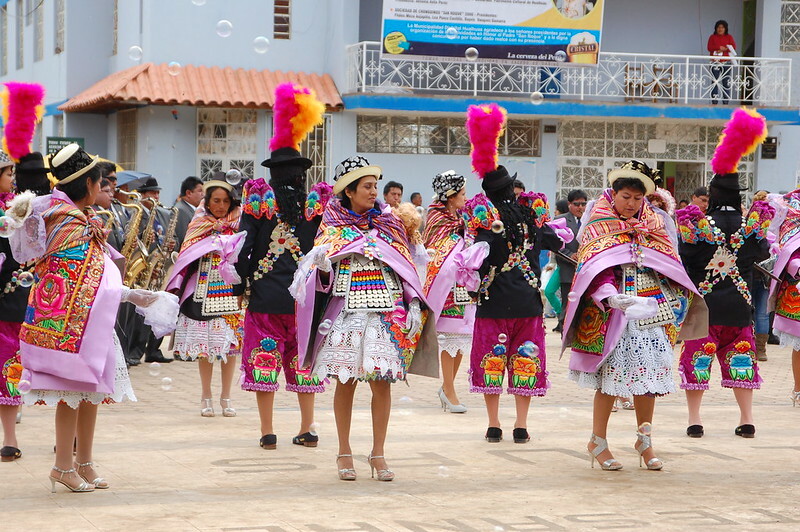 The huaylas dance is one of the most popular forms of huayno. Of course, we cannot forget the adorable sheep that you see throughout the countryside. 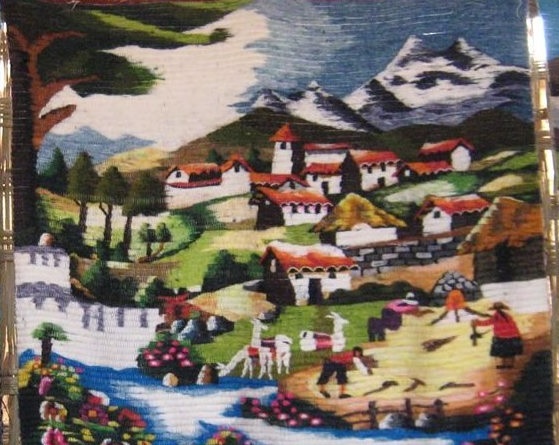 I love that the pastoral heritage of Huancayo and Junín is celebrated in art; I think it’s part of what makes this region so special. So cute. 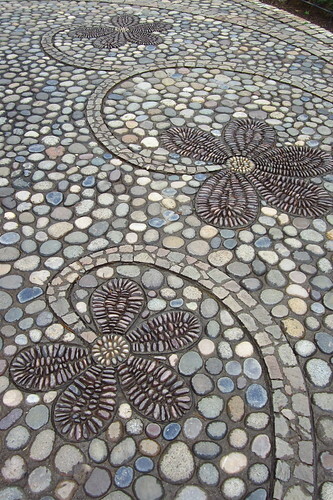 And check out the detail on these stone mosiacs! I’m just going to let the rest of the photos speak for themselves. Such a cool park with so many nooks and crannies to explore and appreciate. 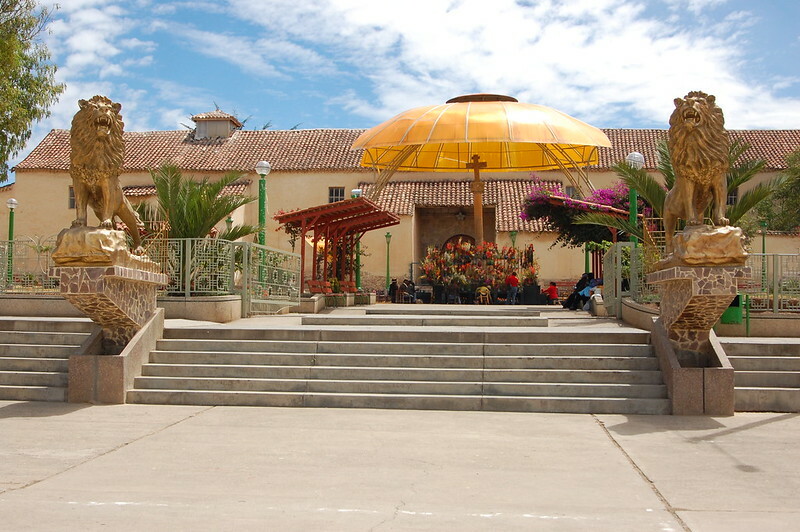 If you are planning a visit to Huancayo, I implore you to go the the Feria Dominical, or Sunday market, held in the center of town. Several streets close down to traffic and fill with stand after stand after stand of vendors selling their wares. The fair is so large that there are actually dedicated sections where you can find certain things sold together, such as clothes together, artesanía together, housewares, etc. Although I don’t have any photos from the fair, it was an amazing experience and some of my most treasured textiles are from this fair. 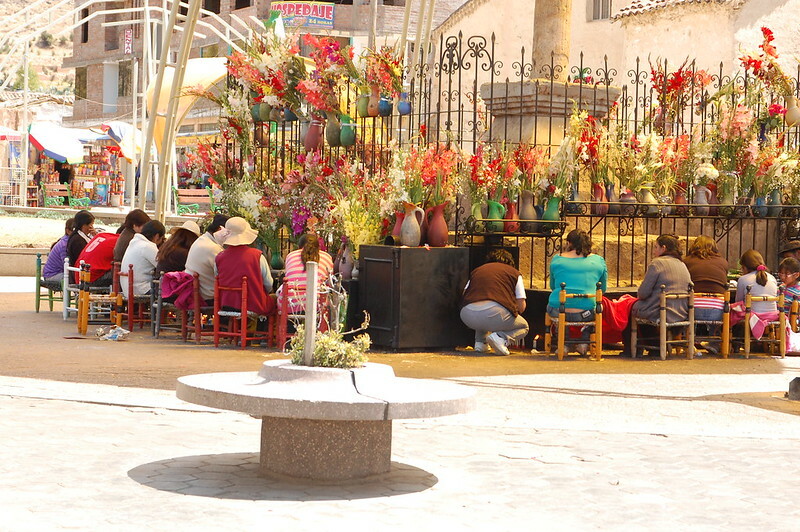 Artisans commute from Huancavelica, six hours away, in order to sell their art, as well as from nearby towns like Hualhuas. This means you have a selection of regional textiles and weavings sold by the artisans themselves. 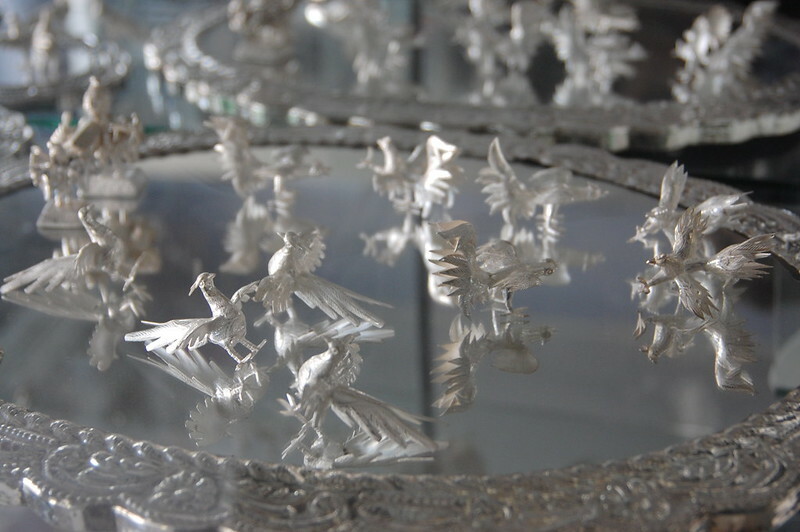 It takes some wandering among the stalls to find the best art, but many of the artisans have won awards for their art. I actually had already met a couple who had been invited to sell their wares in a special artisan fair in Miraflores in Lima; I recognized their high quality items and style! If you love Peruvian textiles and crafts, you need to go here to see all the amazing handmade pieces of art. 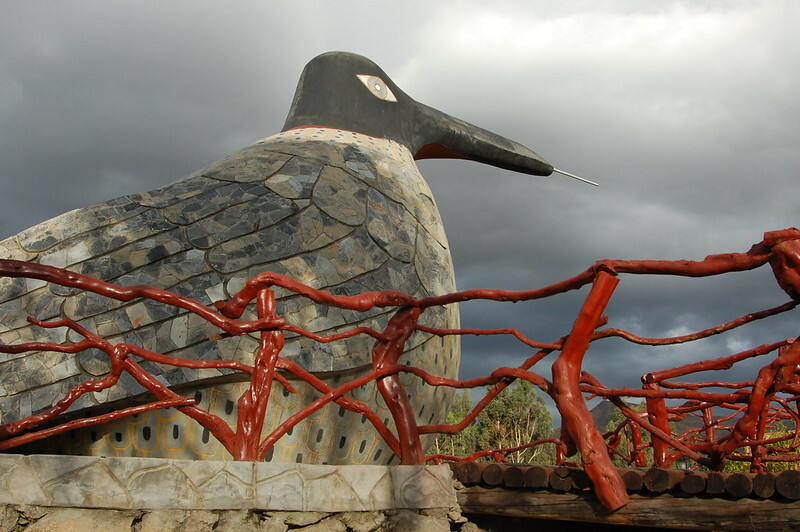 As you may already know, I tend to take my love for folk art to the next level and travel to the towns and regions where they originate whenever possible (such as Ayacucho and Huancavelica, of course), but if you’re short on time, planning to be in Huancayo on a Sunday is a very good idea. Huancayo is one of my favorite cities in Peru and I recommend that you go if you like independent travel and want to get a deeper insight into what life is like in the central Andes. 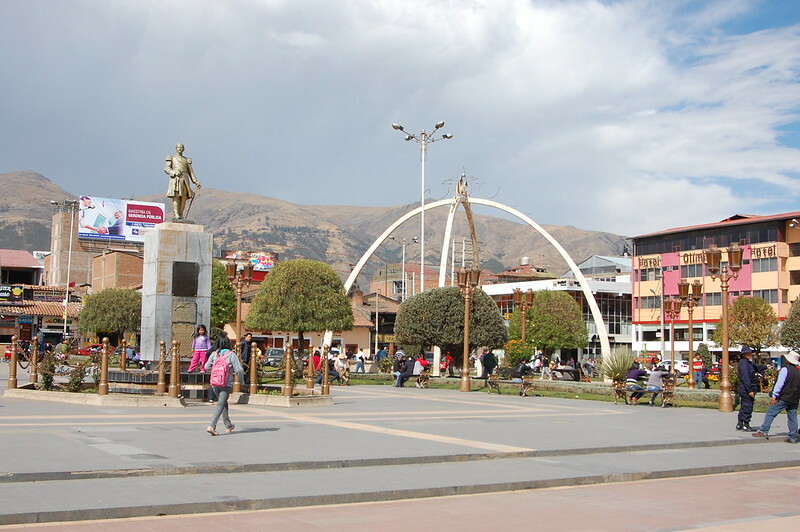 Because Huancayo is located on the Carretera Central (central highway), it is super easy to get around using public transportation. 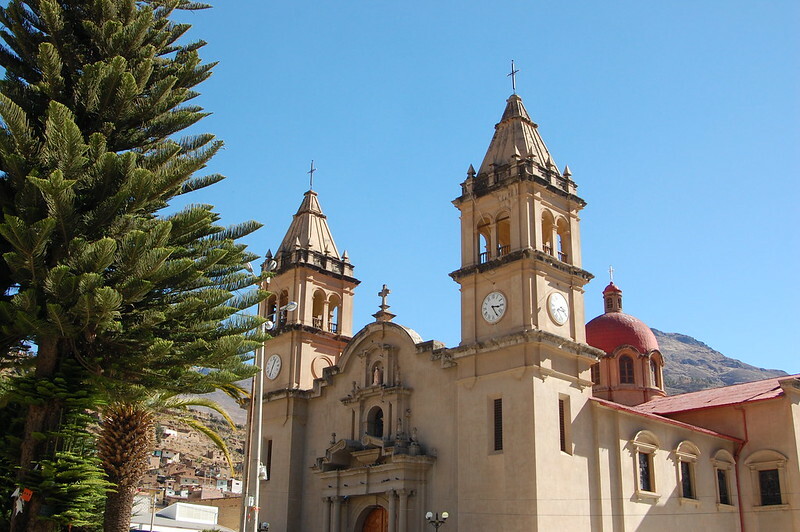 Huancayo is also a central hub for regional destinations and easily accessible from Lima. 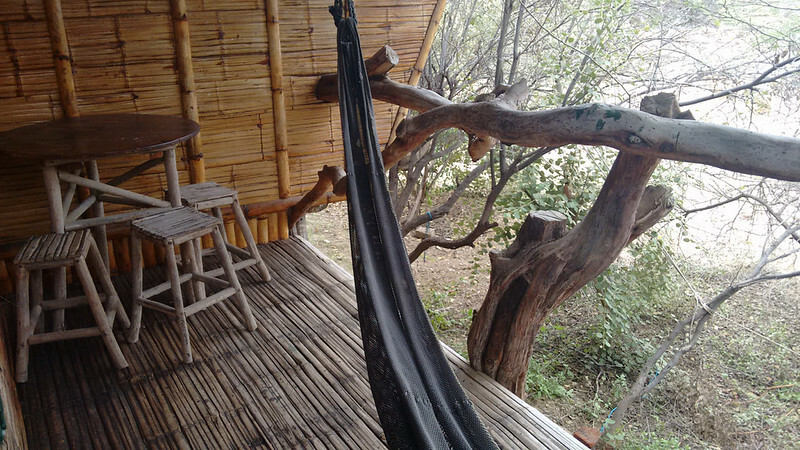 I stayed at Hostel Samay, a family run guesthouse located about eight blocks from the center of Huancayo. 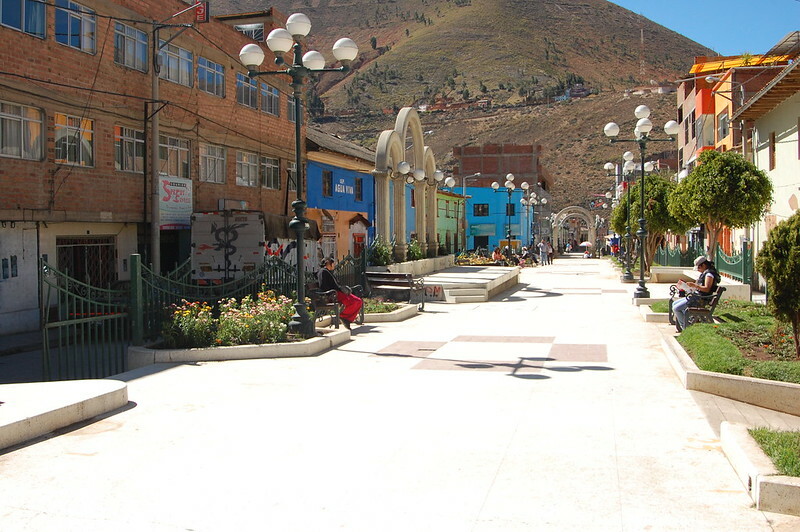 It is totally walkable and is close to the Real Plaza Huancayo for ease of access to the supermarket as well as the public buses. 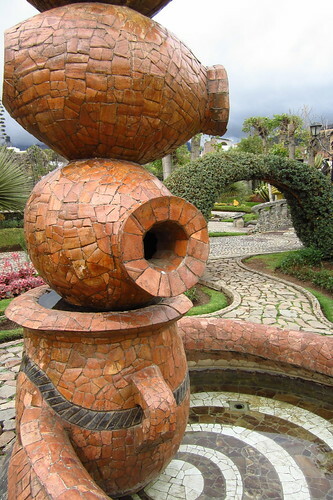 It is located near the Cerrito de la Libertad and Torre Torre. I stayed there for a week and got to know the family and would recommend this hostel if you want to feel looked after and get great insight into the history and culture of the region. As a vegetarian, I ate at Govinda’s Restaurante Vegetariano several times. There are other vegetarian restaurants but this one is located near the main plaza and has lots of seating. 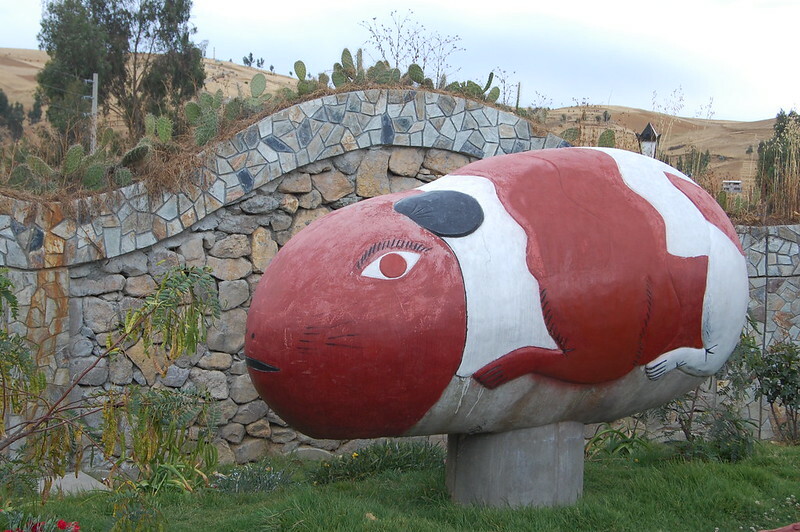 Be sure to eat papa a la huancaina while in Huancayo. This potato dish with a creamy cheese sauce is typical of the region. If you visit in winter, be sure to drink a calentito at one of the local bars. Interestingly, the windows of the bars are blocked from the street so no one can see who’s drinking inside. 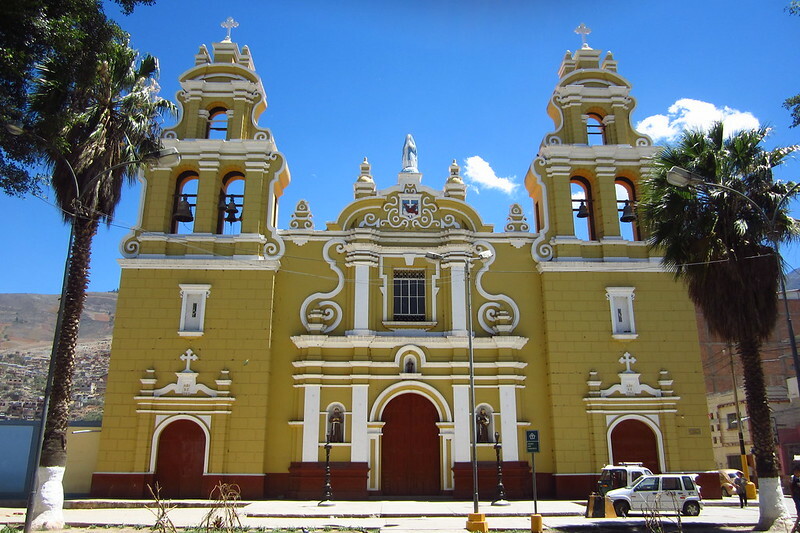 I traveled extensively on combis (local buse) throughout Huancayo and the Junín region, and future posts will detail some of the towns you can visit to expand your understanding of the region. 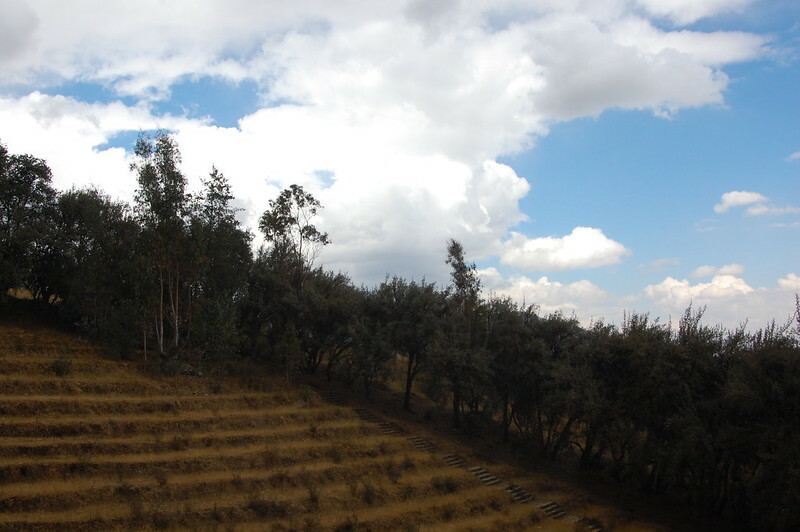 If you can, take the Tren Macho to or from Huancavelica. It’s a unique experience and the safest, easiest way to travel between the two cities. 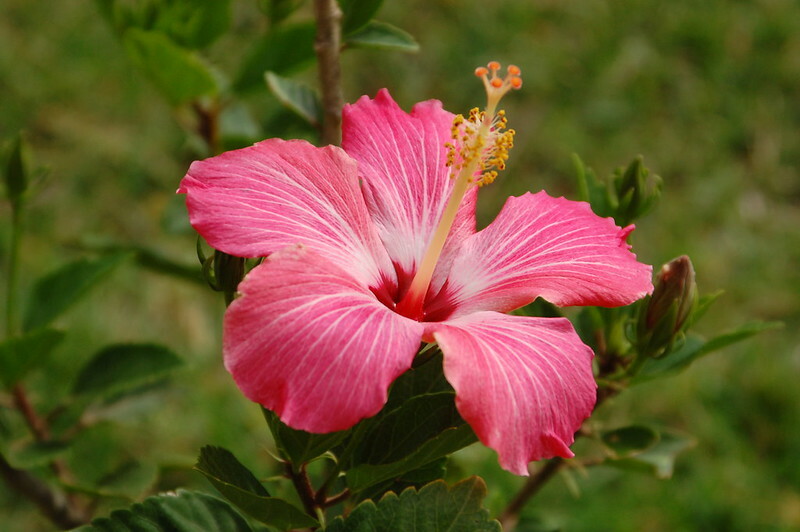 Be sure to check out the Feria Dominical on Sunday. If you love artesanía, you won’t regret it. 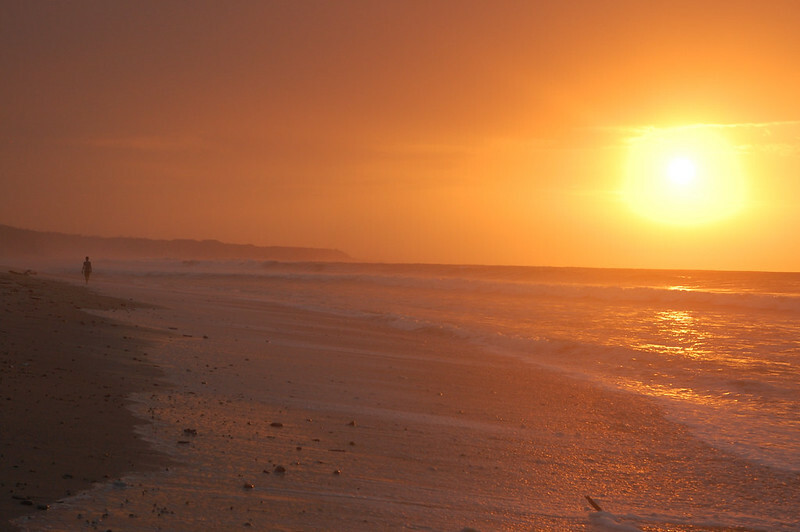 For great photos of Torre Torre from some daredevil travelers, read this blog post. 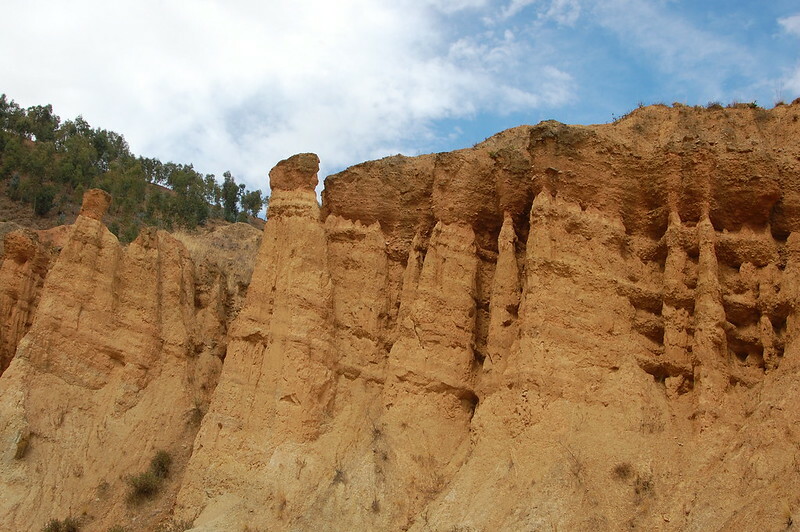 If you read Spanish, this blog post has excellent information about the Huancayo parks (and great pictures if you don’t!). This is an interesting article about the huaylas dance (in Spanish). 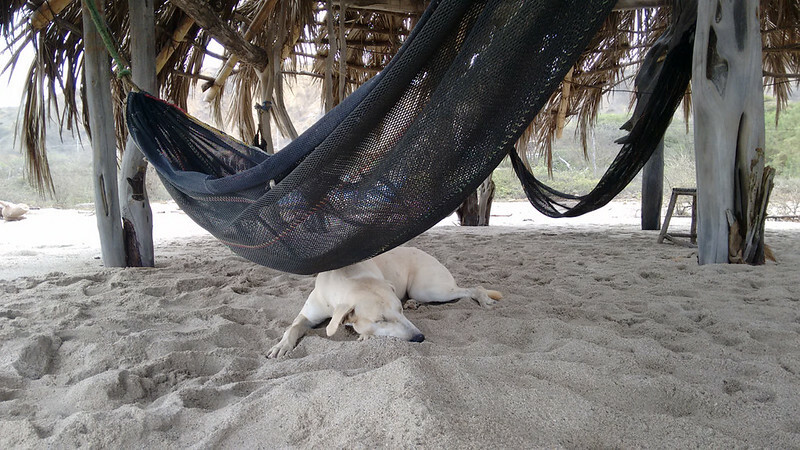 This is a well-written blog documenting an American couple’s temporary residence in Huancayo, with great photos of their life and travels around the region. 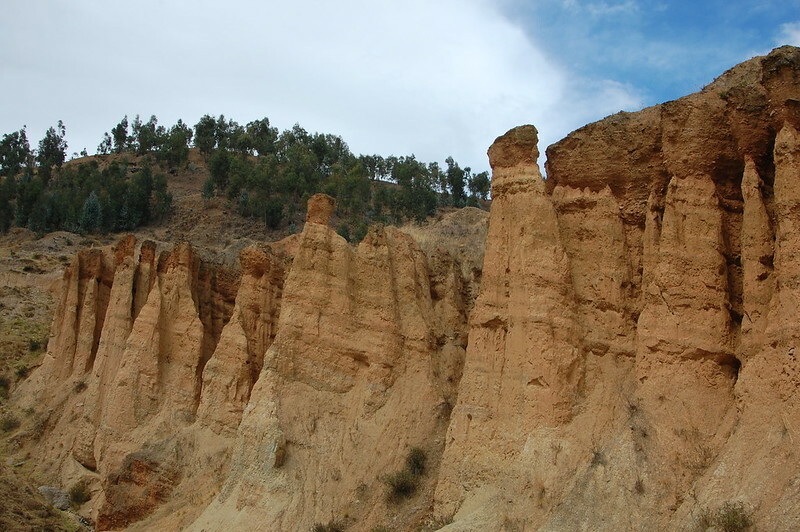 There are lots of possible day trips from Huancayo. 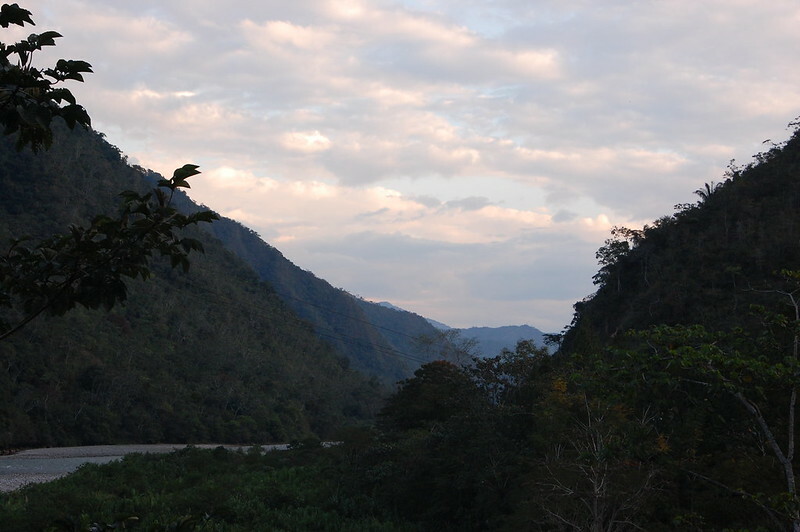 I went to Paccha, the Bosque Dorado, and Cochas Chico to see the mates burilados and took myself on a self-guided tour of the Mantaro Valley, visiting Hualhuas, San Jerónimo de Tunan, Concepción, and Santa Rosa de Ocopa. Check out that post for more info on other places to see nearby. 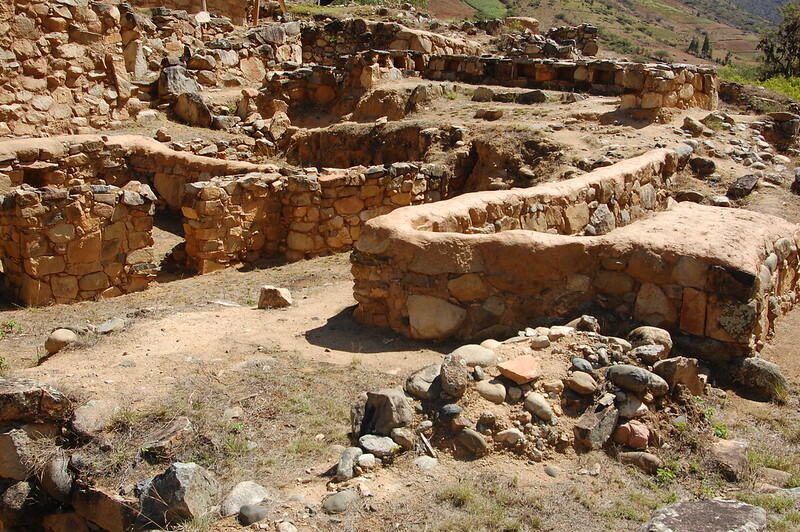 I also visited the Wariwillka ruins at Huari and the tiny historical town of Chongos Bajo. If you want to take a tour, you can see more in one day. 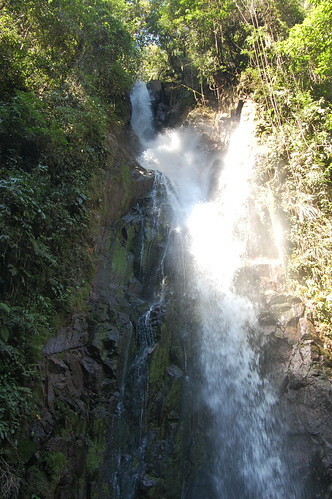 A lot of Peruvian tourists decide to see the Huaytapallana Glacier, visit Laguna de Paca or Laguna de Nahuinpuquio, or make it up to Jauja and the ruins at Tunamarca. I saw quite a lot, but would have seen more if it hadn’t been raining so much! 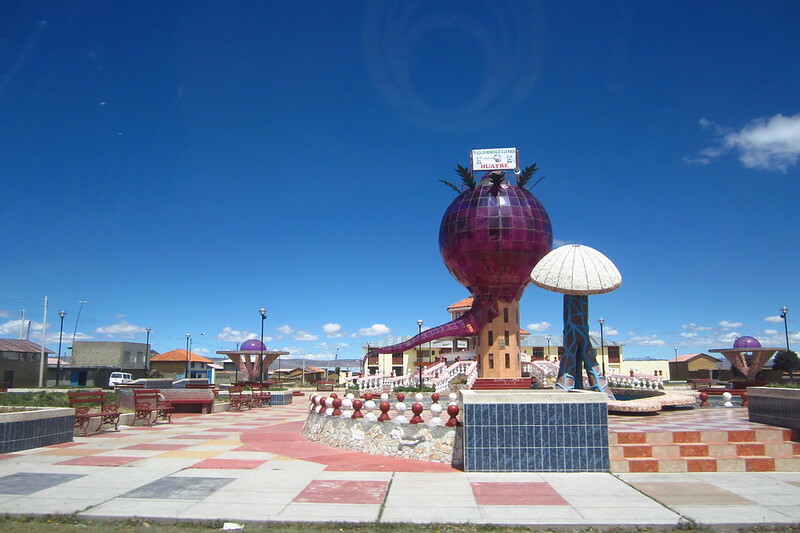 Leaving Huancayo, many people visit Tarma, also in Junín, or take the Chanchamayo jungle tour. 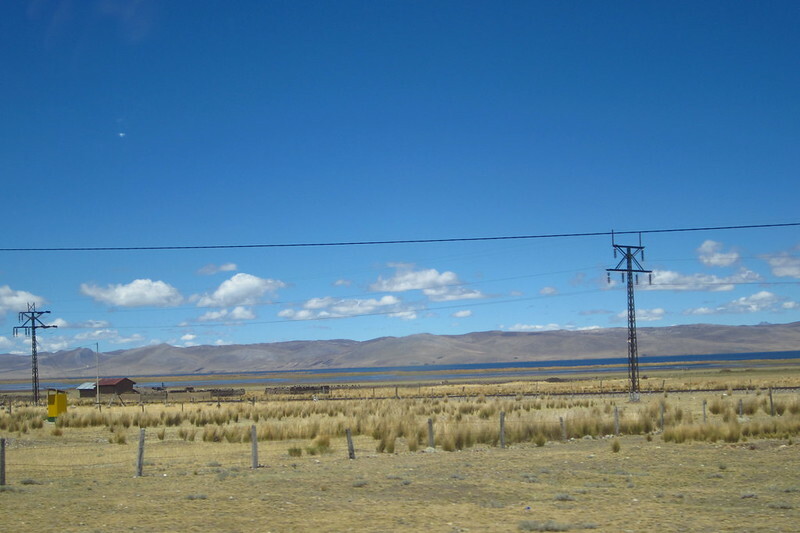 I headed to Huánuco. 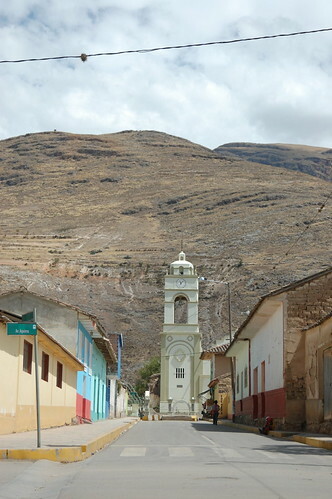 If you haven’t seen Huancavelica at this point in your trip, you should find your way there! 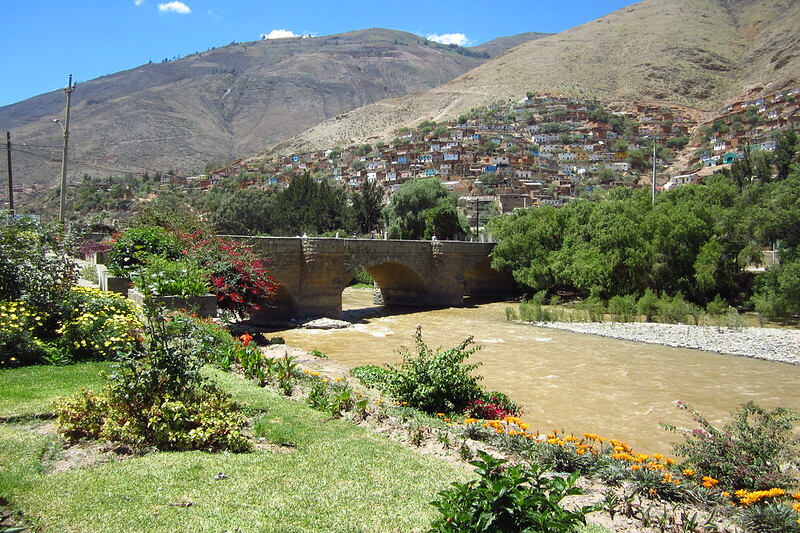 There is a lot of useful, up-to-date information on the Huancayo Wikitravel page.